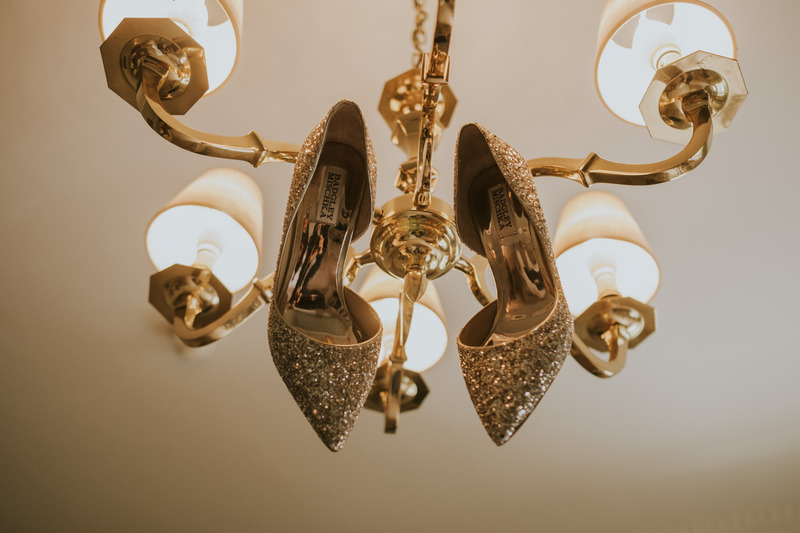 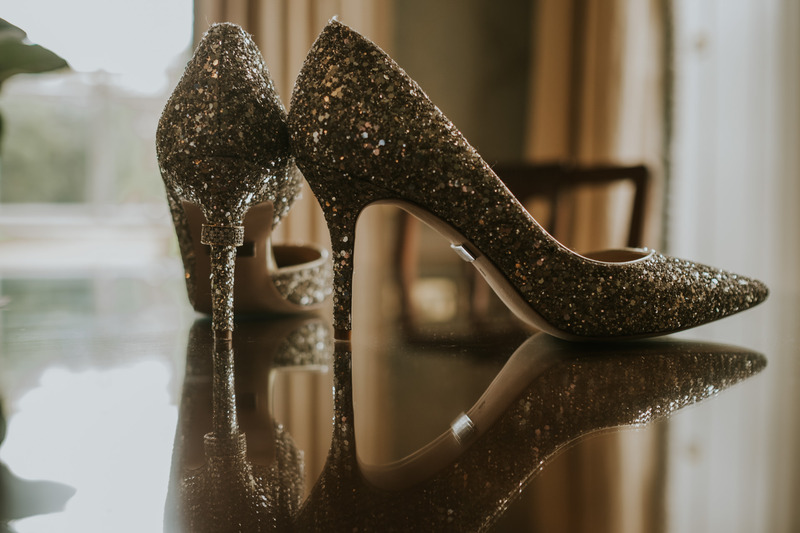 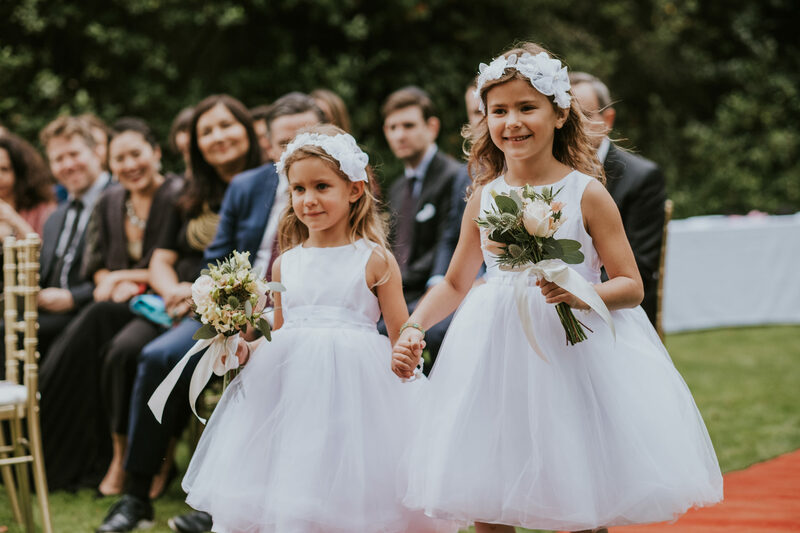 Sarah and Michael’s spectacular Mount Juliette Estate Wedding was as unique as it was joyful. 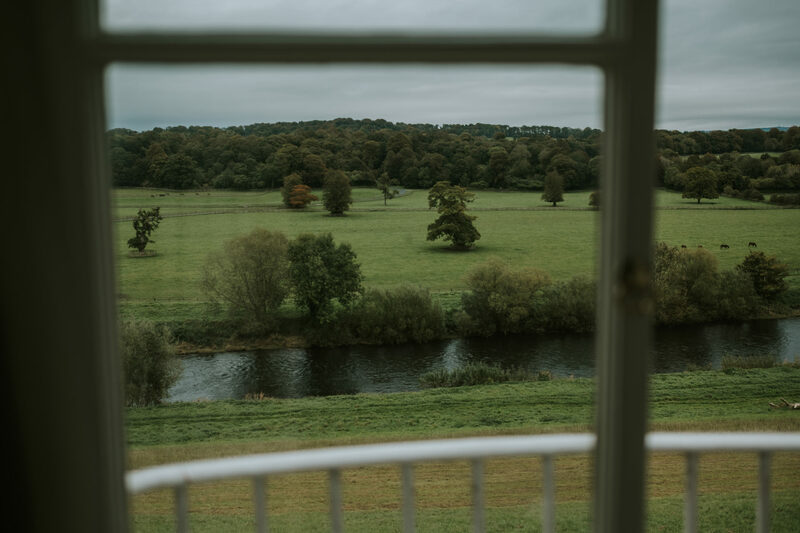 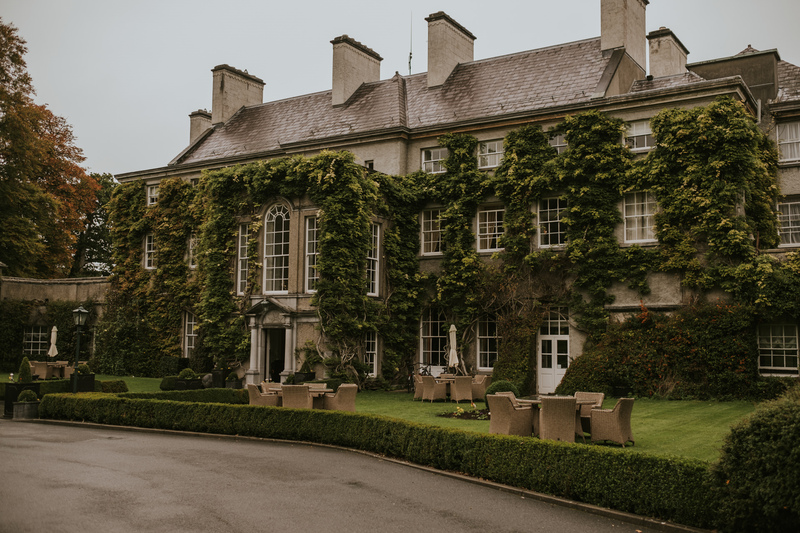 Mount Juliet is one of Irelands last surviving walled estates, nestled amidst 1500 acres of sprawling land and forestry and manicured grounds. 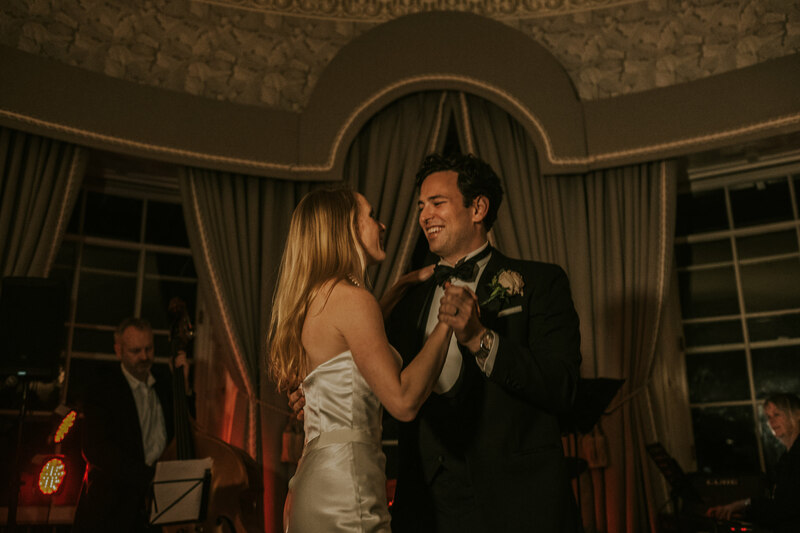 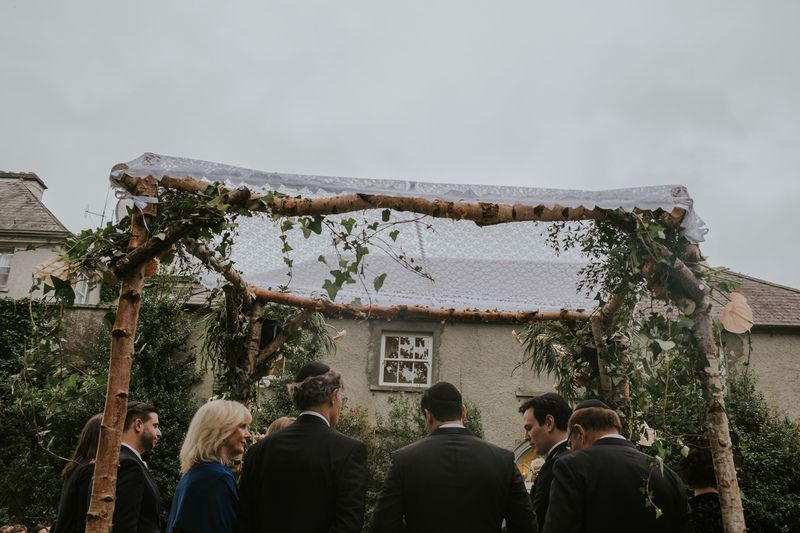 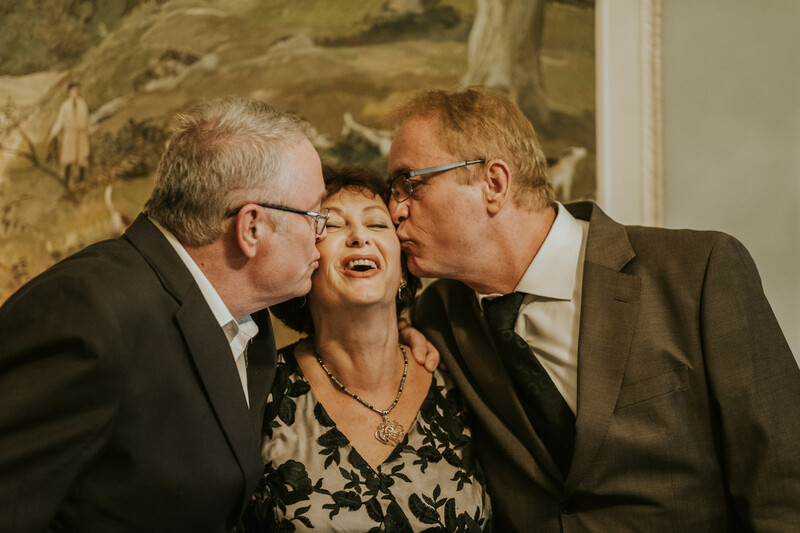 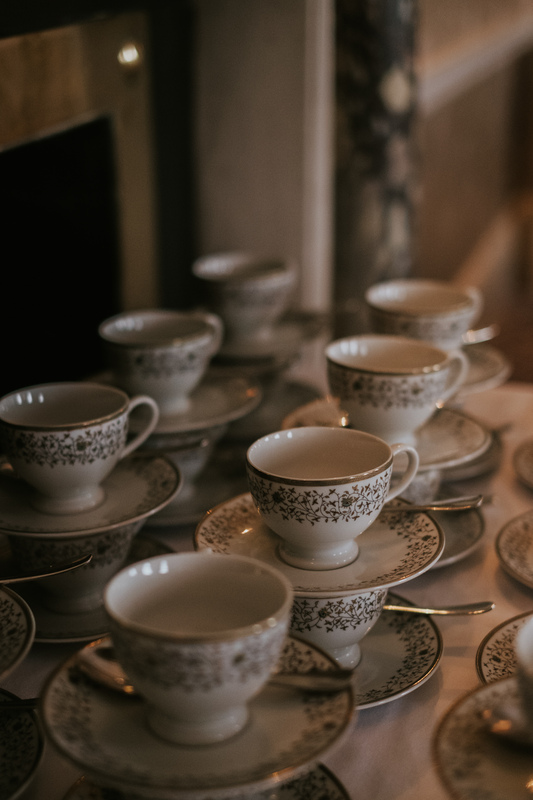 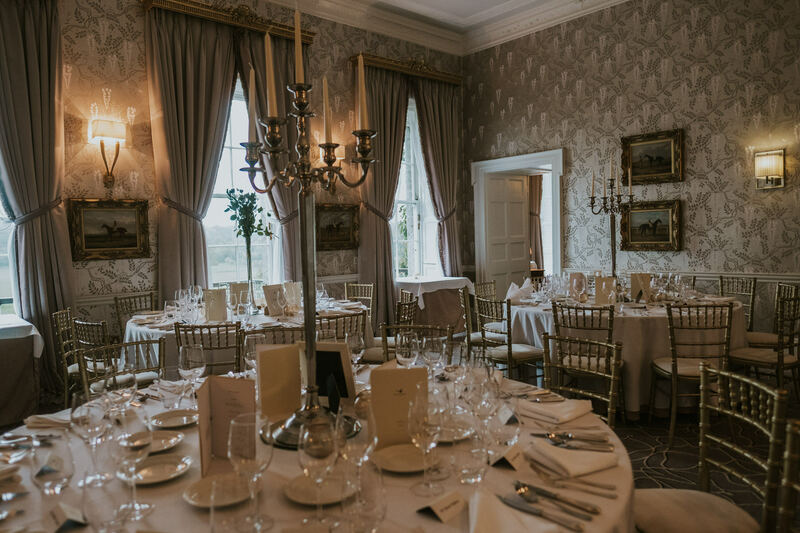 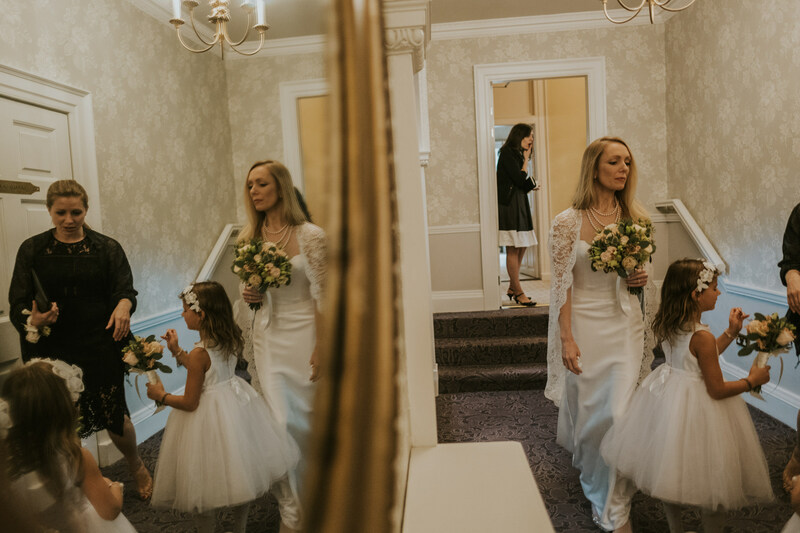 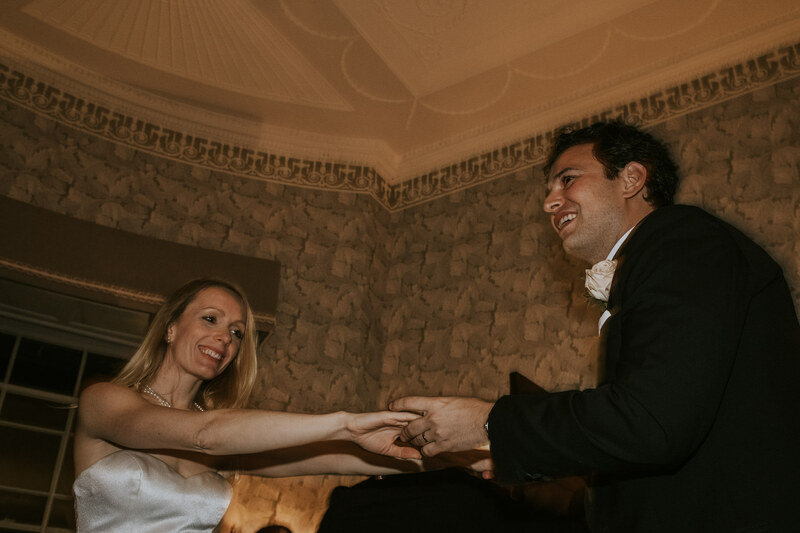 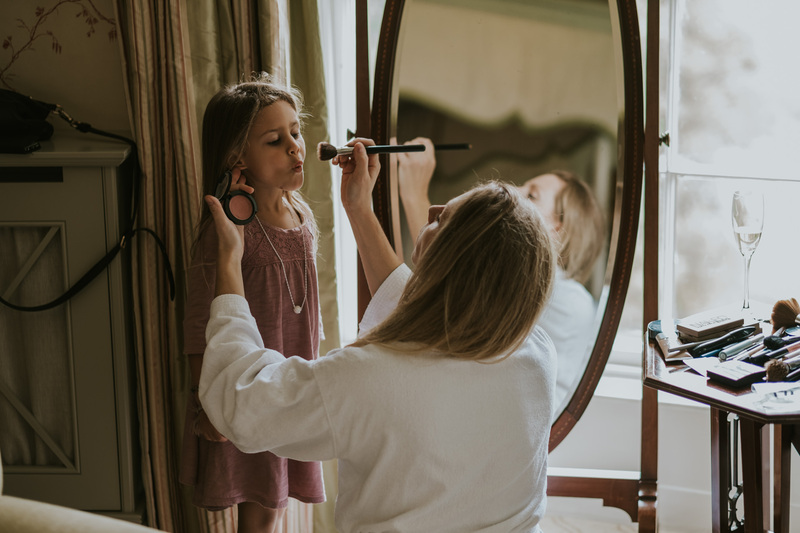 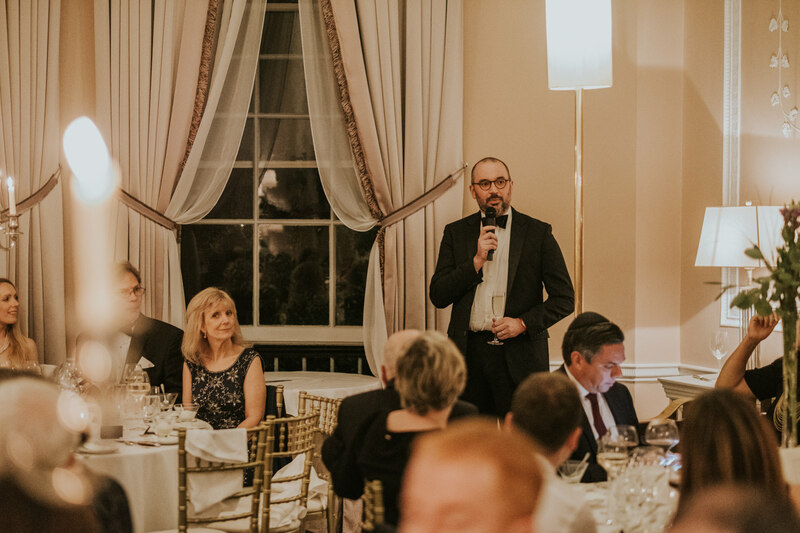 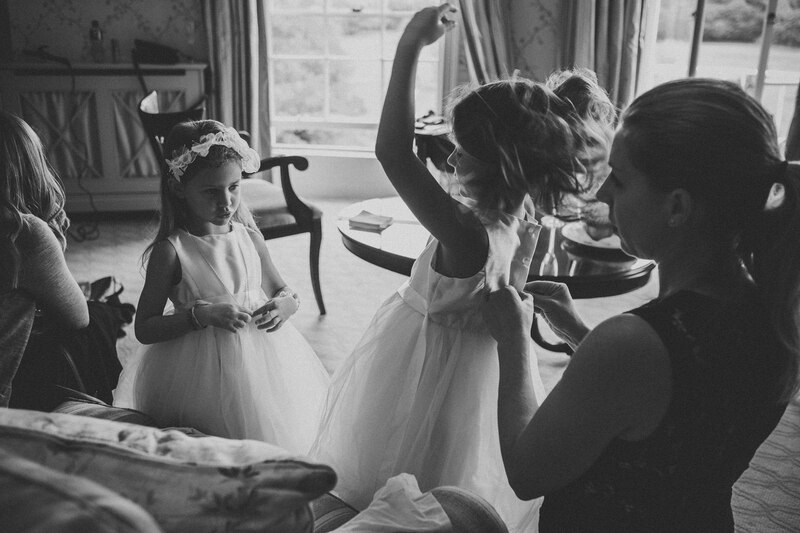 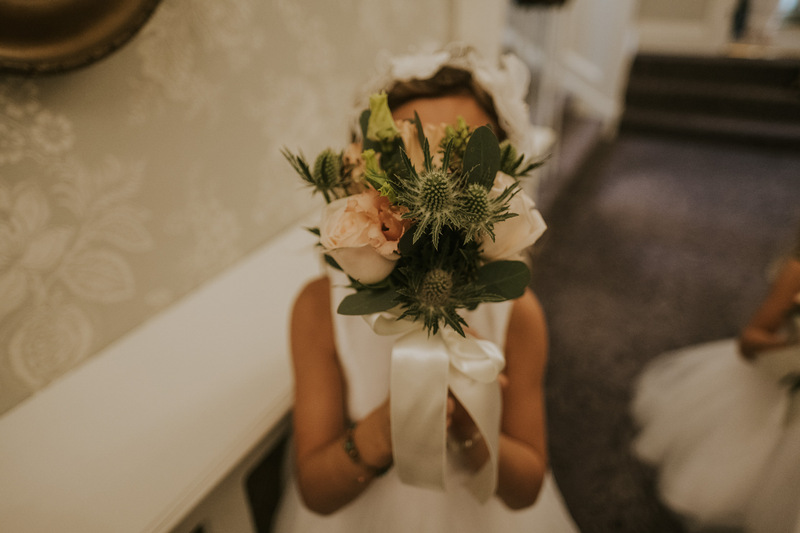 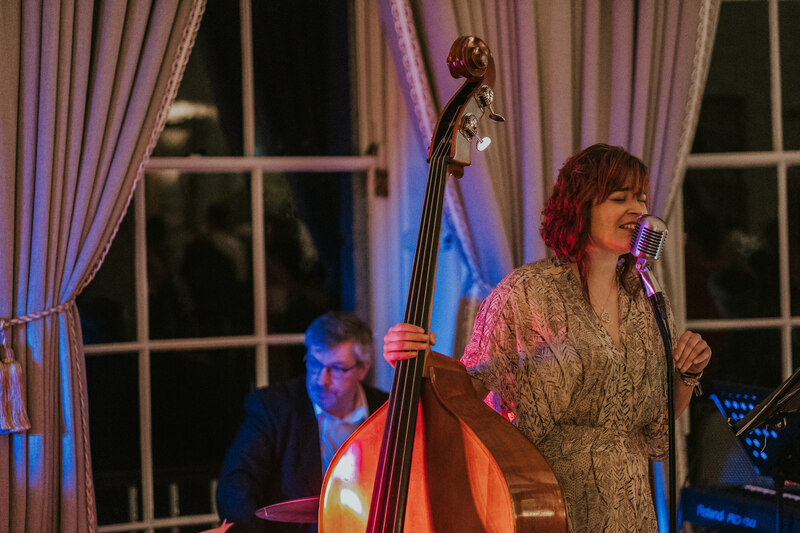 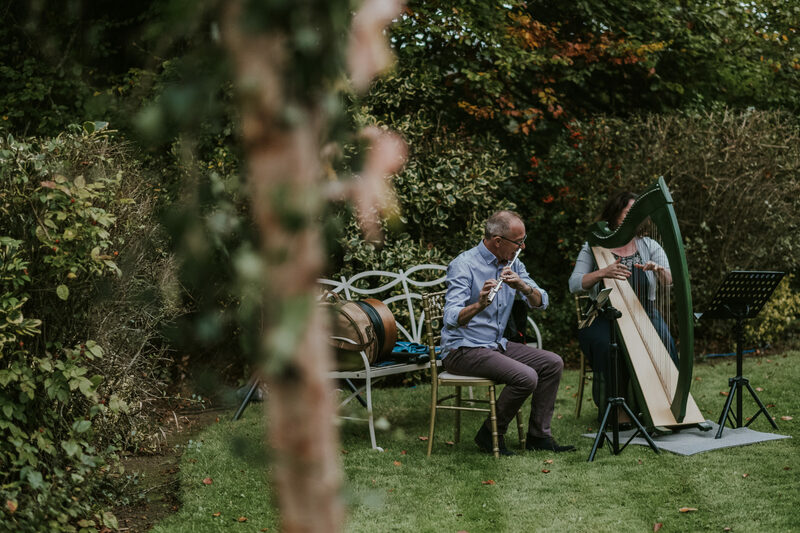 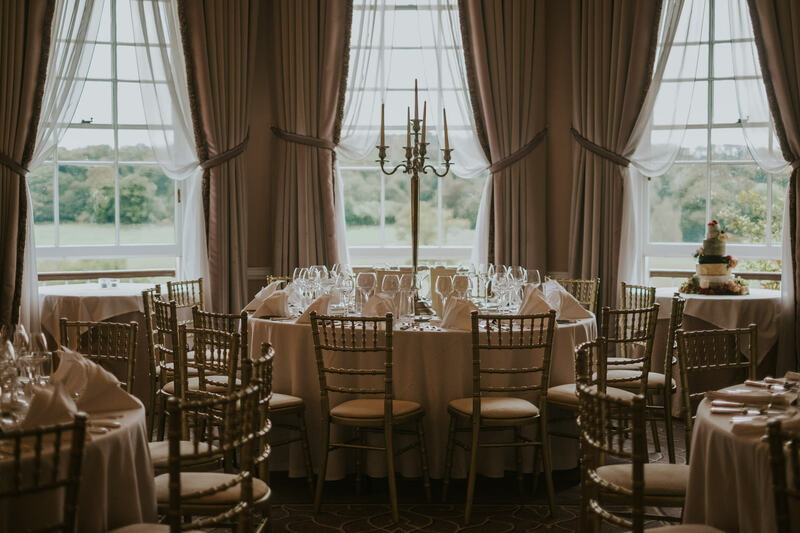 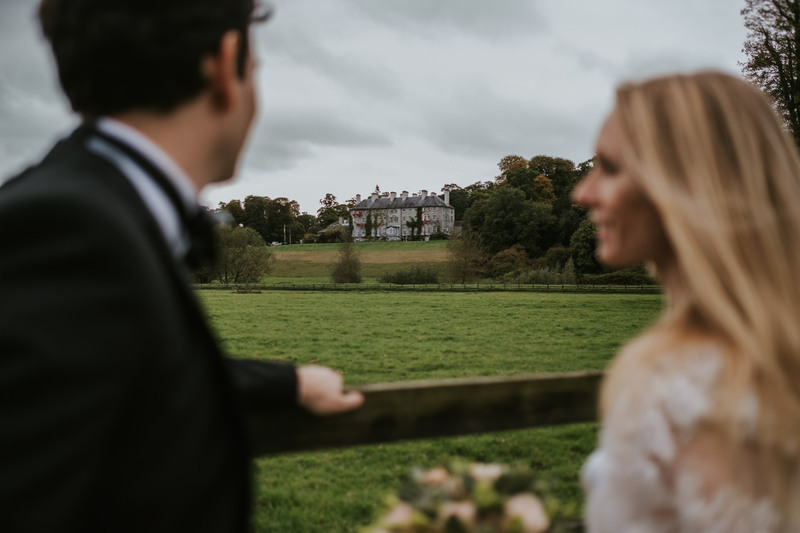 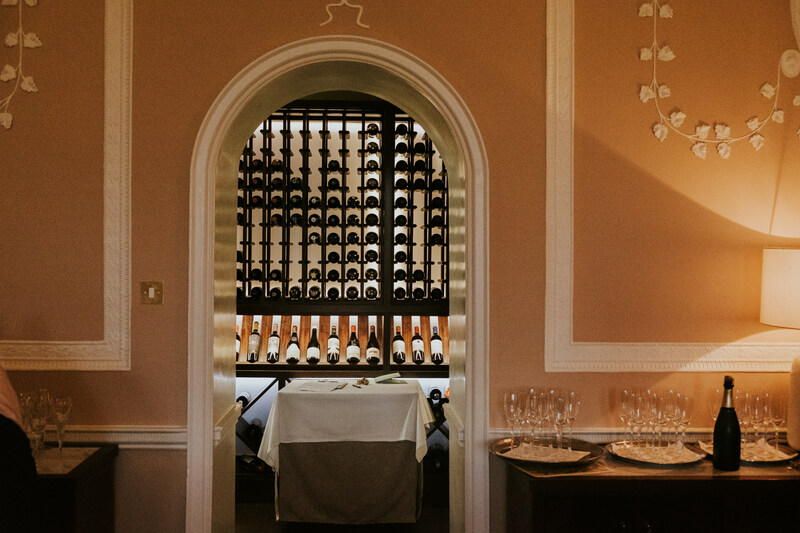 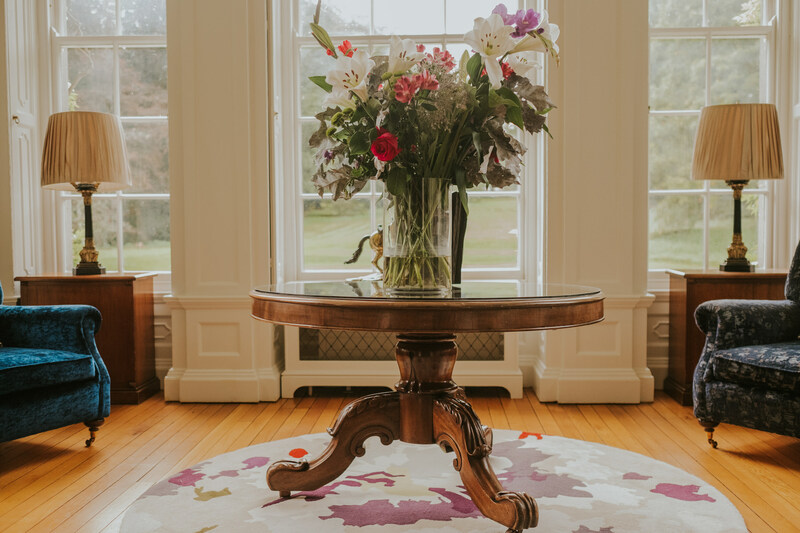 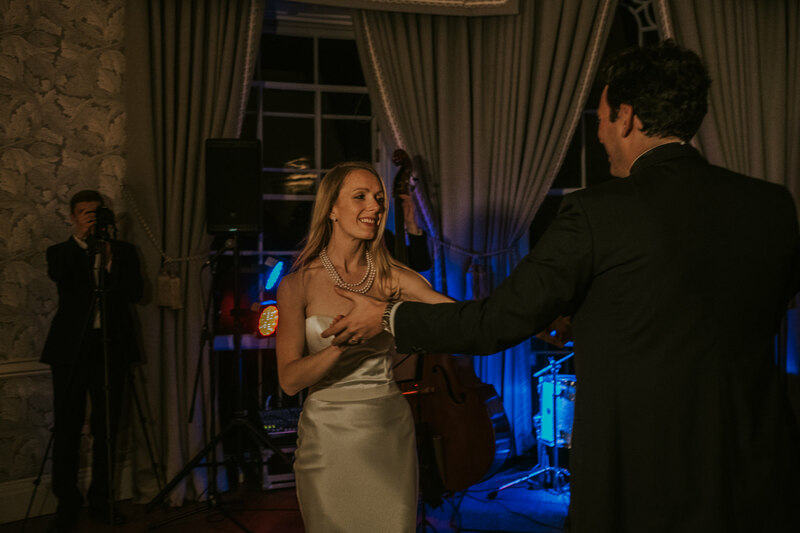 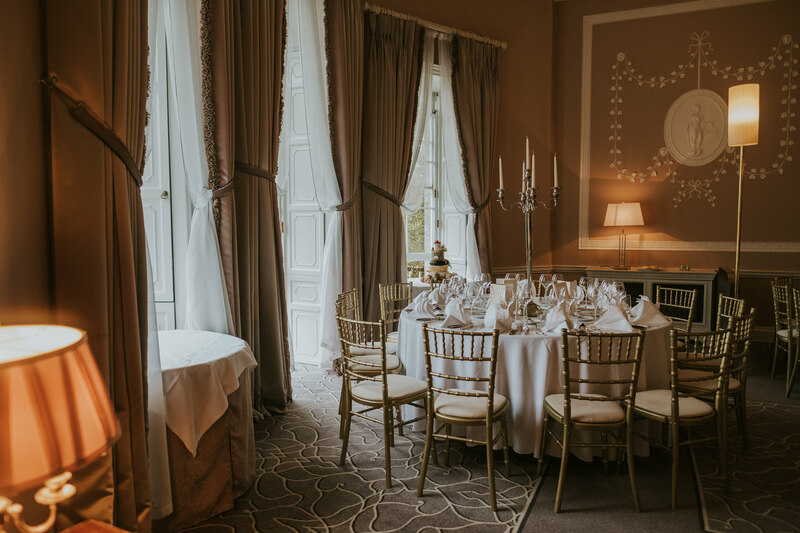 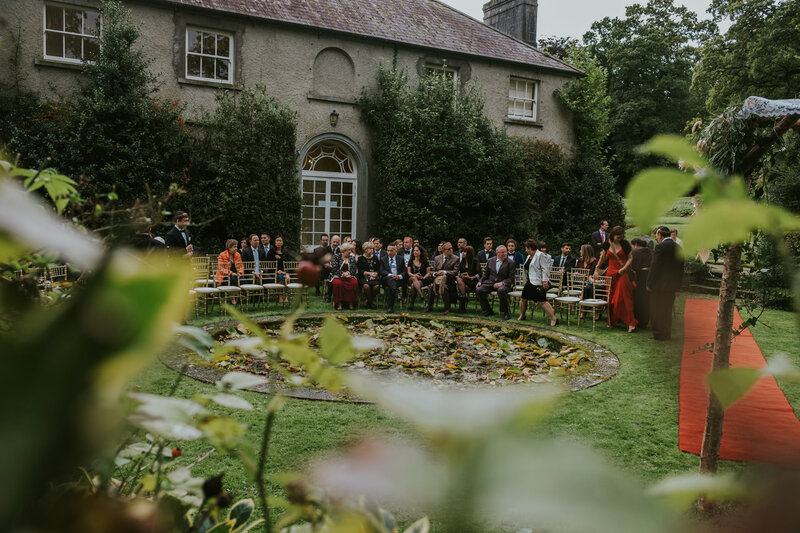 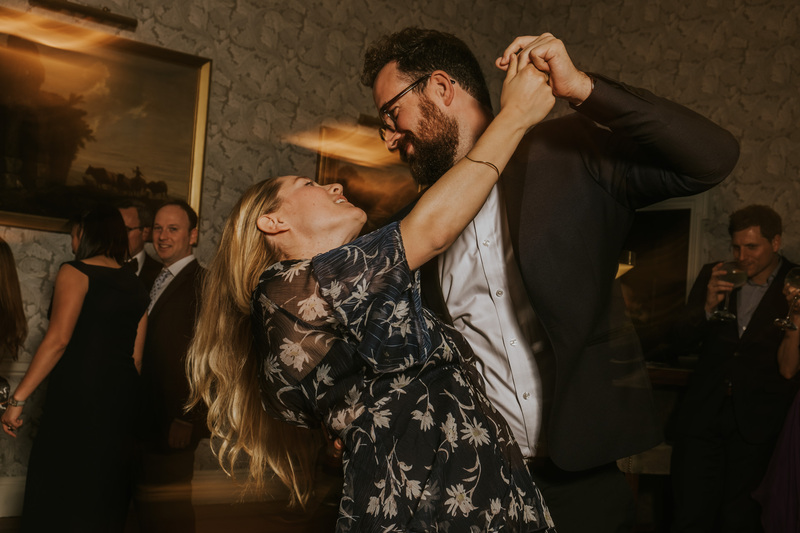 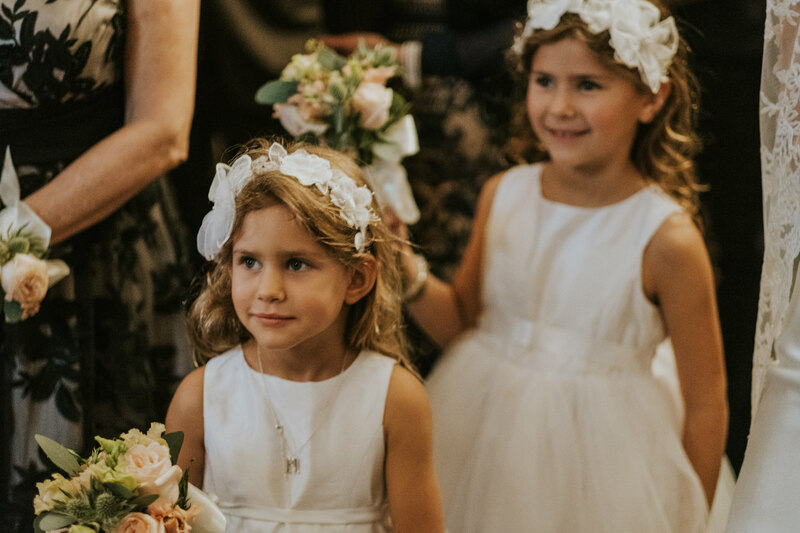 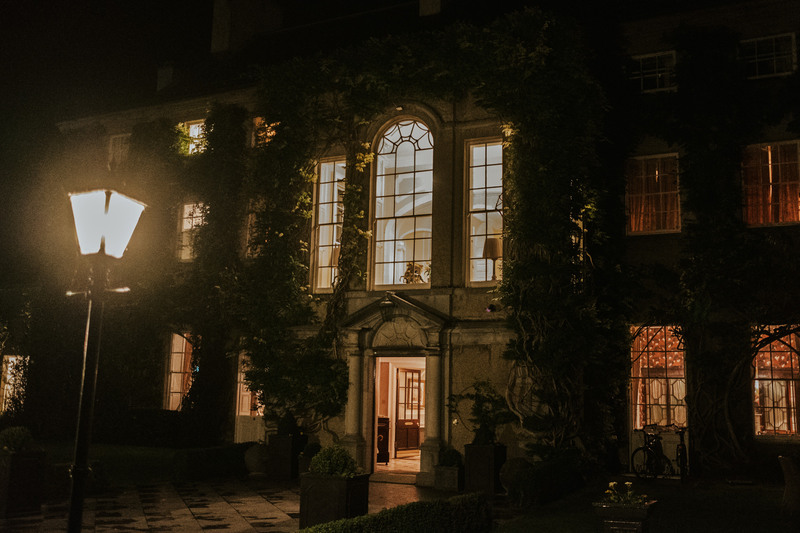 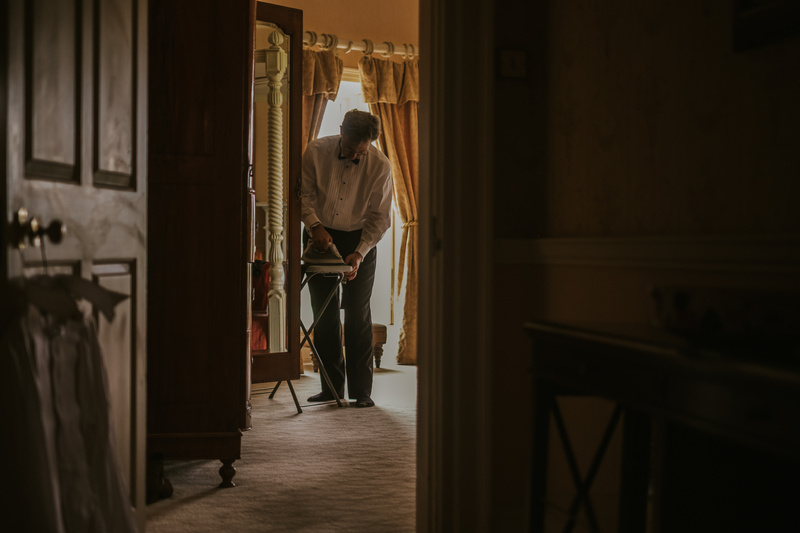 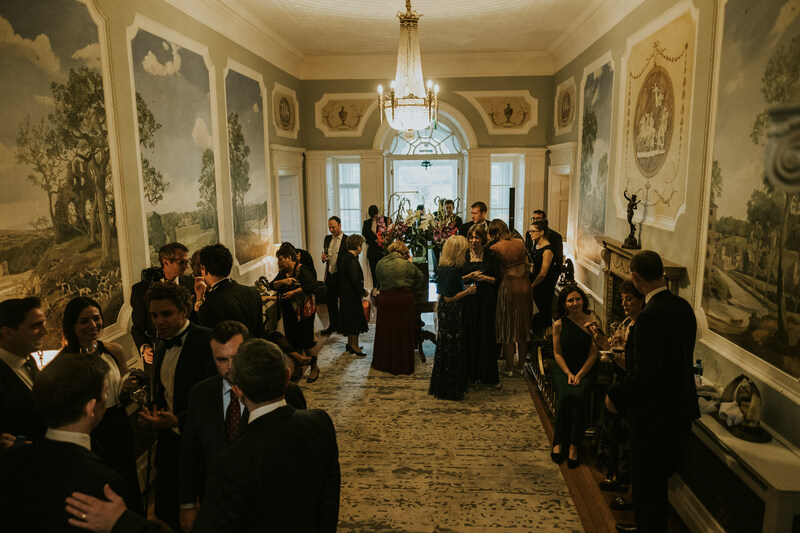 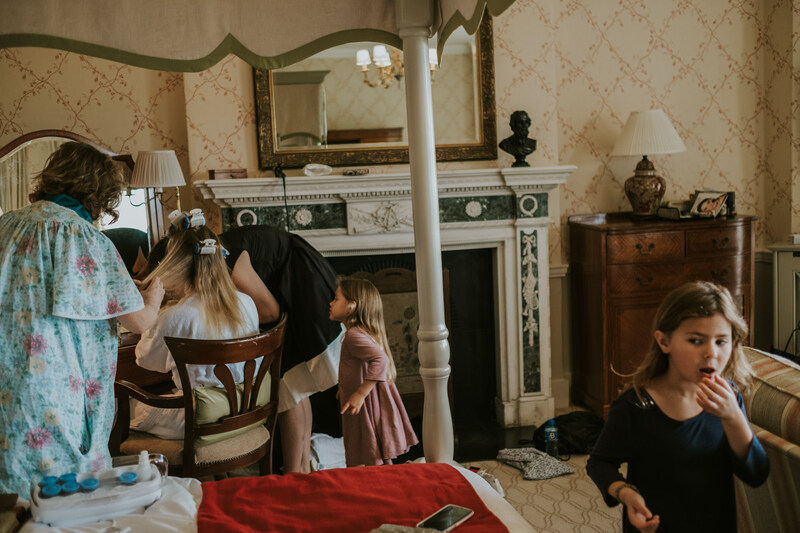 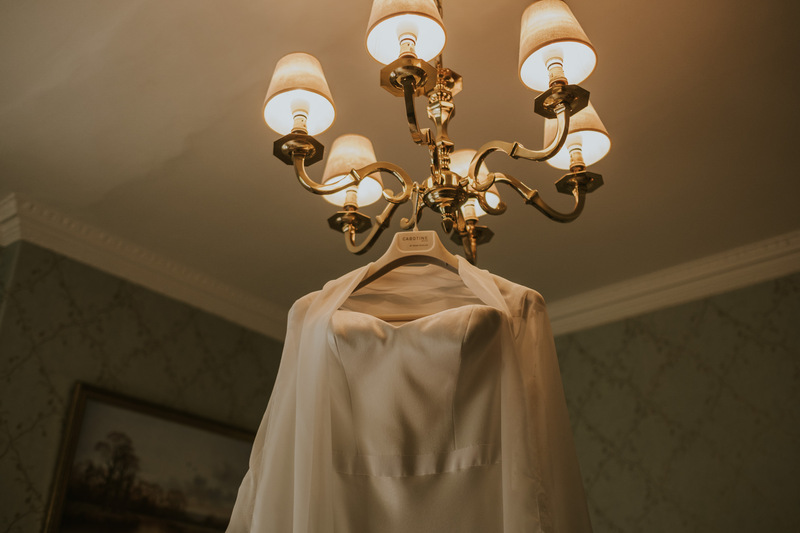 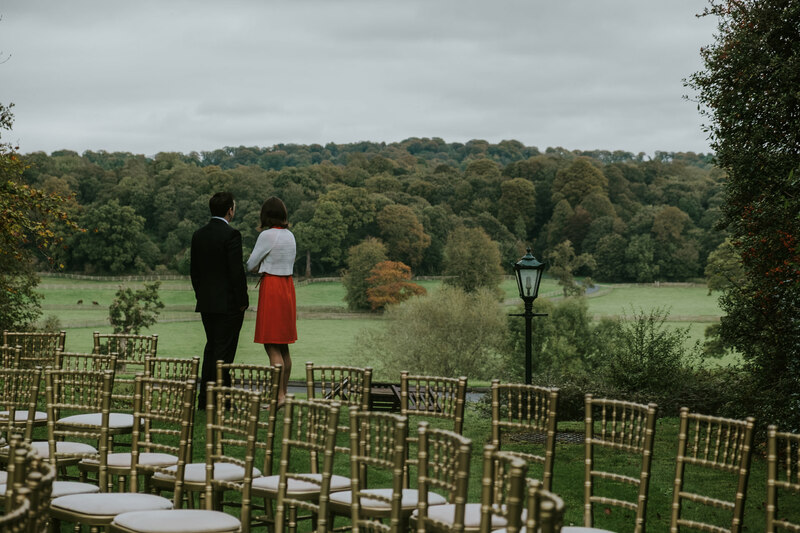 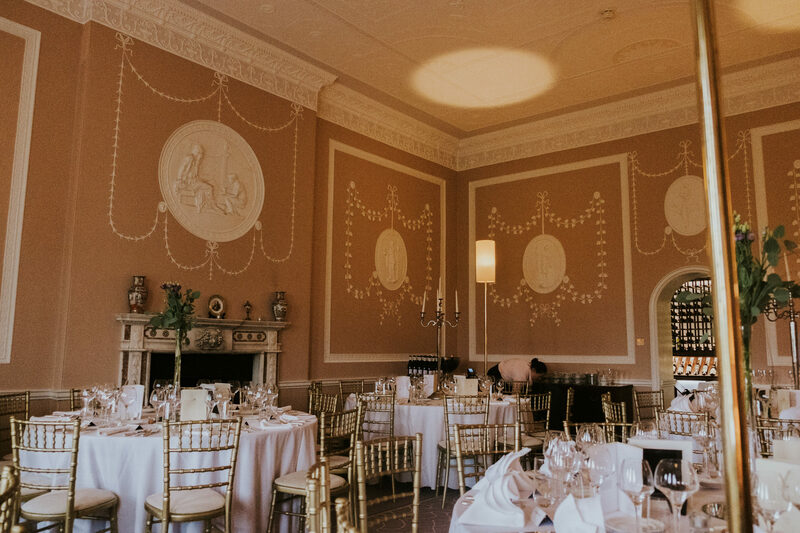 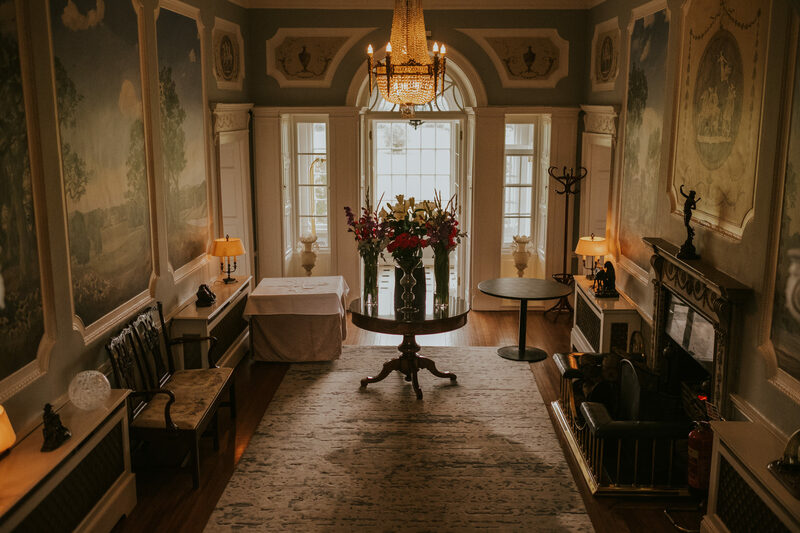 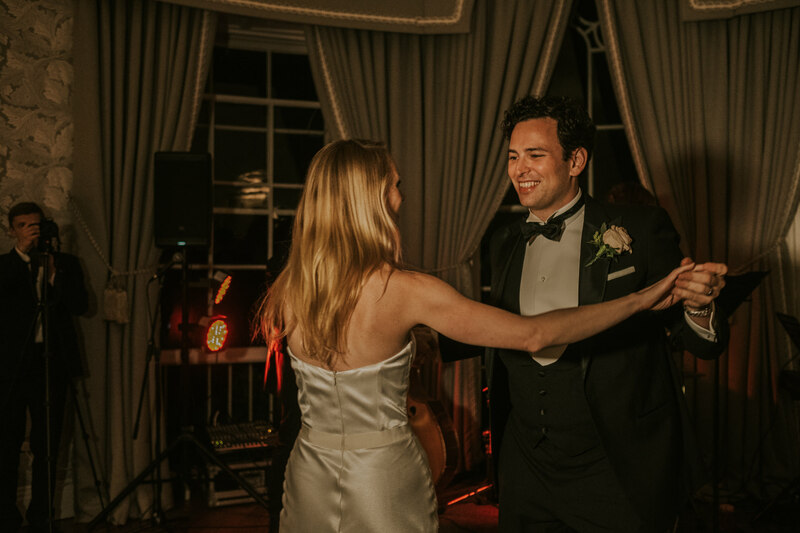 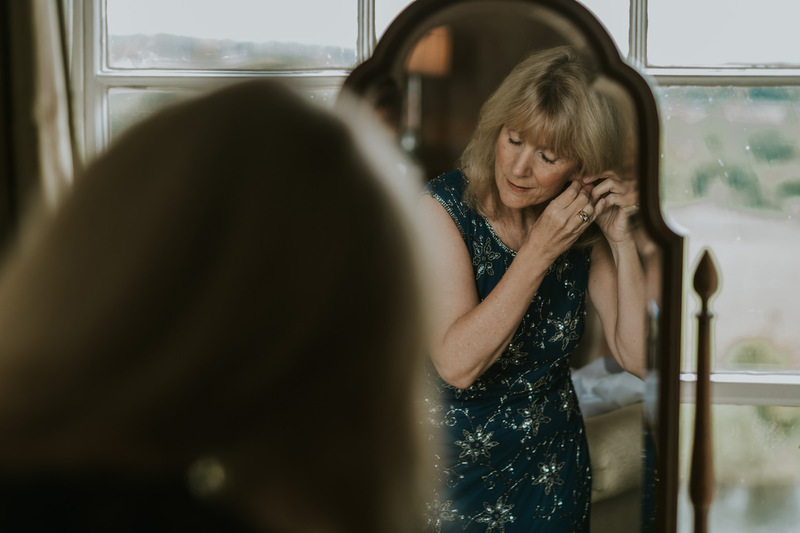 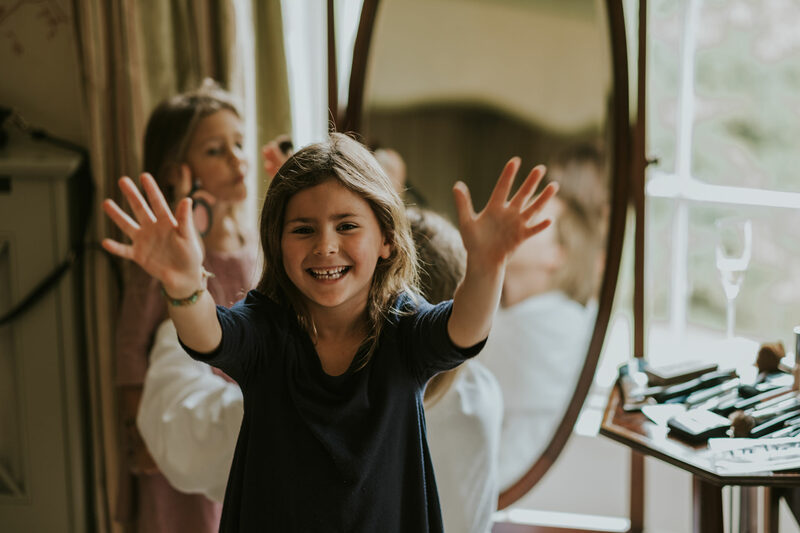 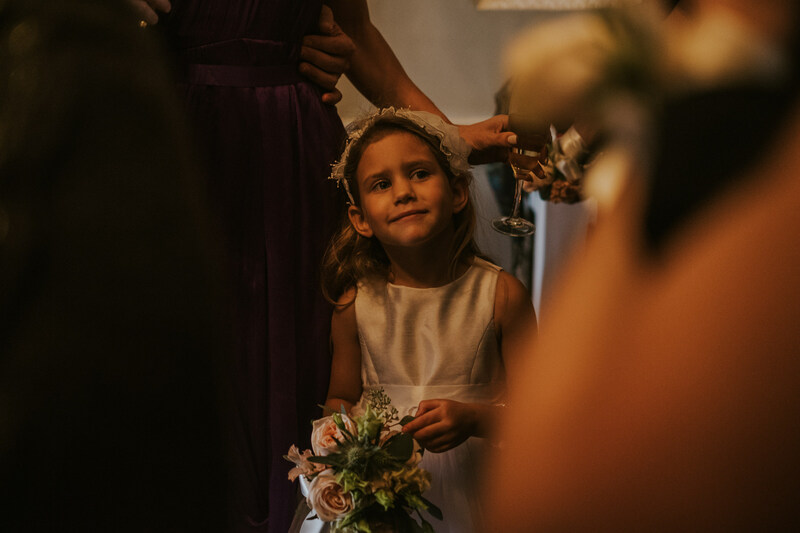 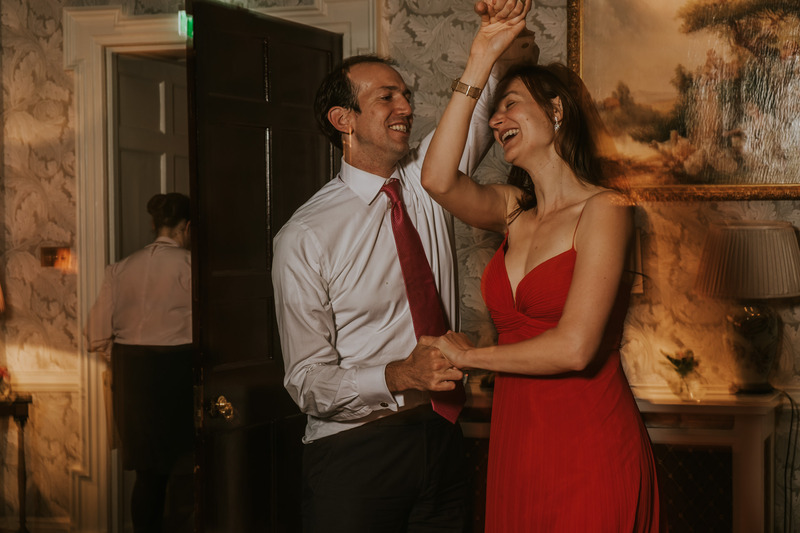 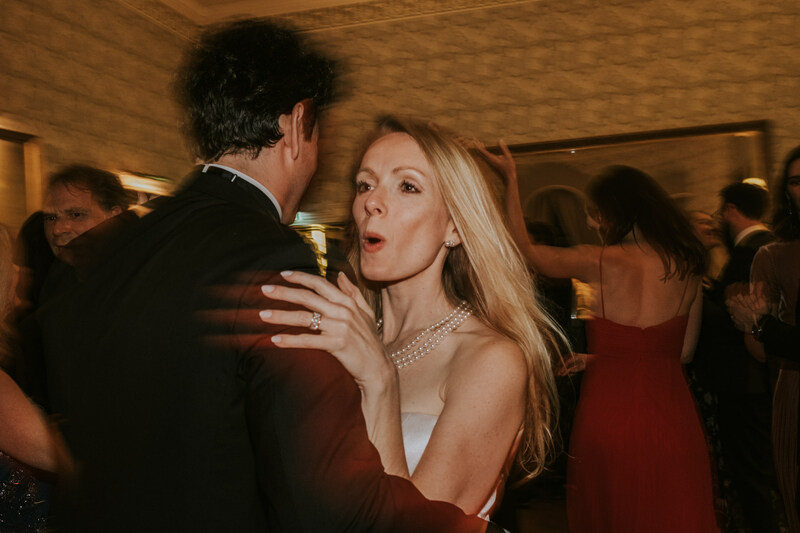 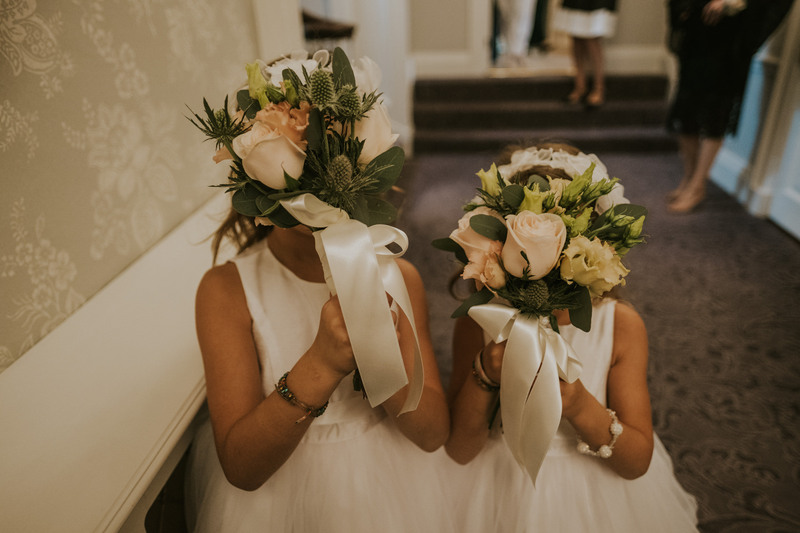 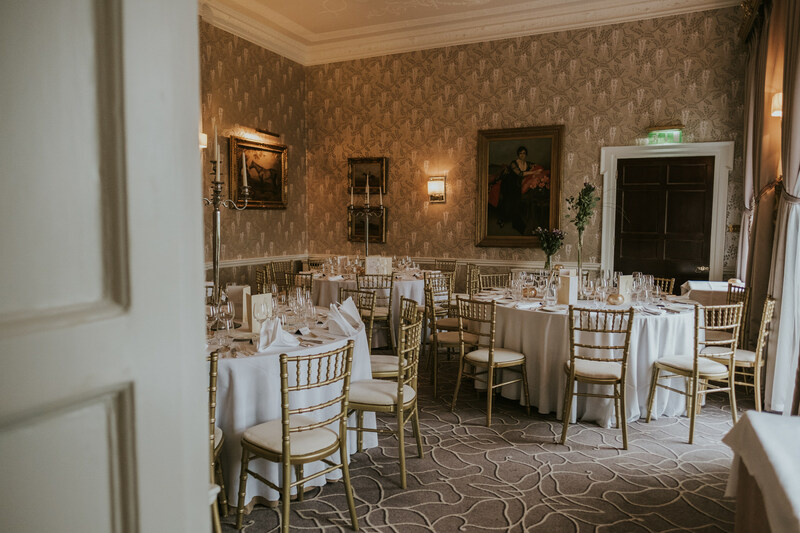 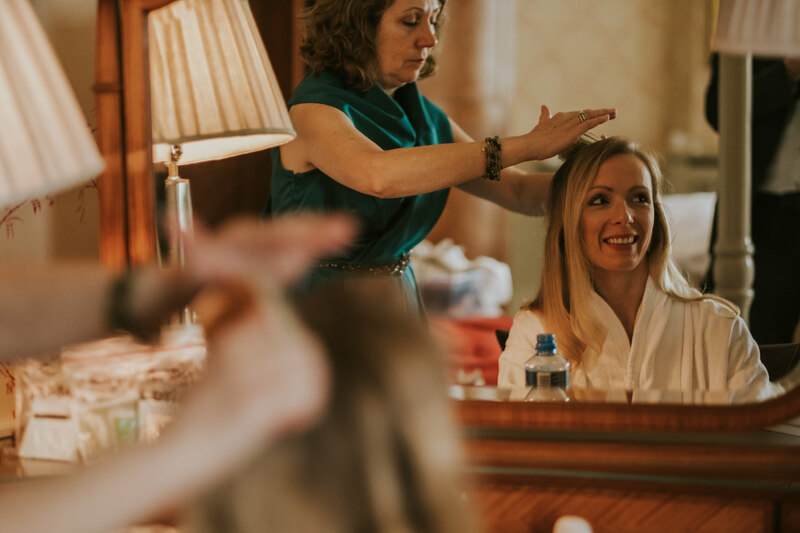 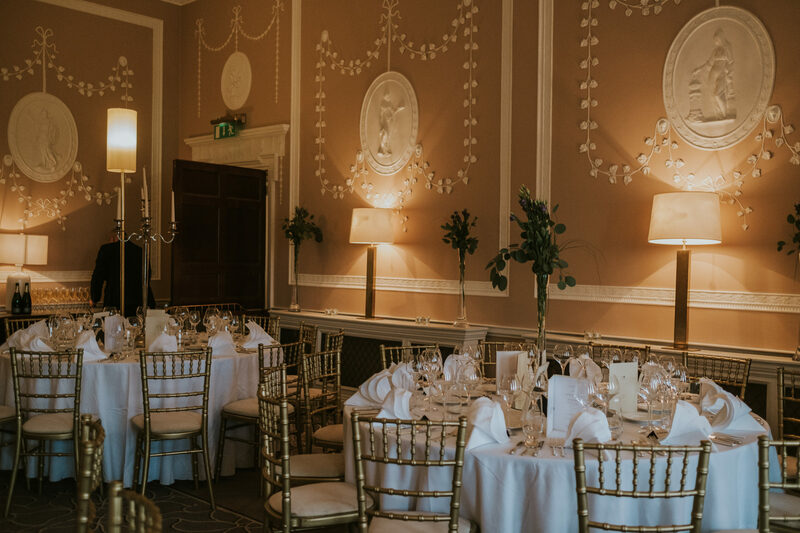 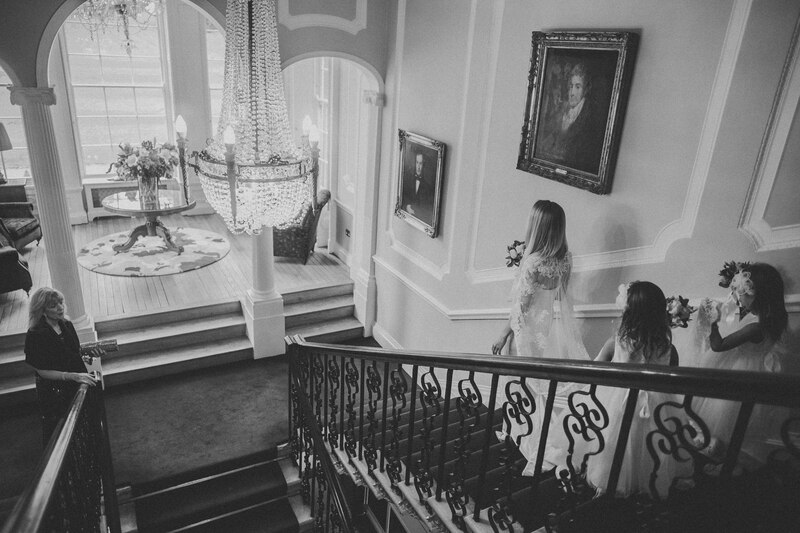 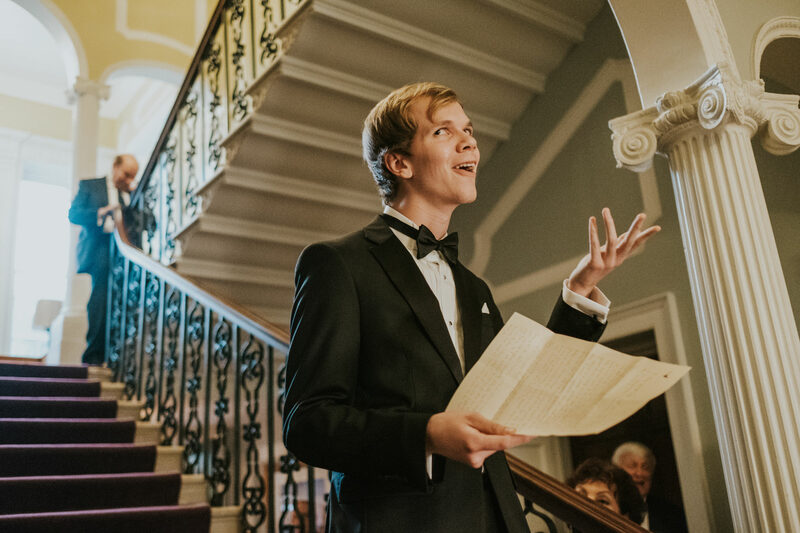 Just twenty minutes from the medieval city of Kilkenny, Mount Juliette is a venue we always love returning to. 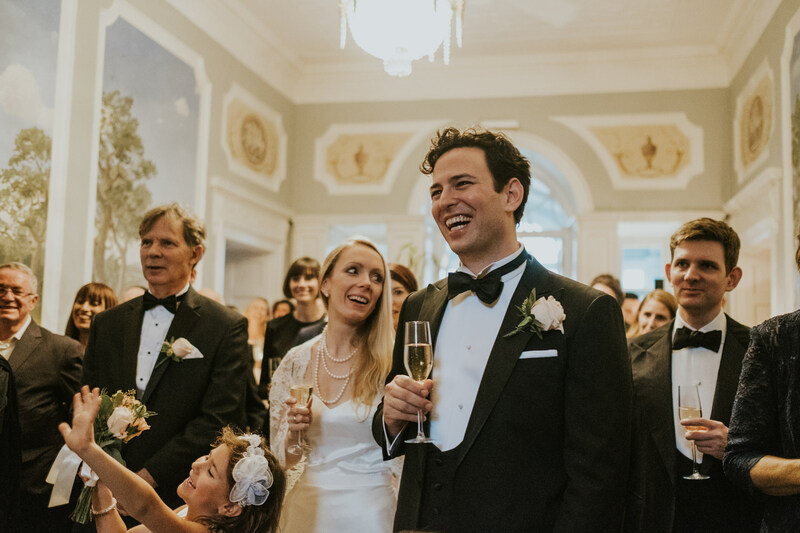 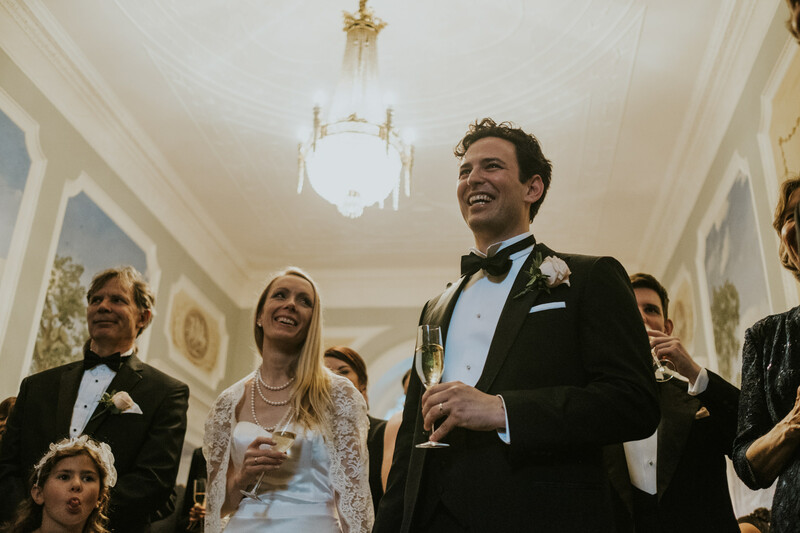 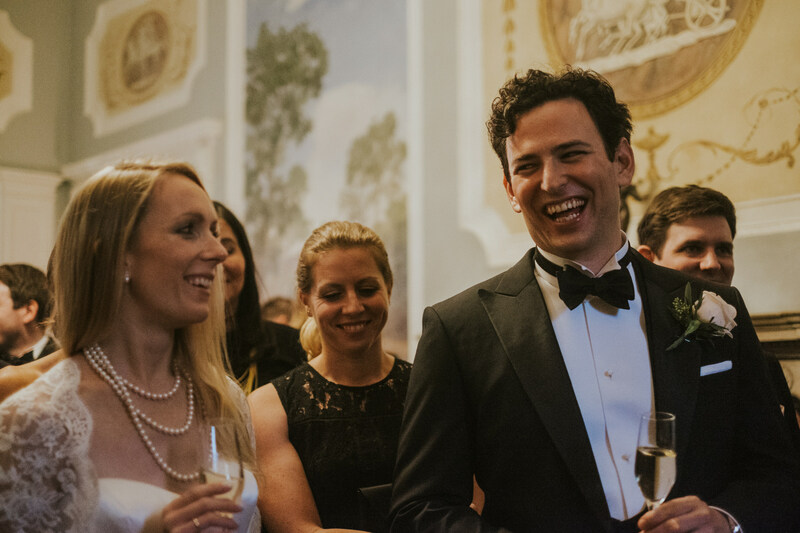 Sarah & Michaels story began after a chance meeting in Manhattan, in 2014 during the World Cup. 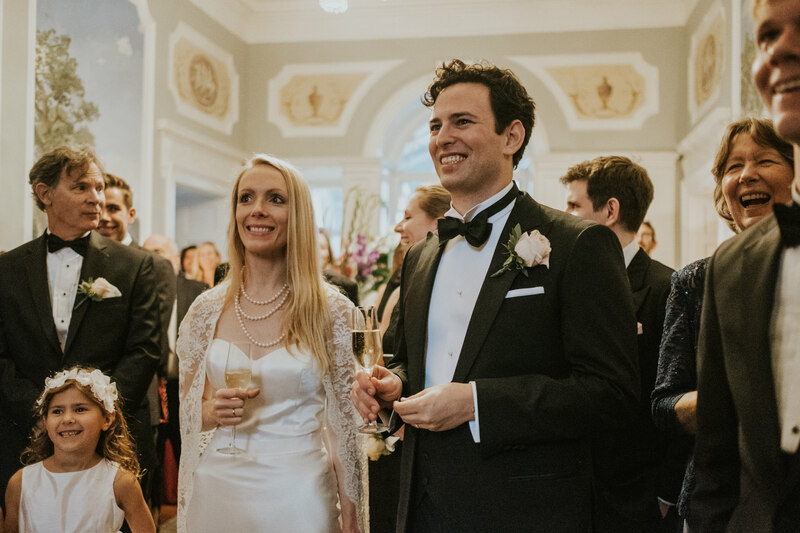 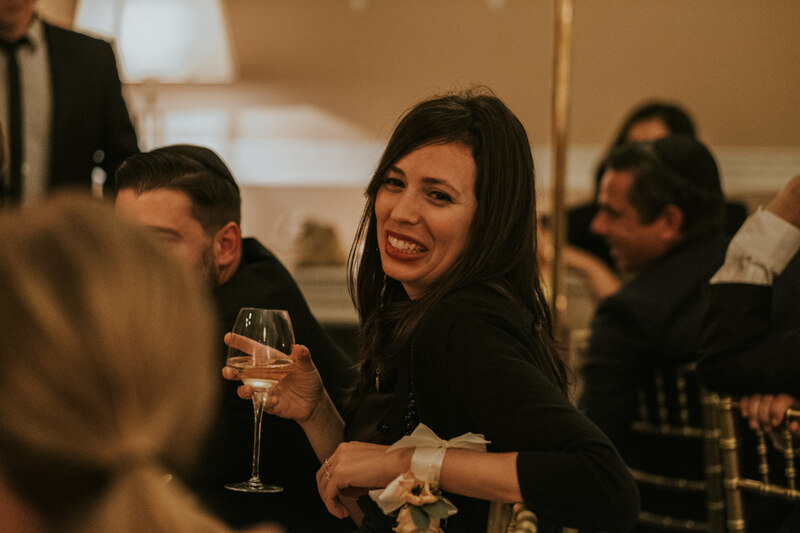 Following a romantic first date in a local Wine Bar in New York, the couple knew they were soulmates destined to be reunited. 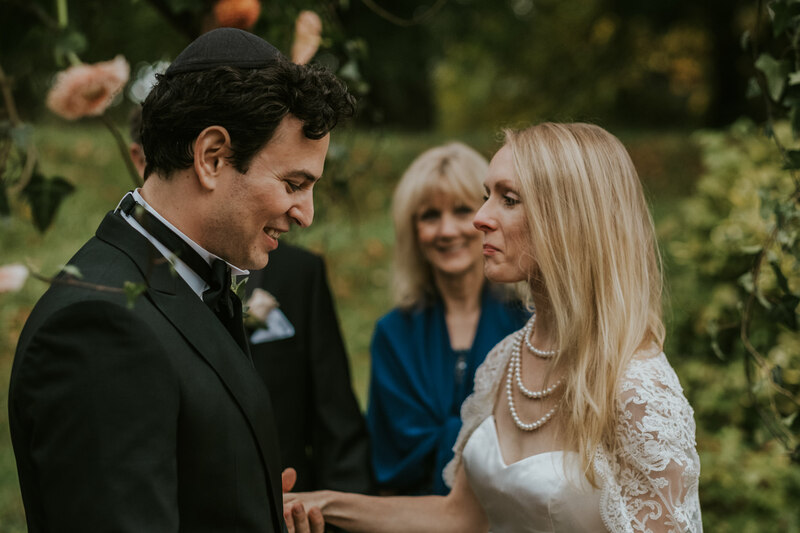 Sometime later, while holidaying in the beautiful city of Budapest, Michael proposed to Sarah by the River Danube. 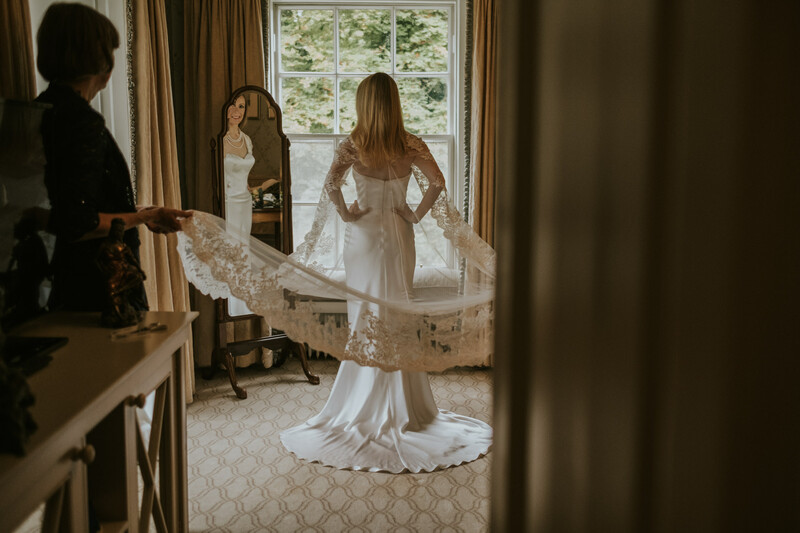 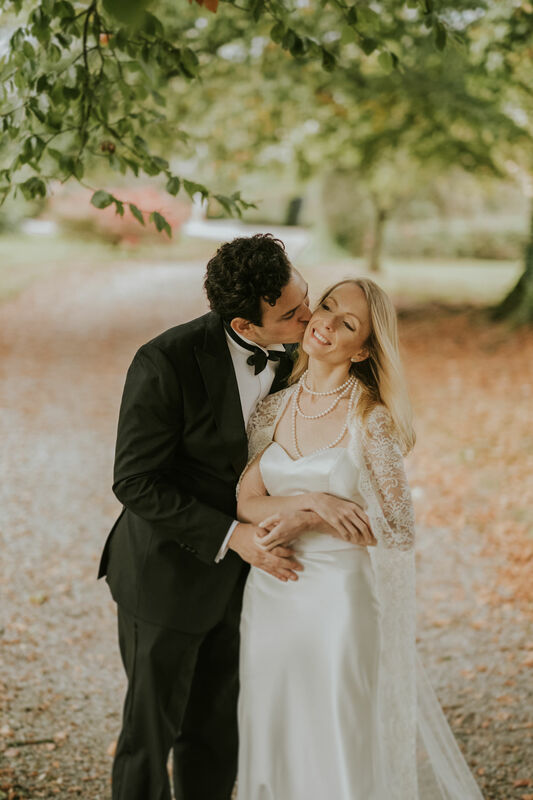 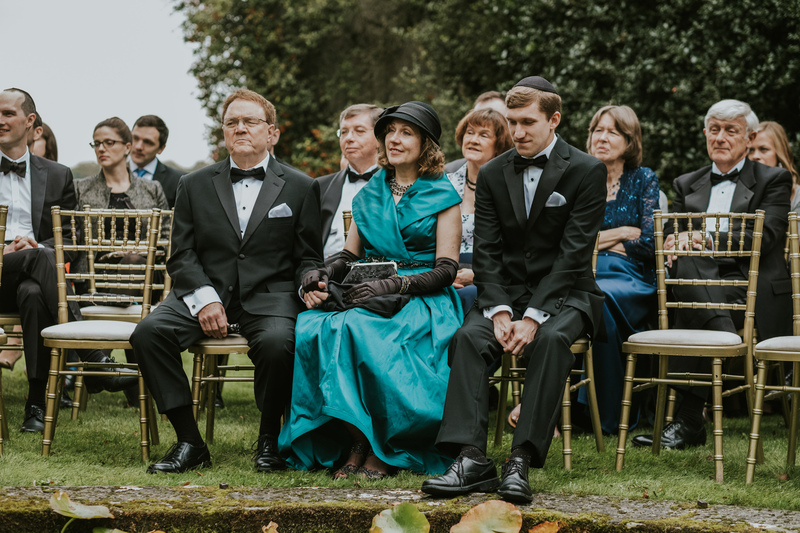 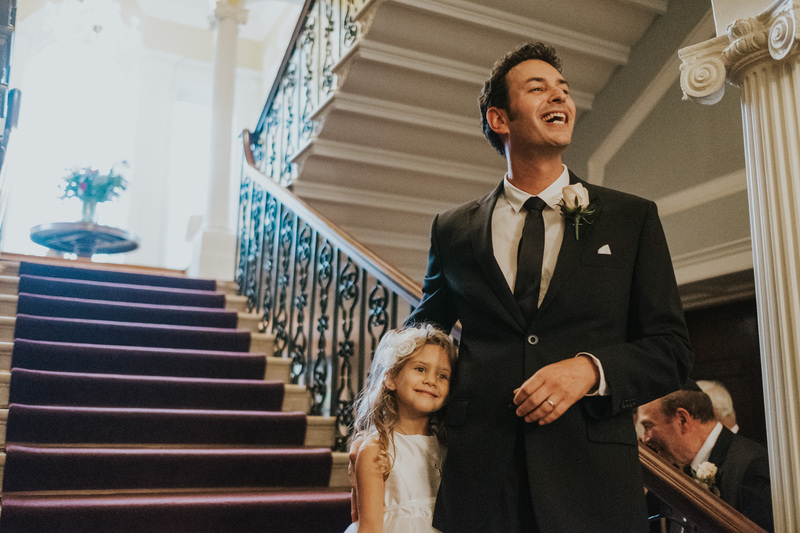 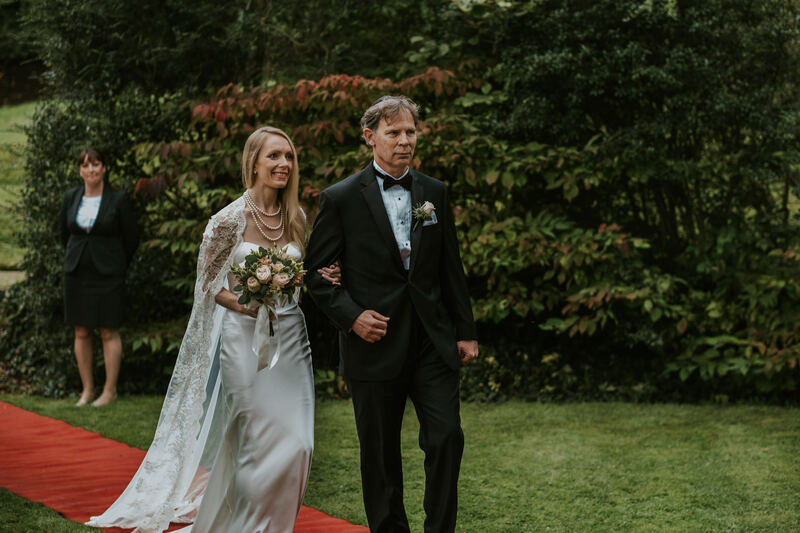 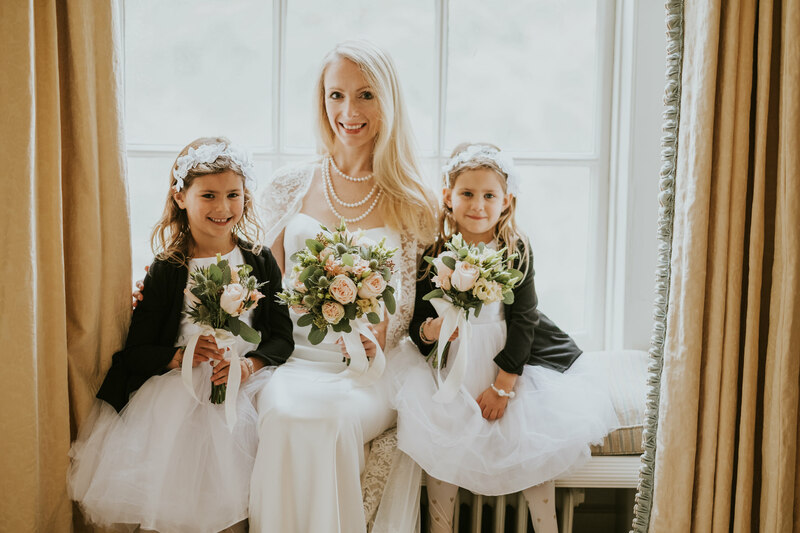 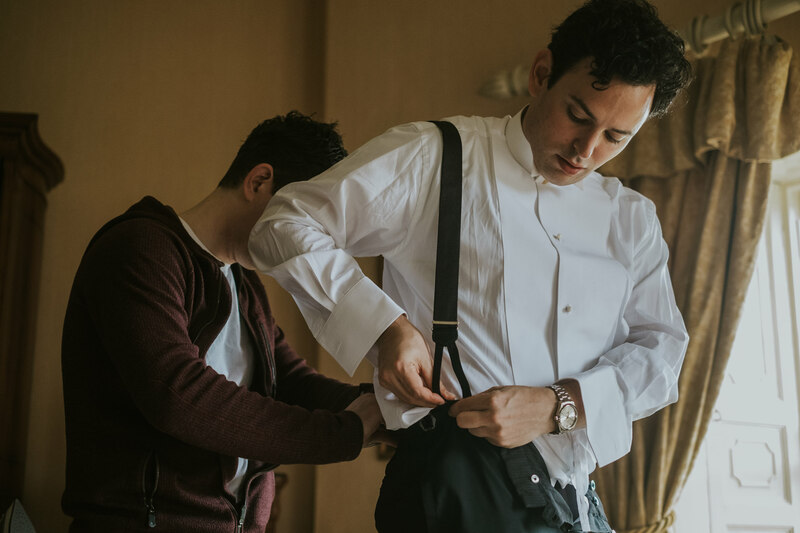 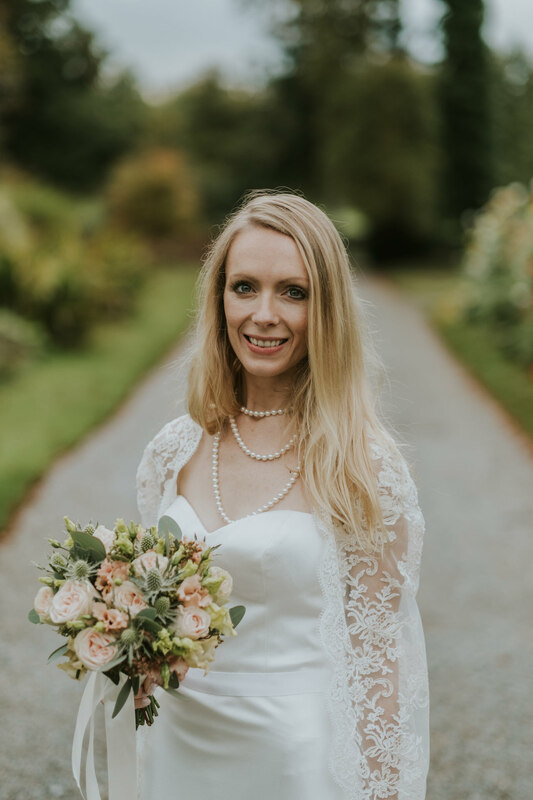 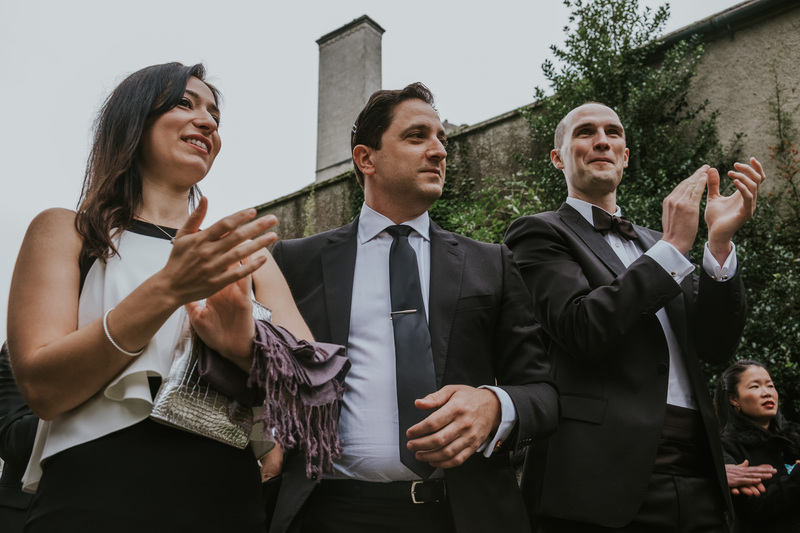 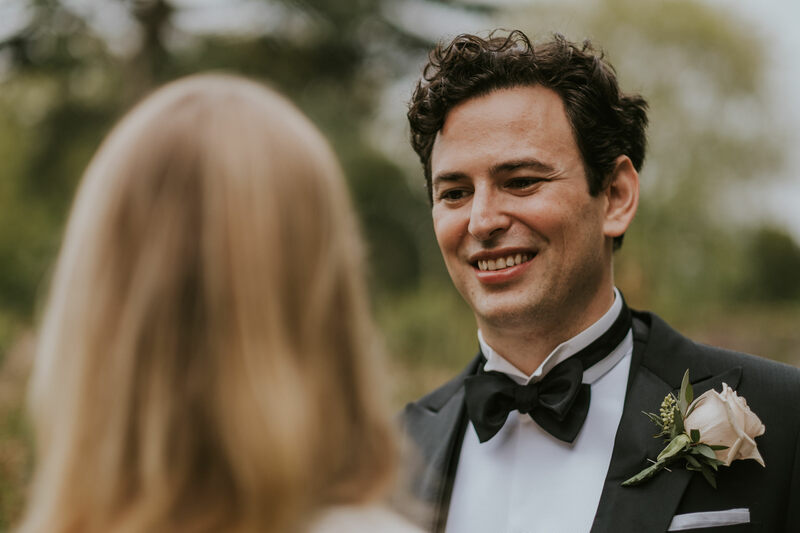 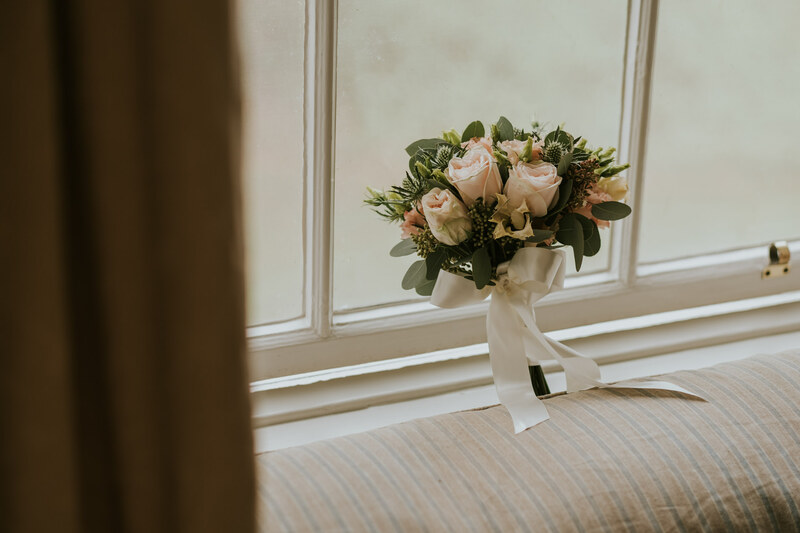 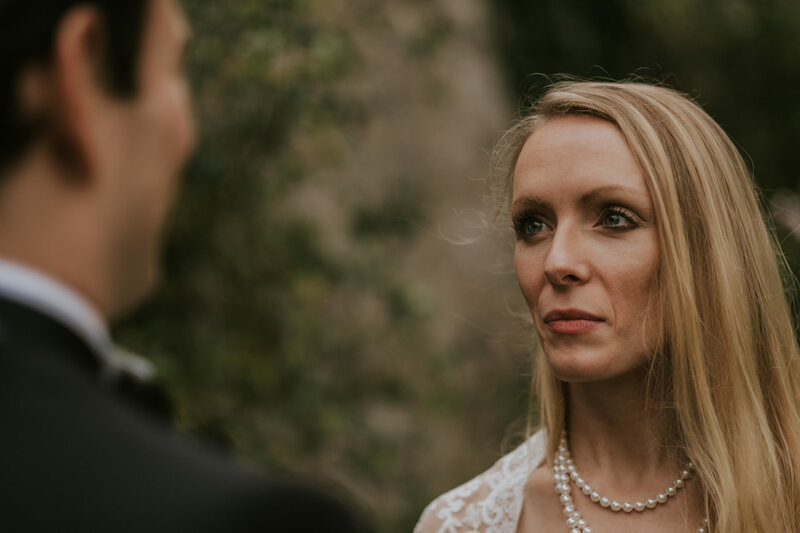 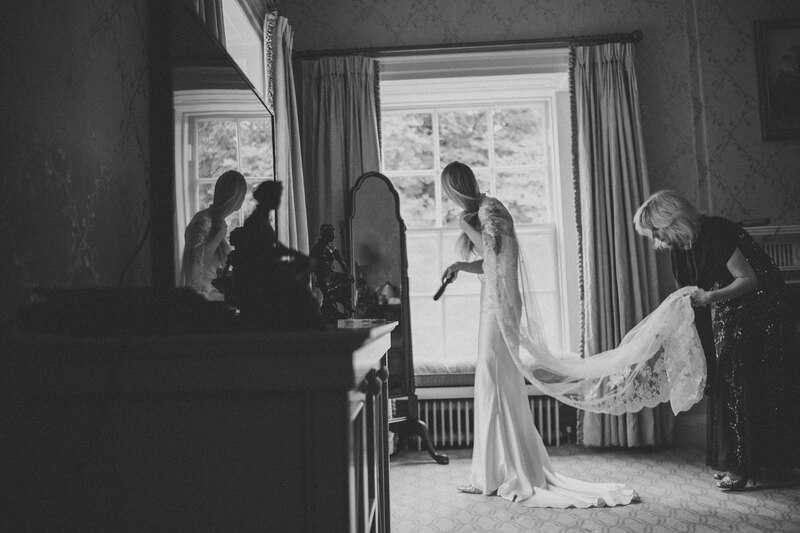 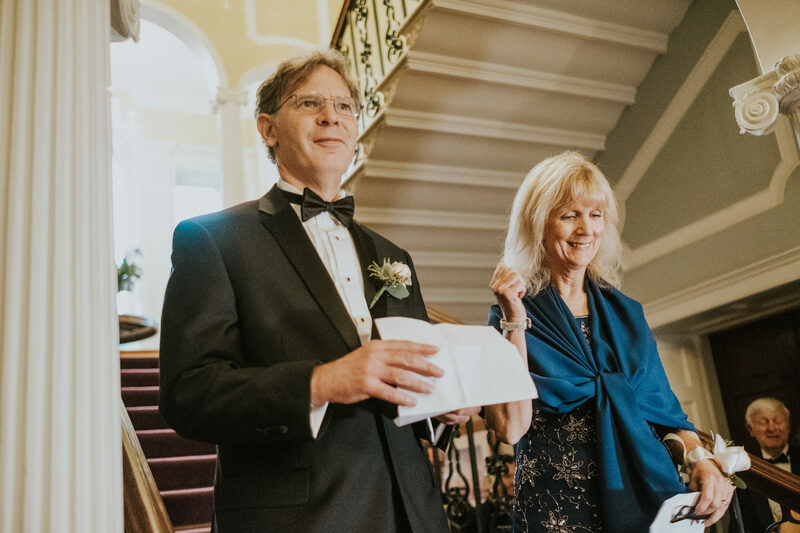 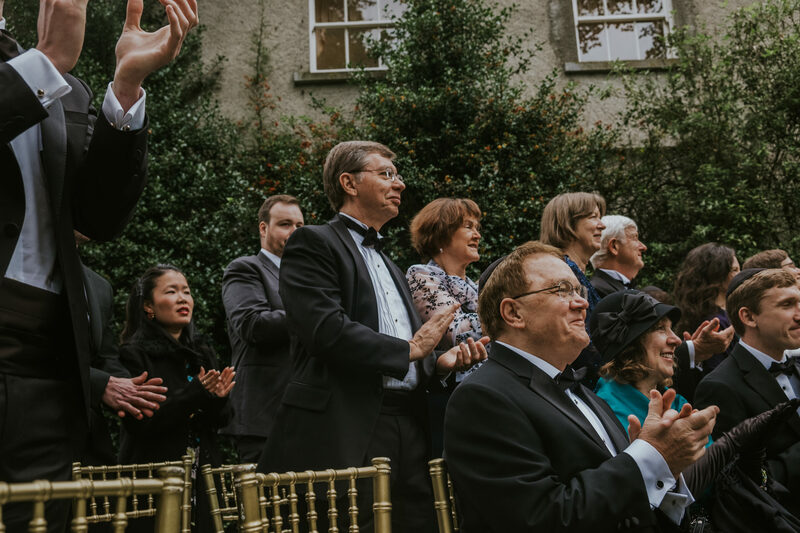 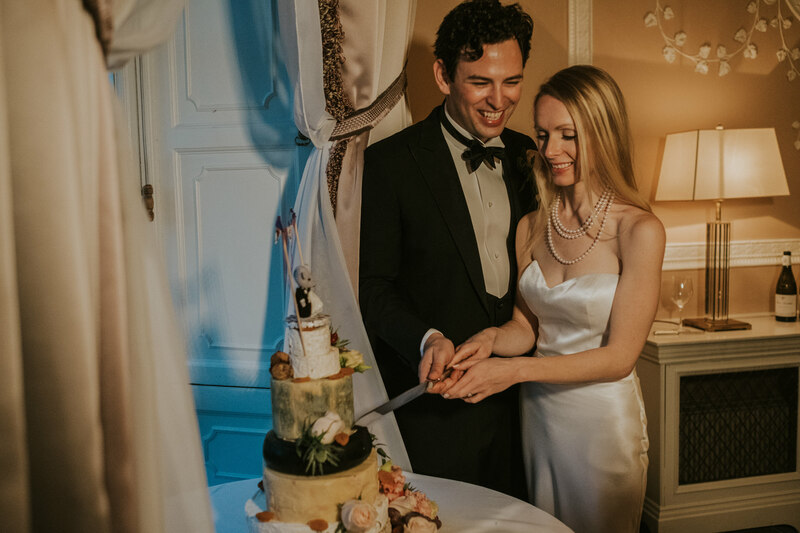 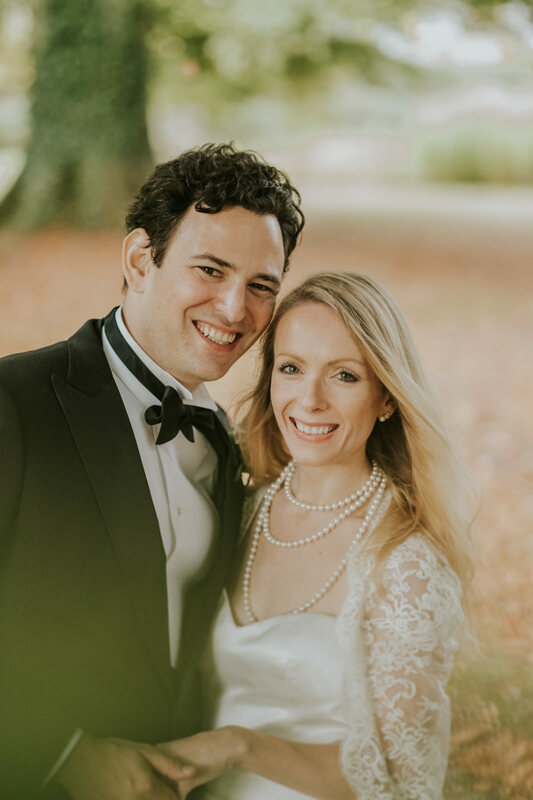 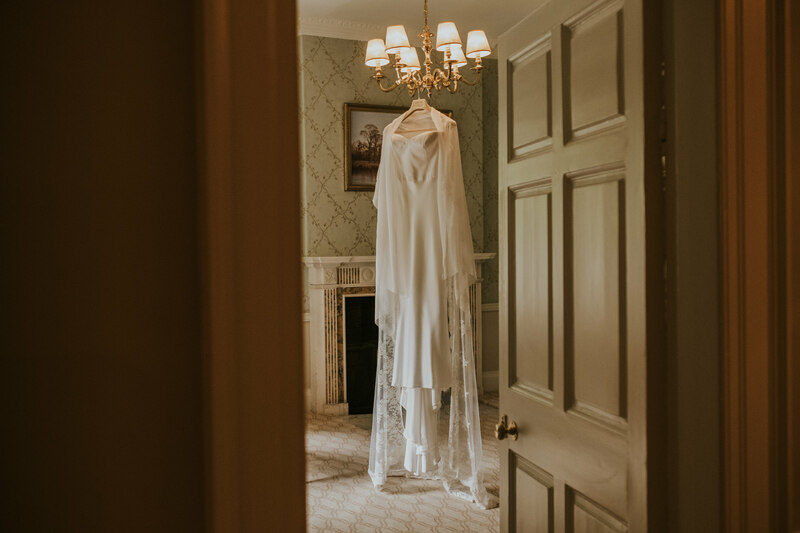 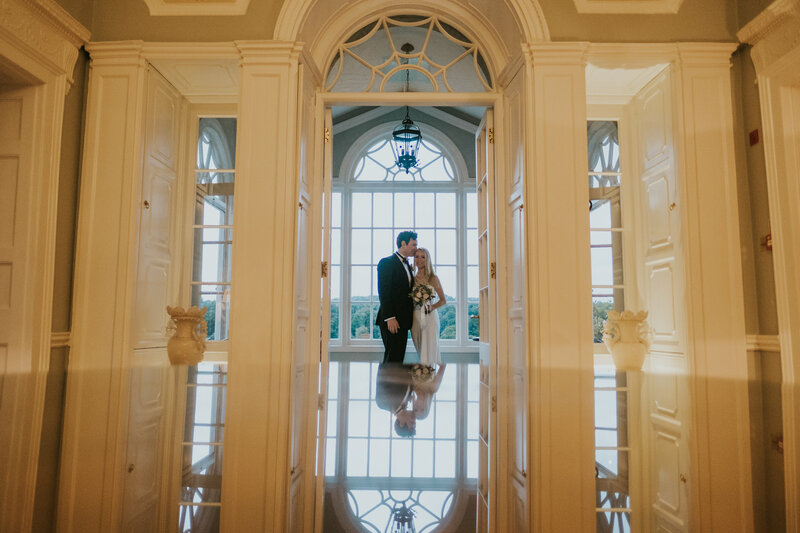 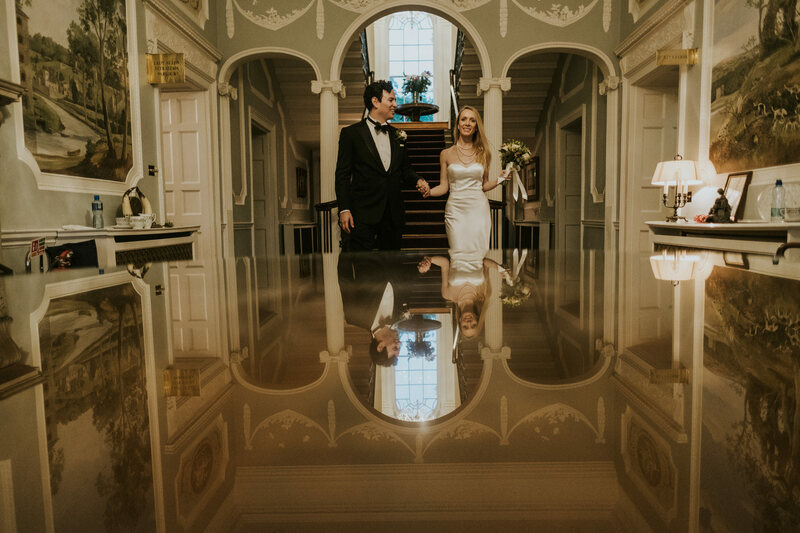 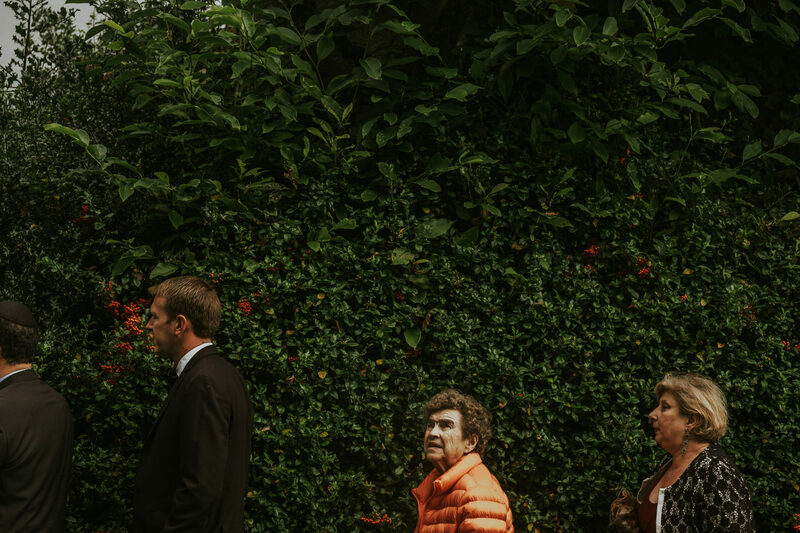 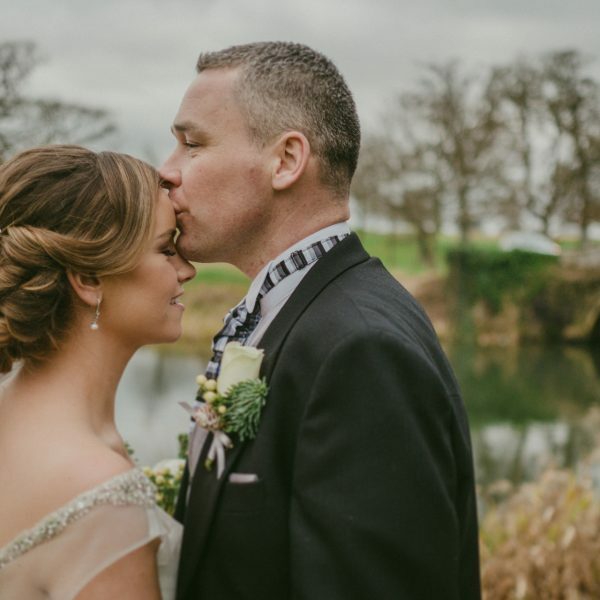 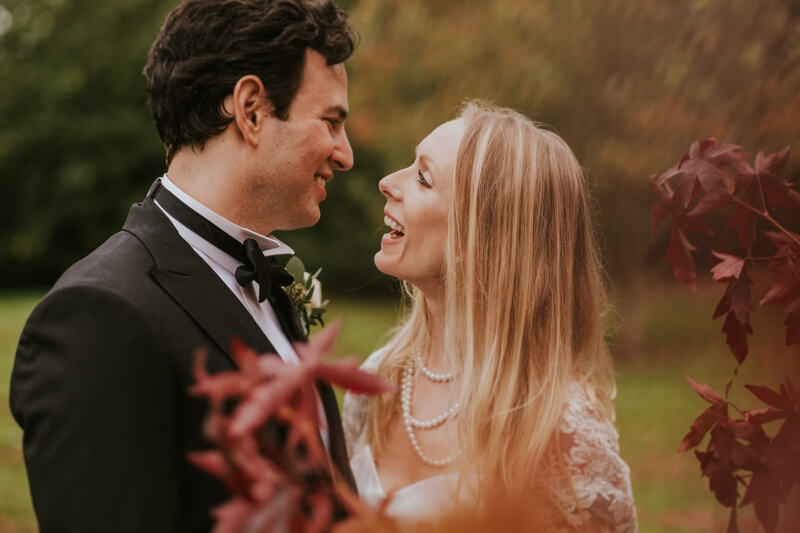 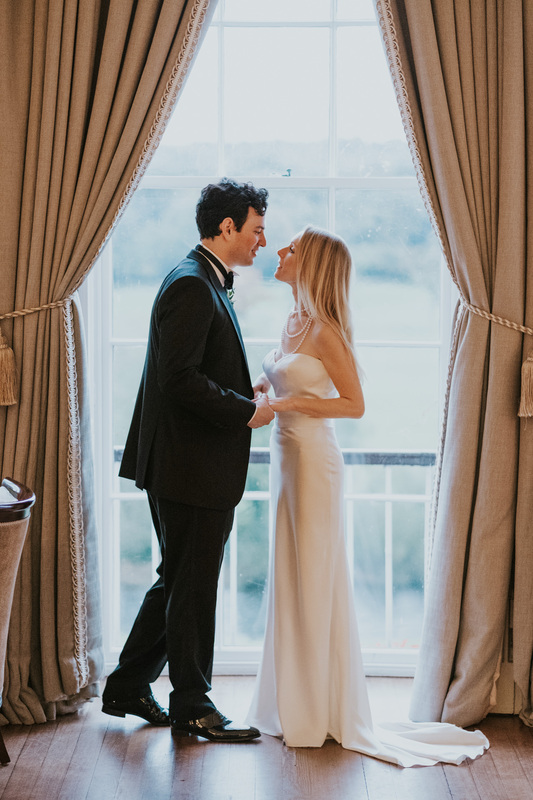 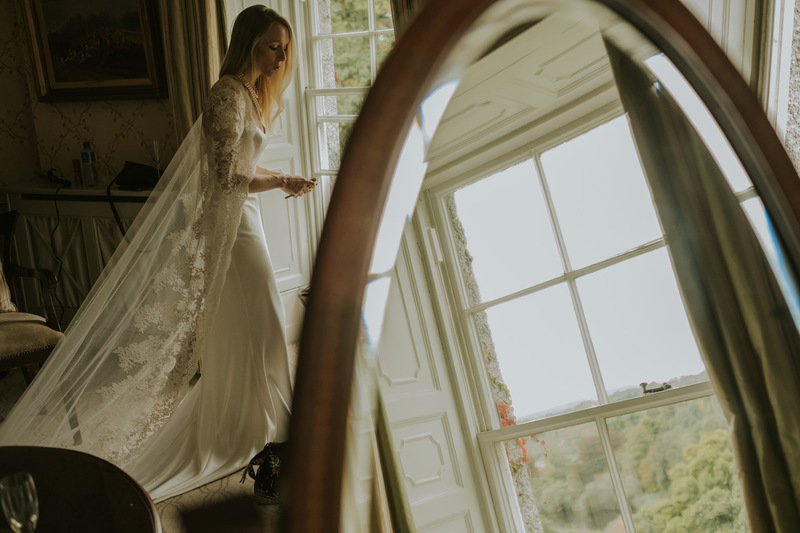 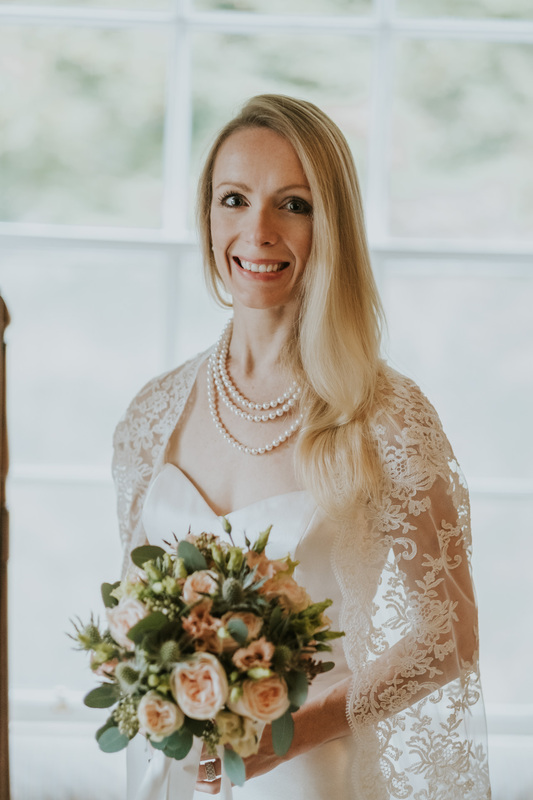 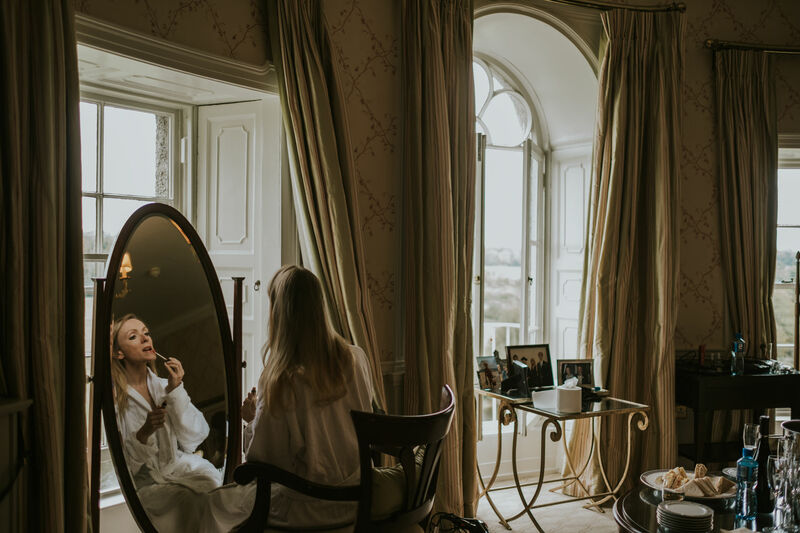 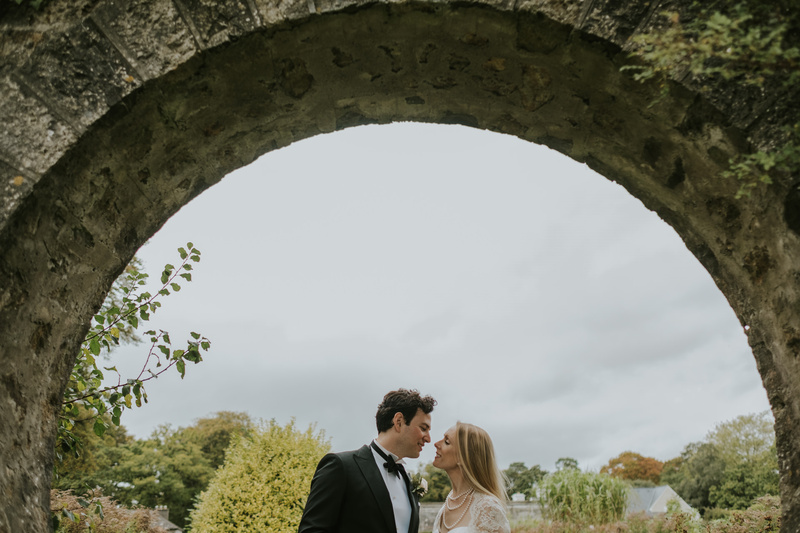 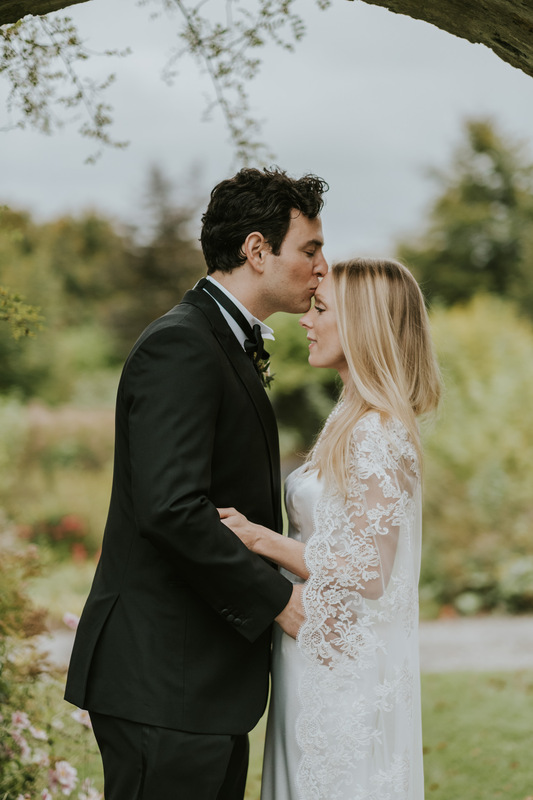 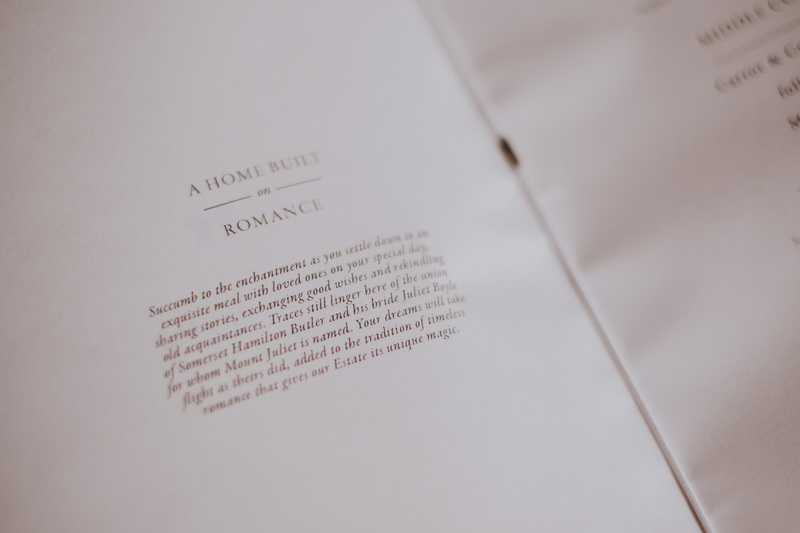 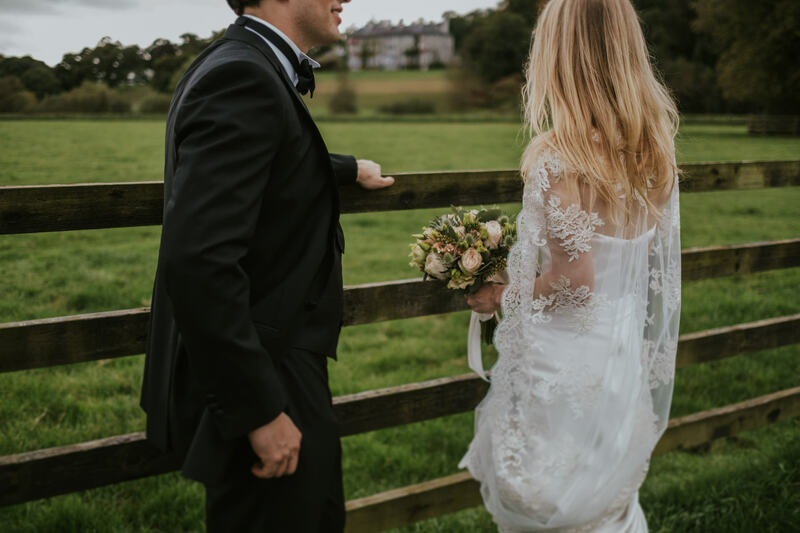 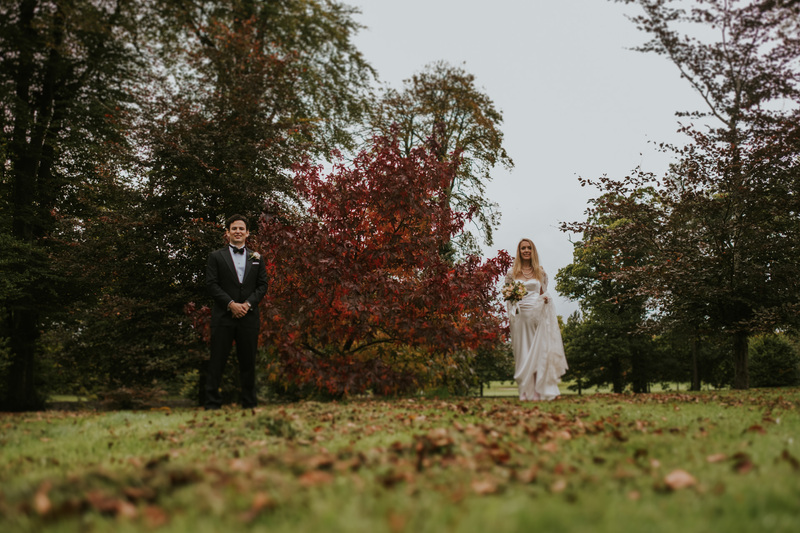 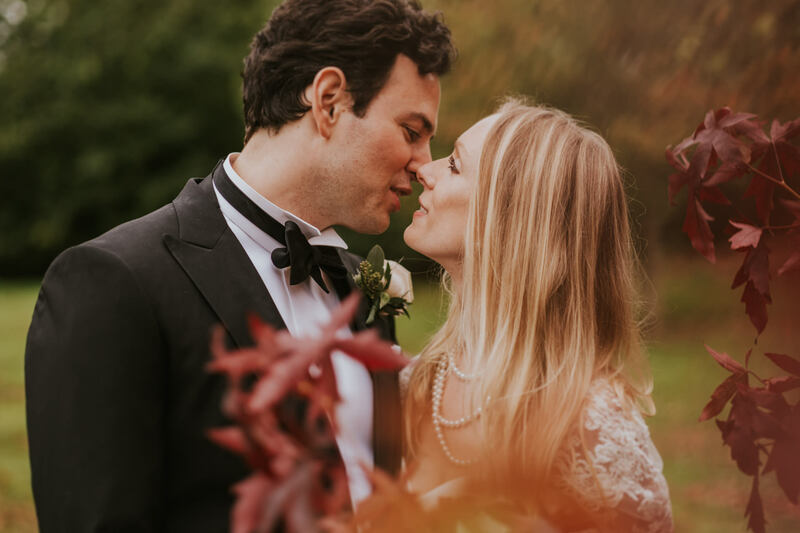 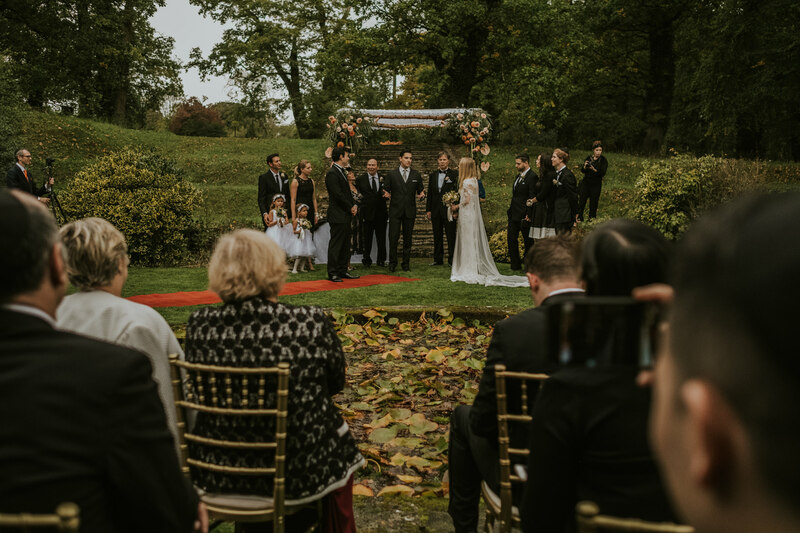 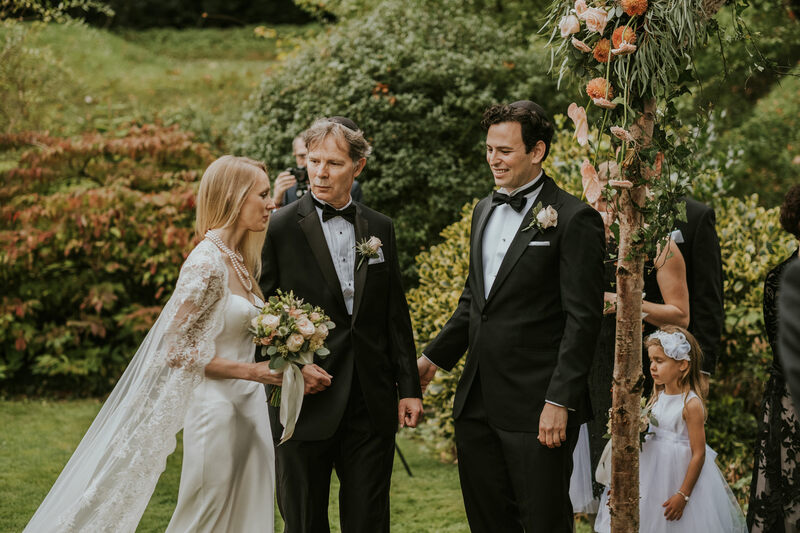 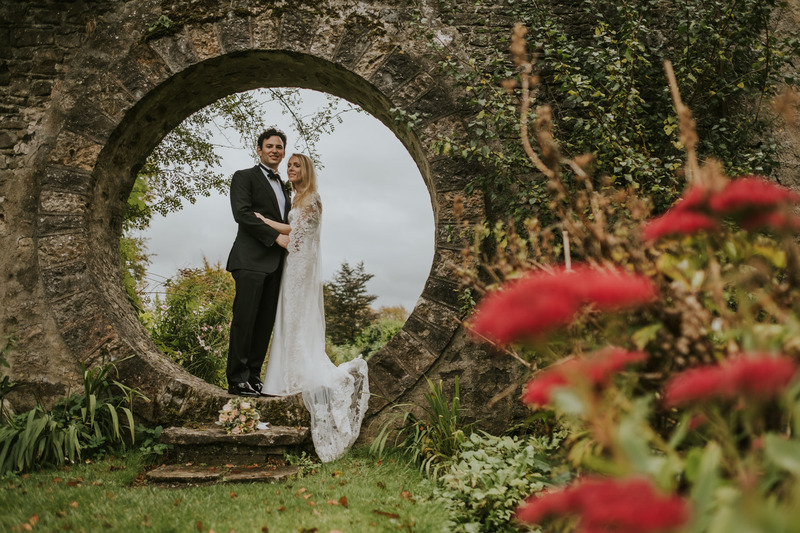 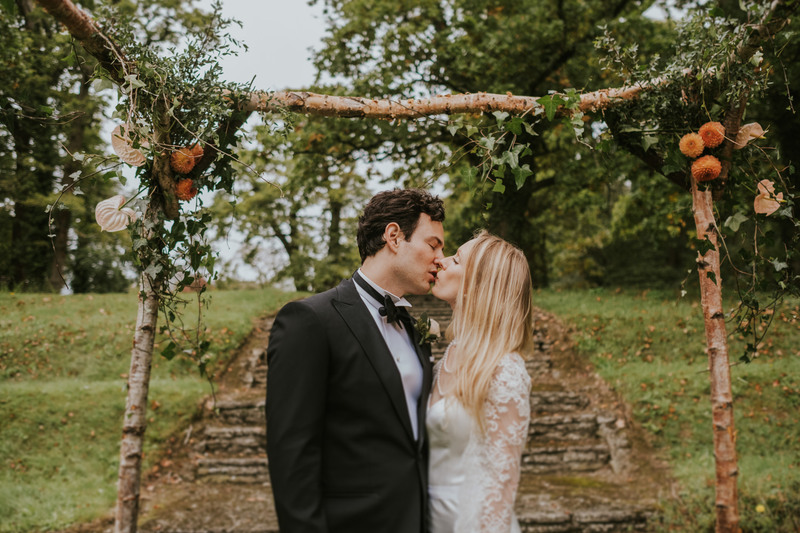 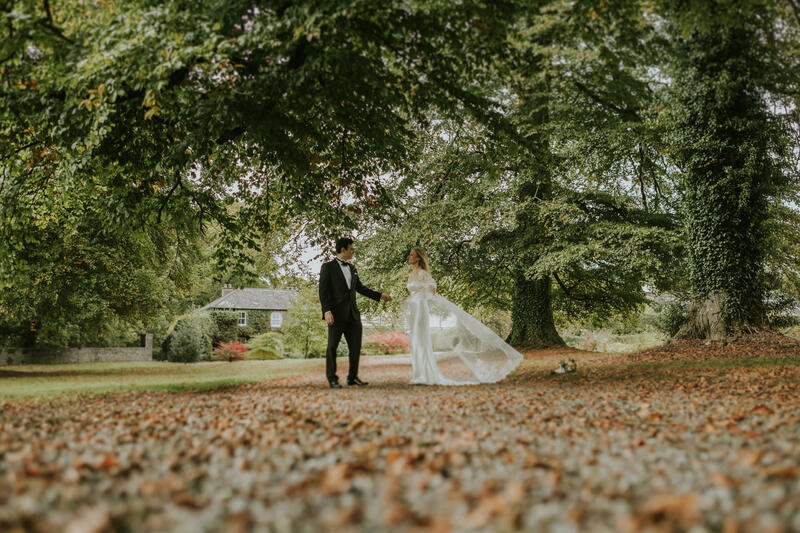 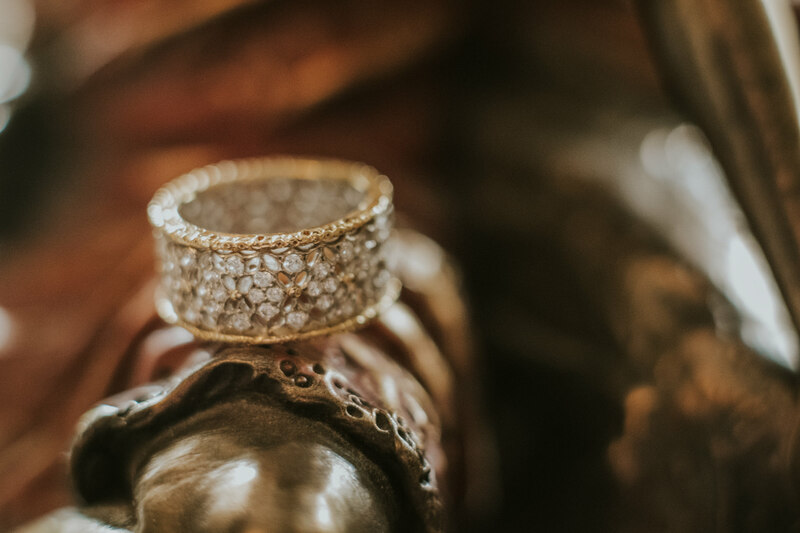 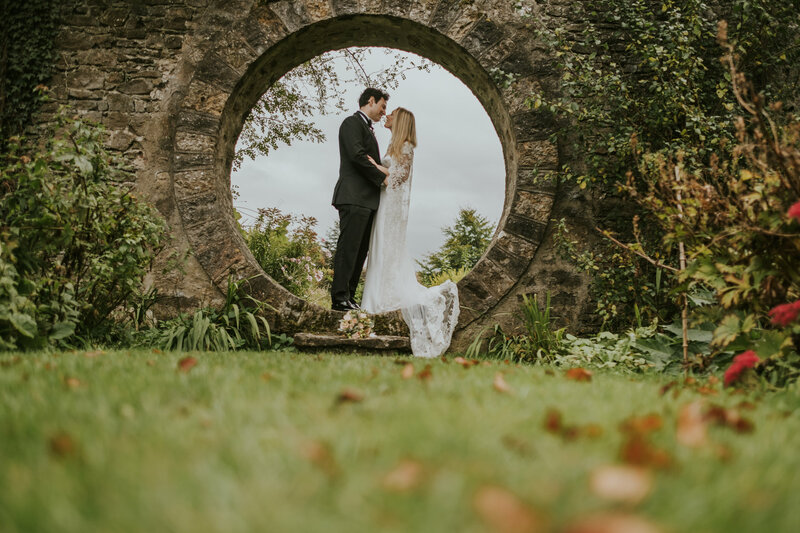 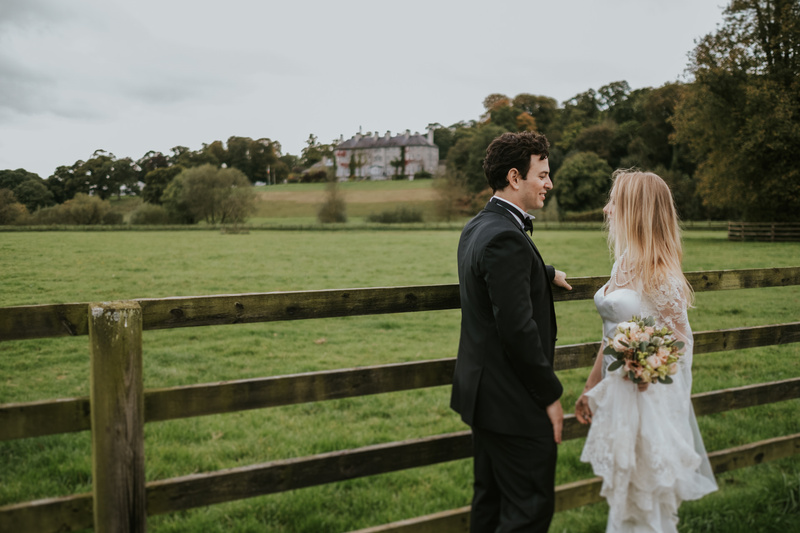 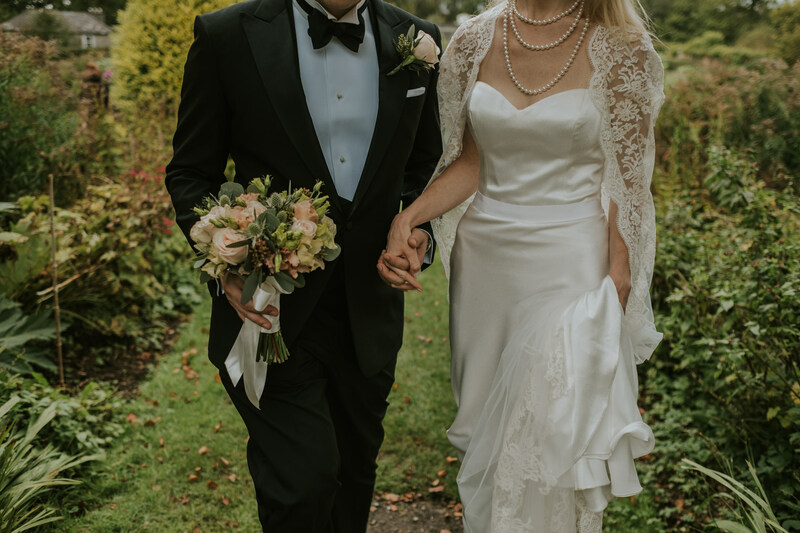 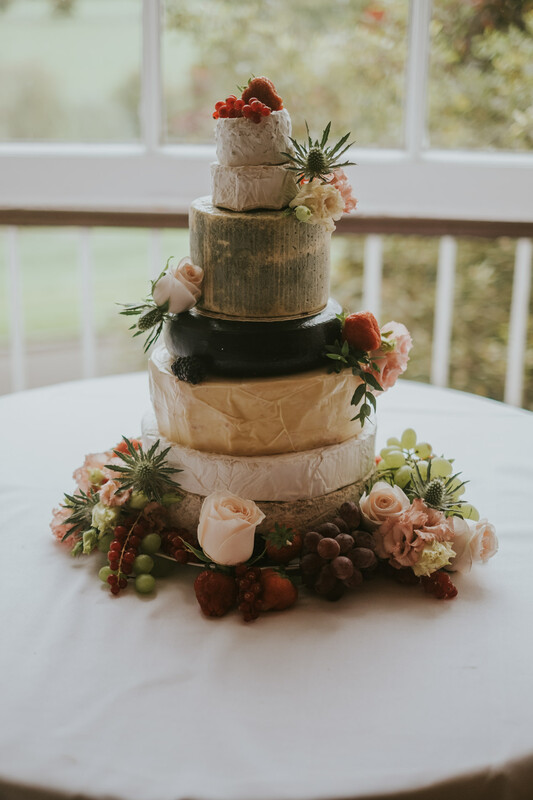 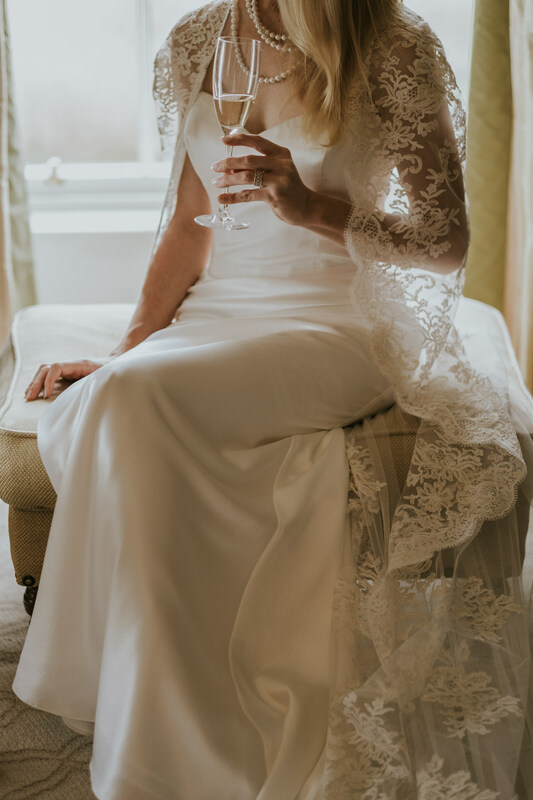 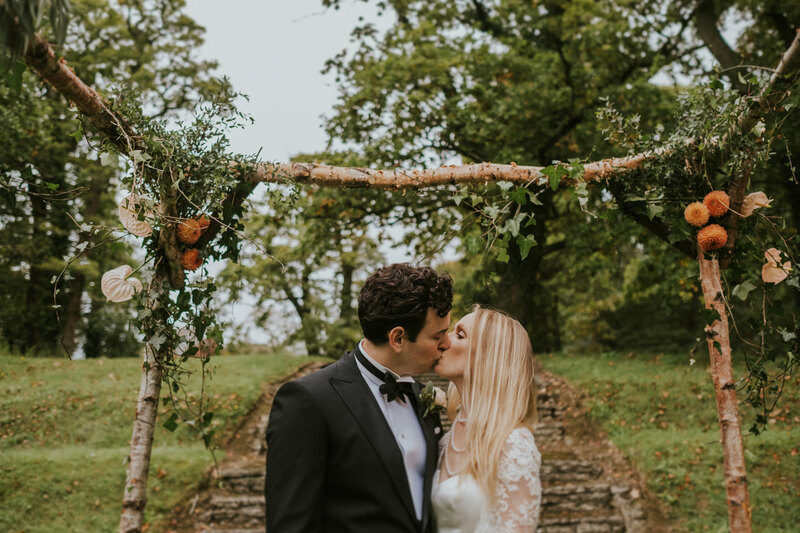 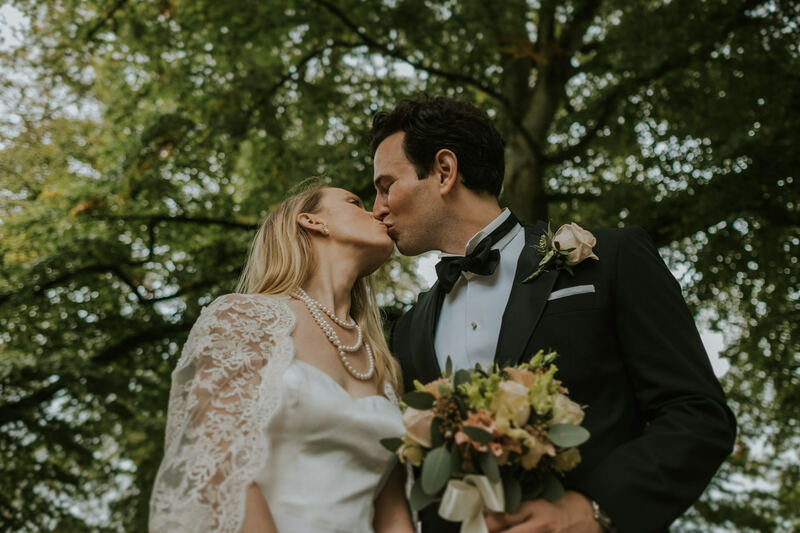 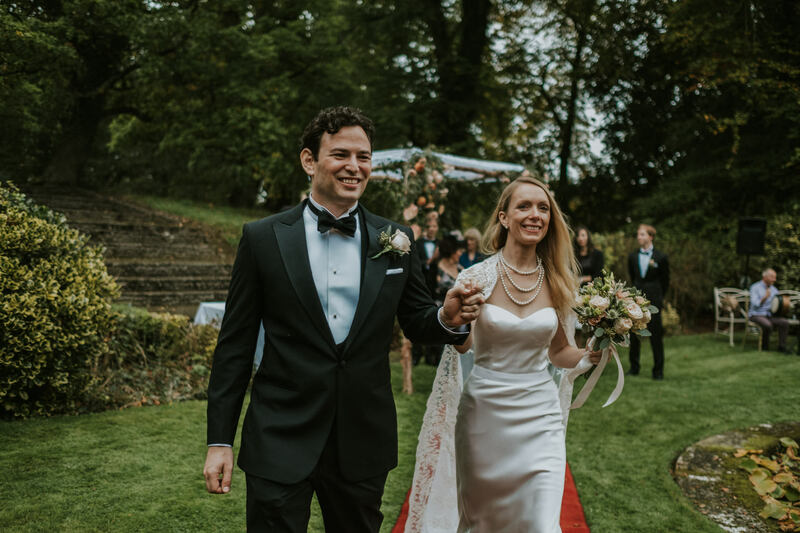 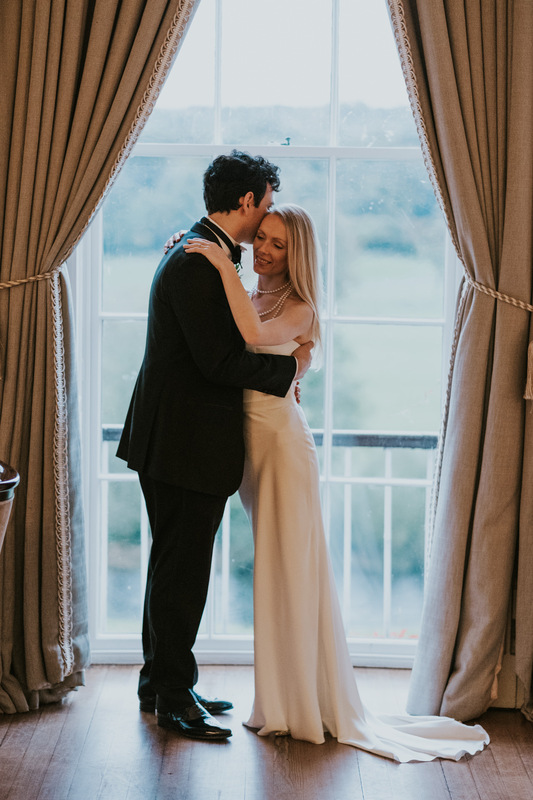 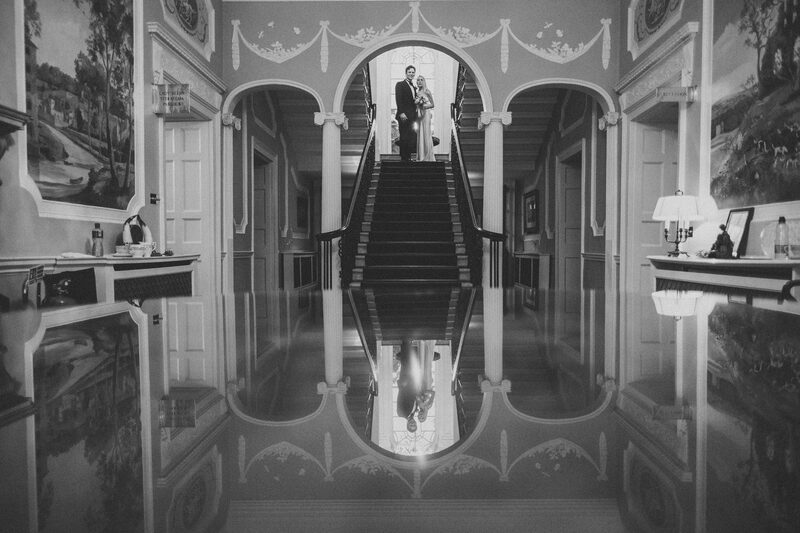 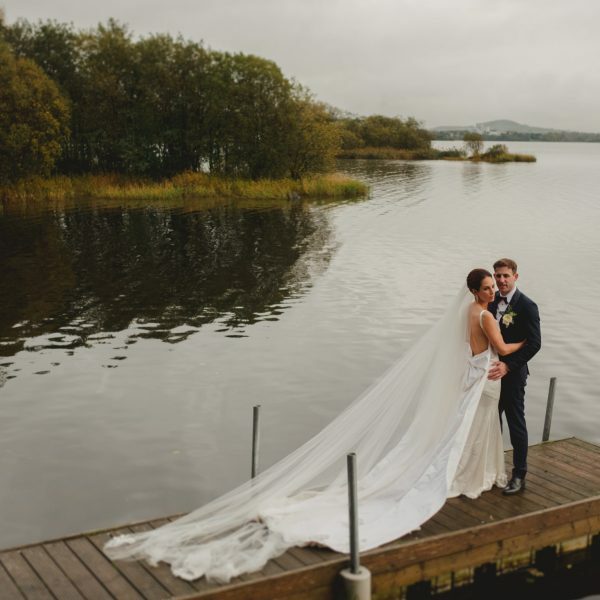 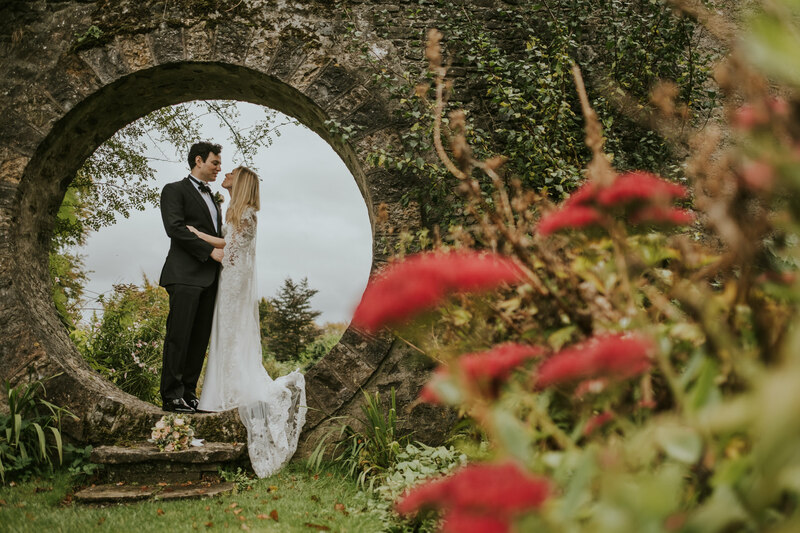 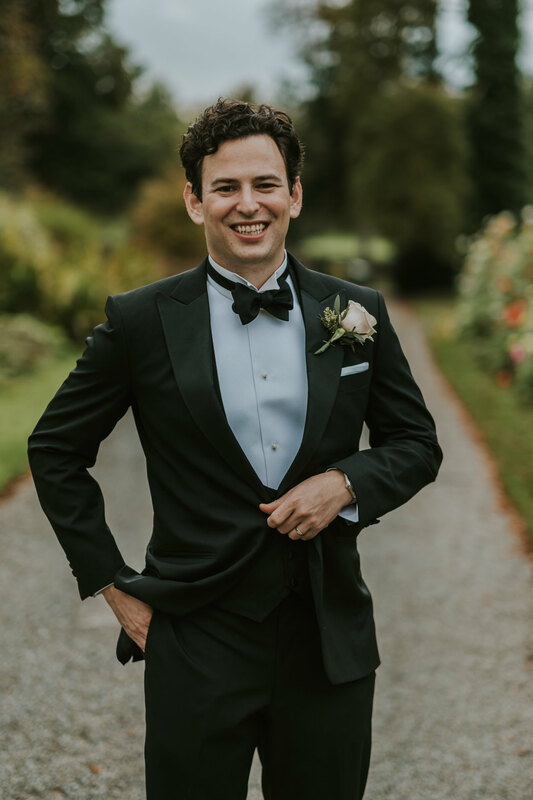 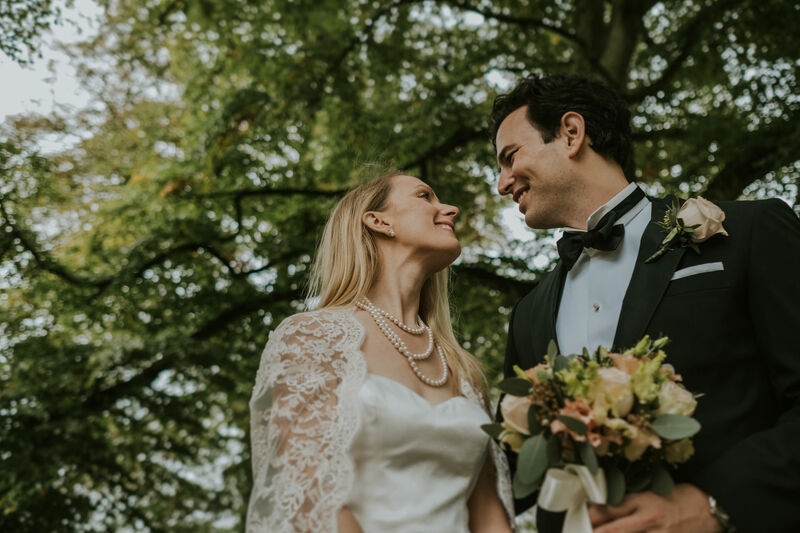 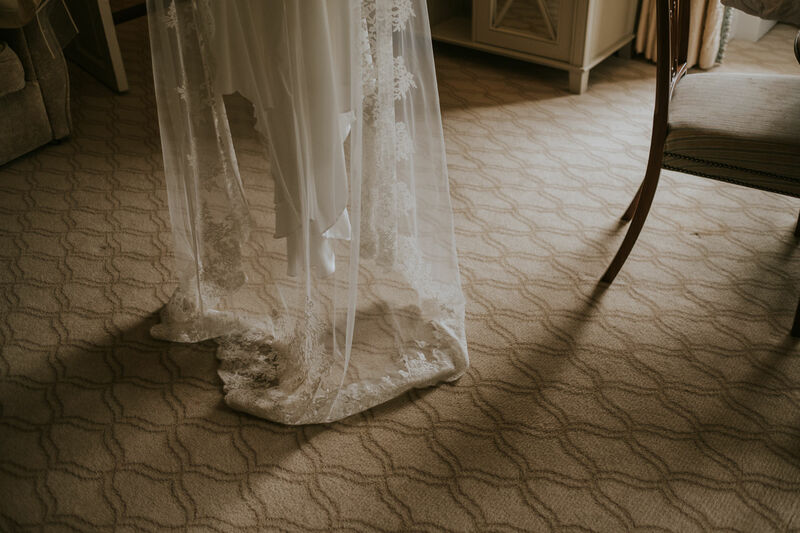 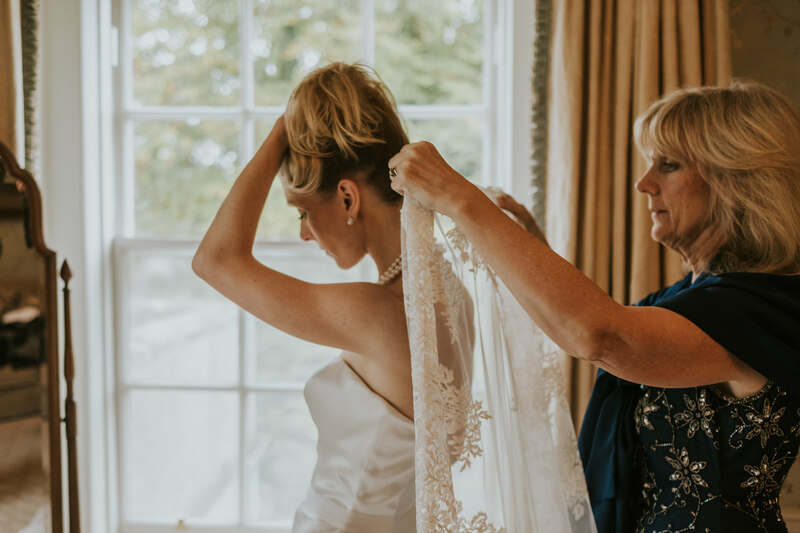 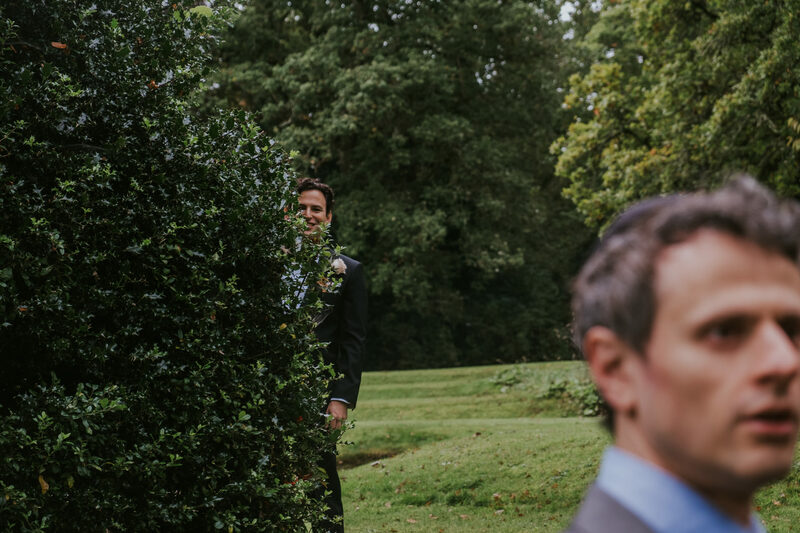 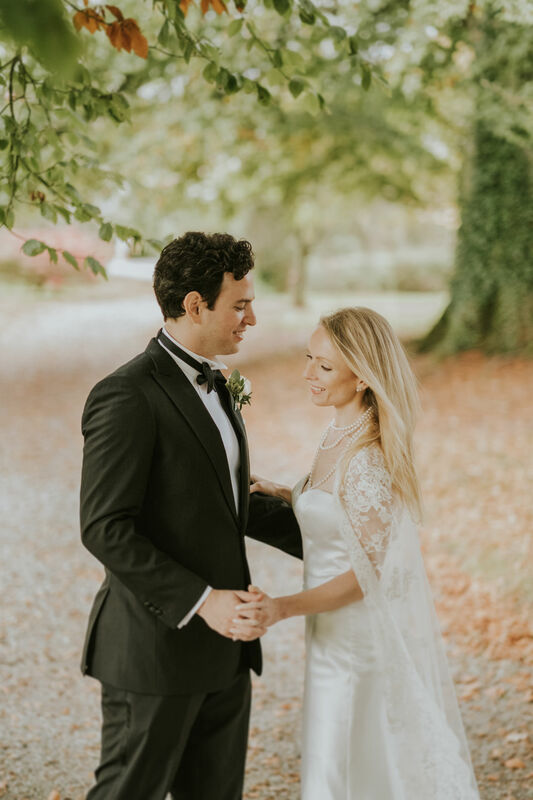 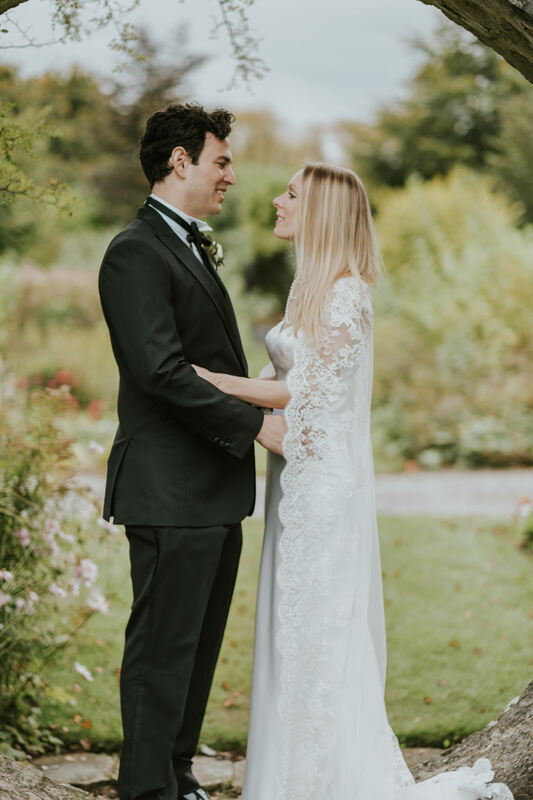 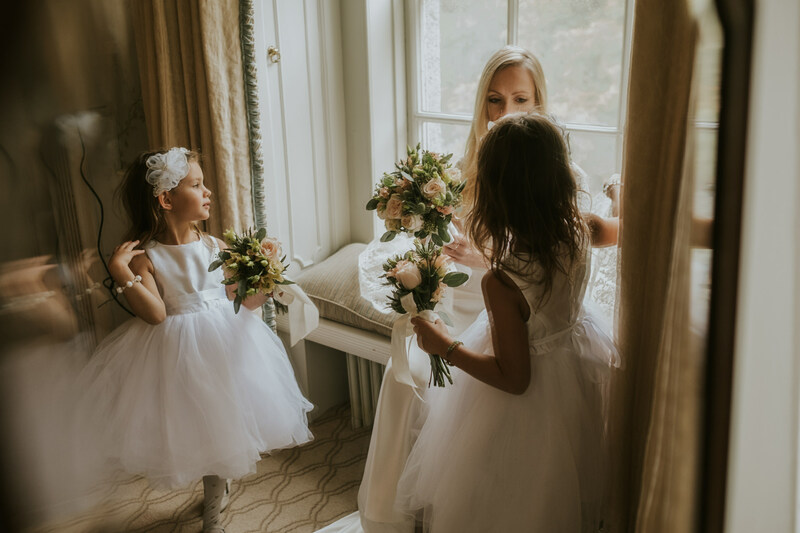 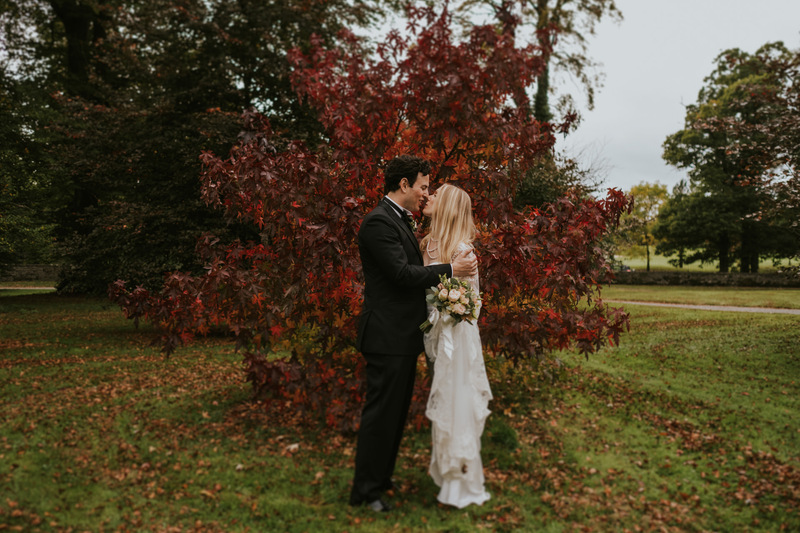 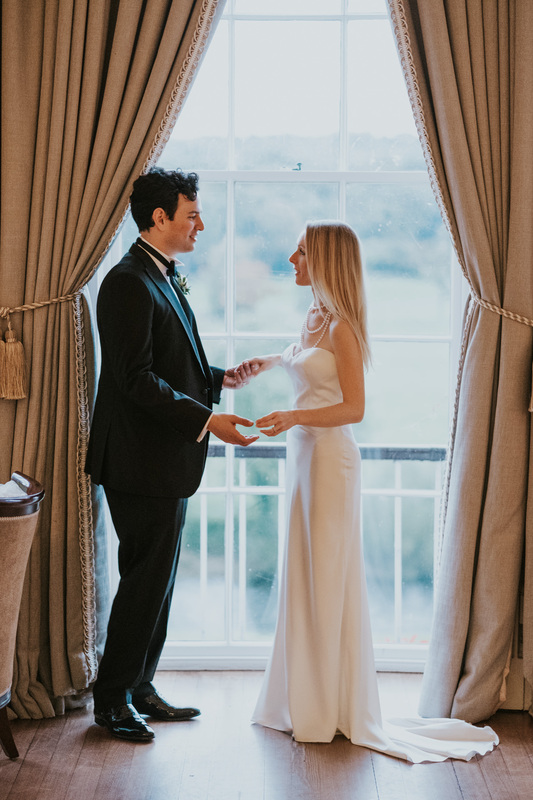 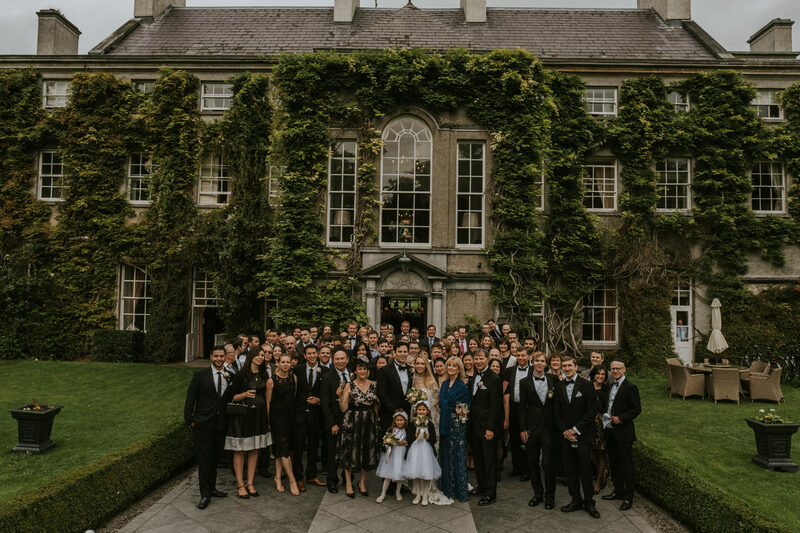 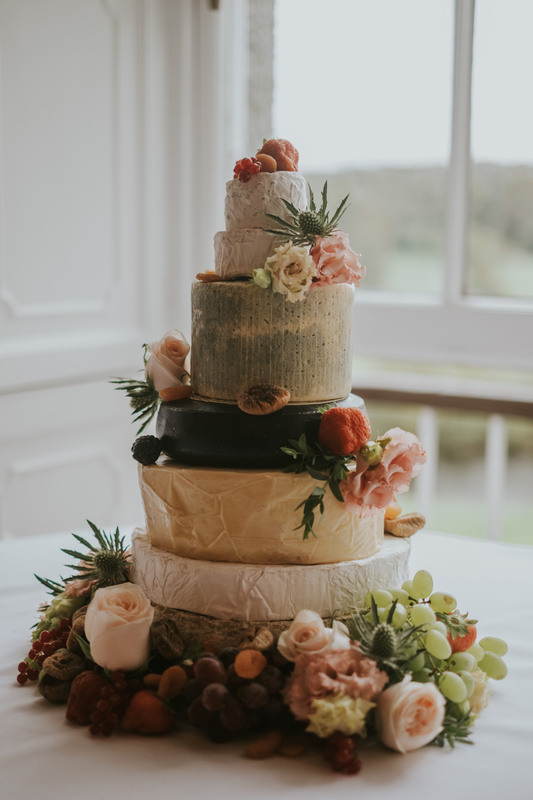 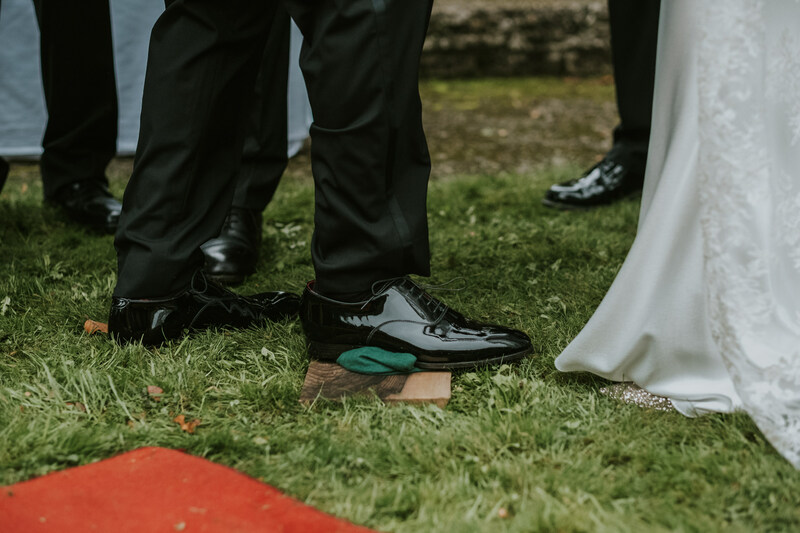 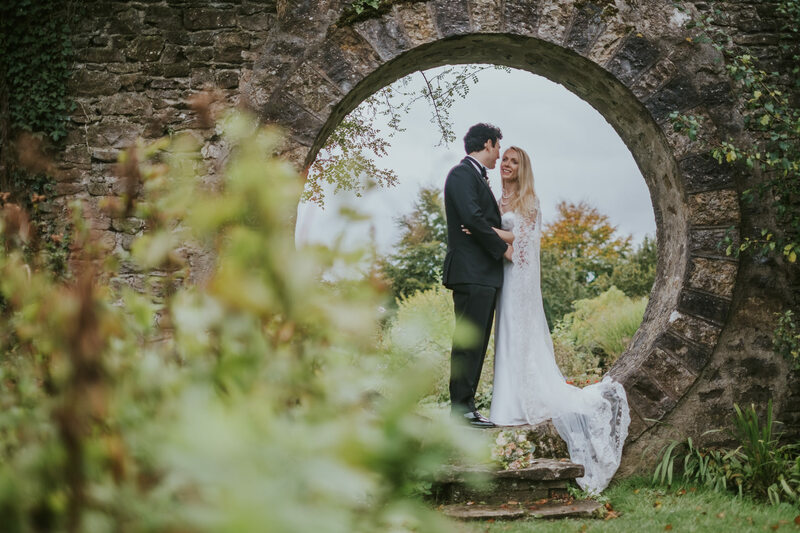 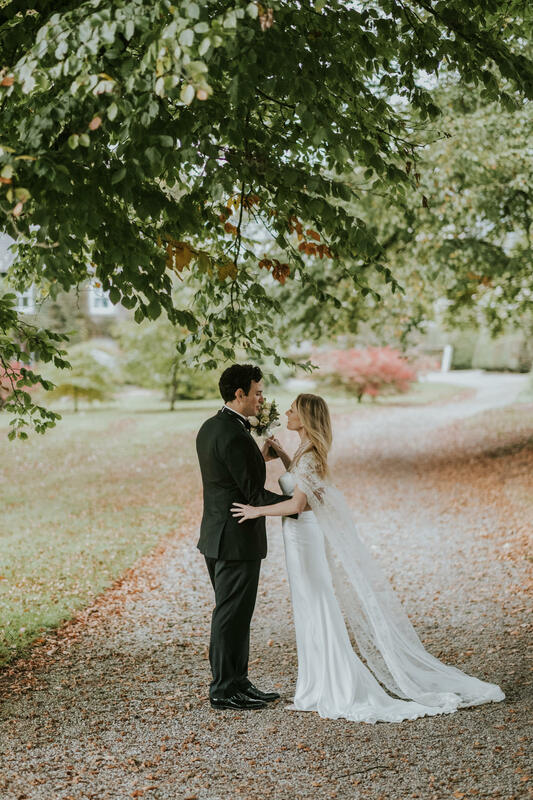 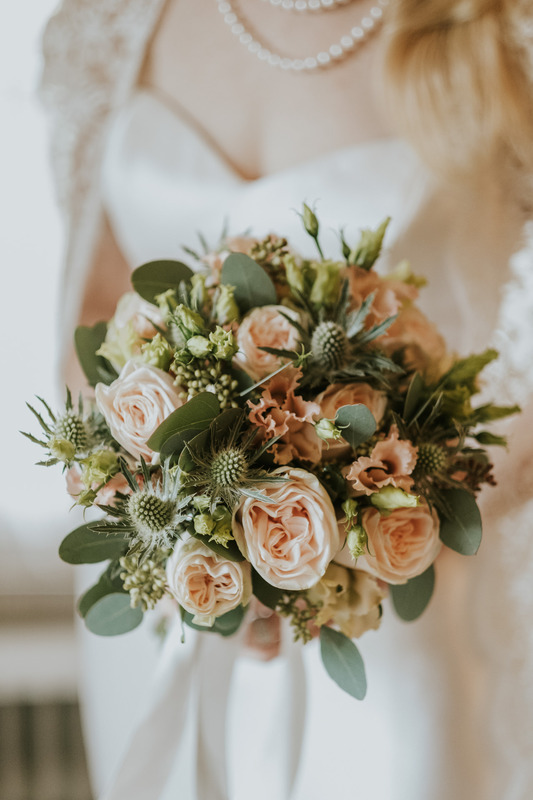 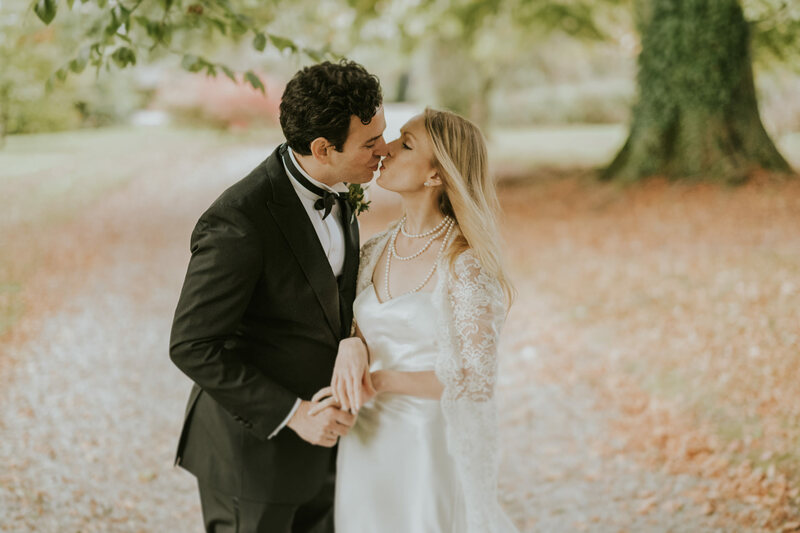 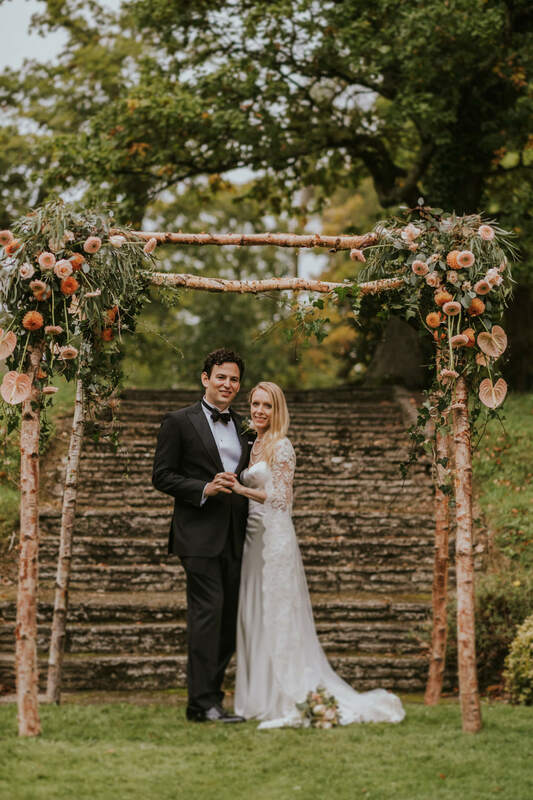 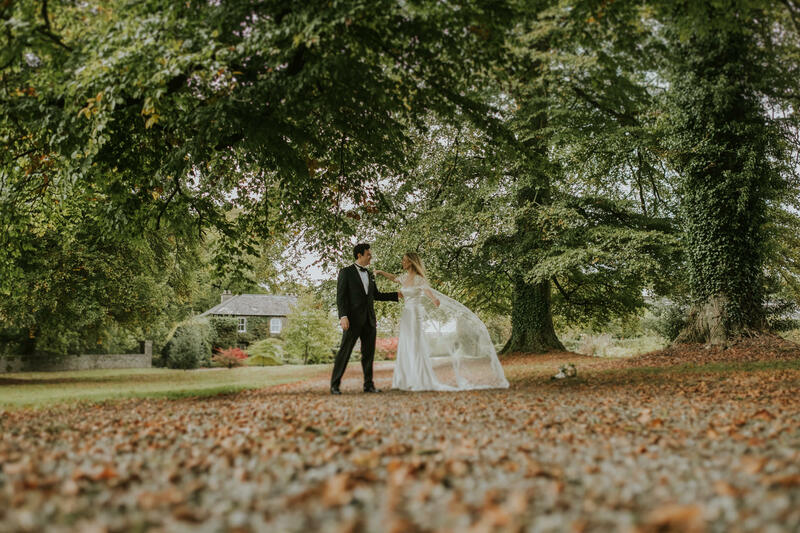 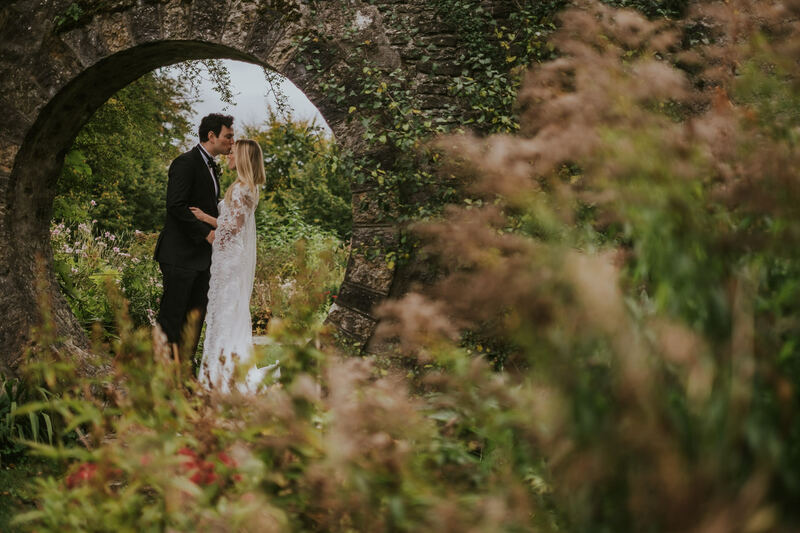 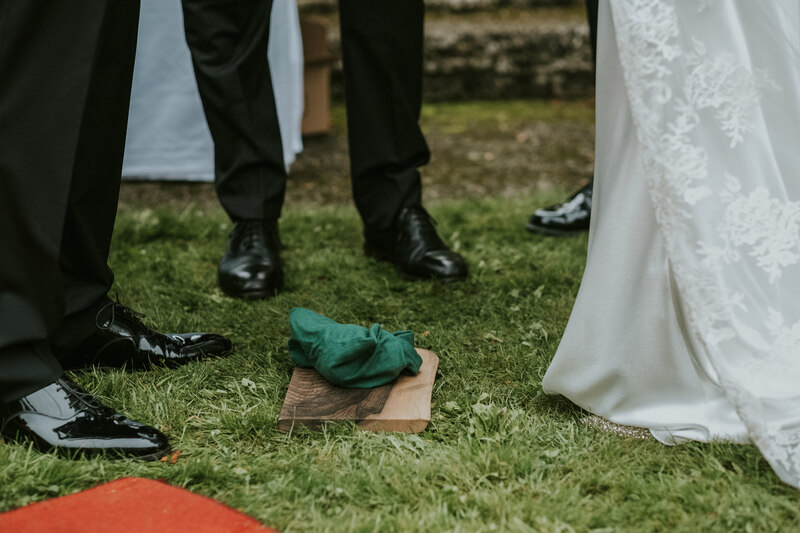 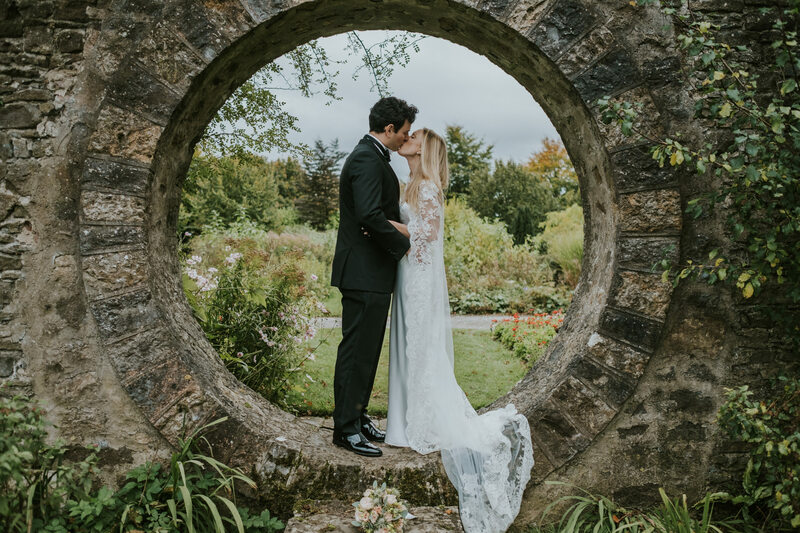 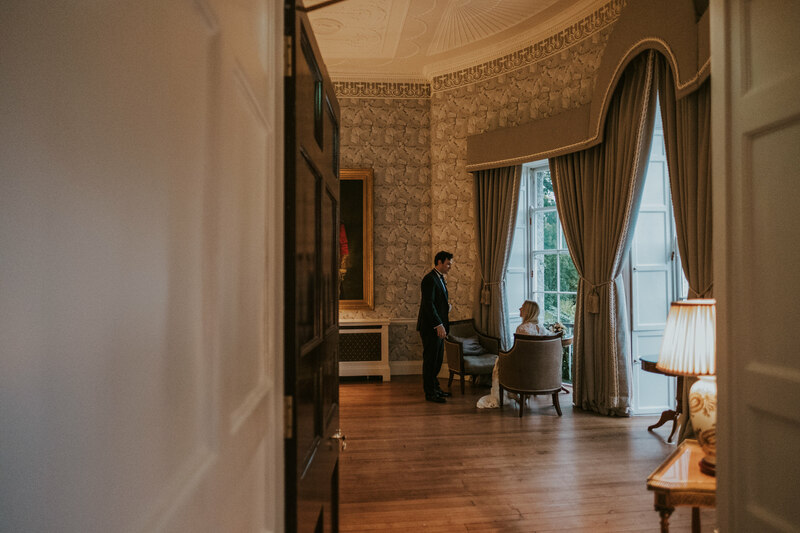 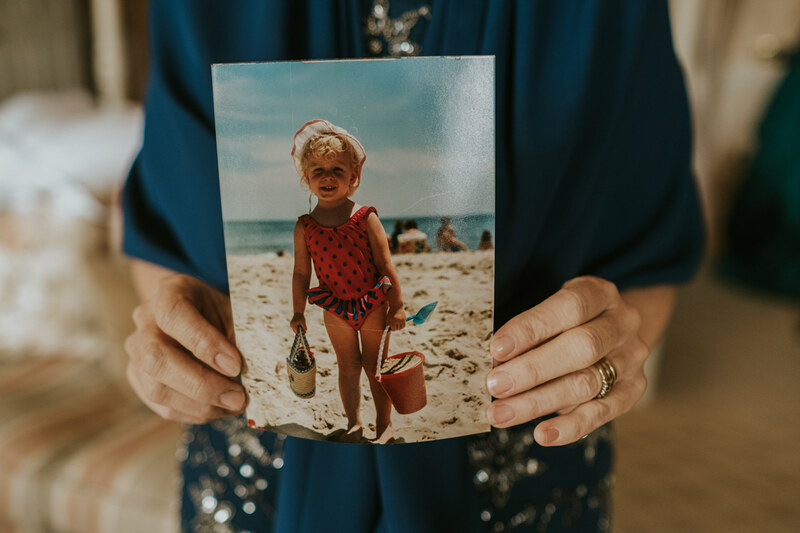 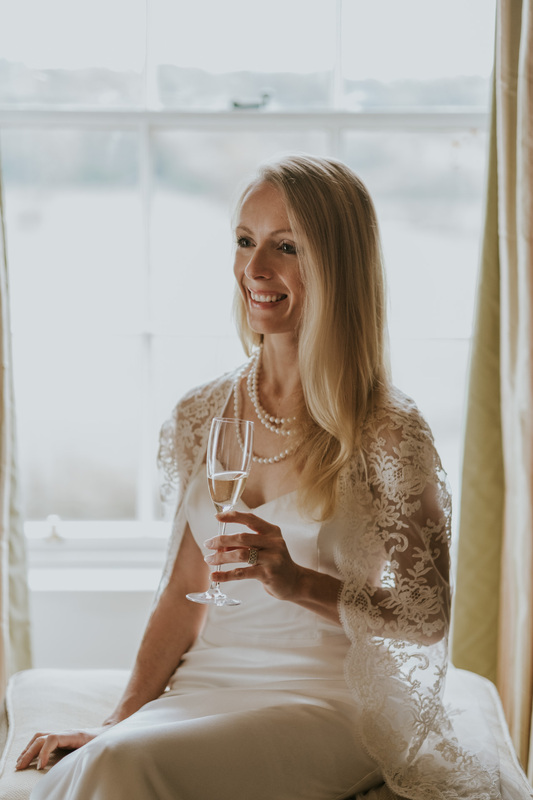 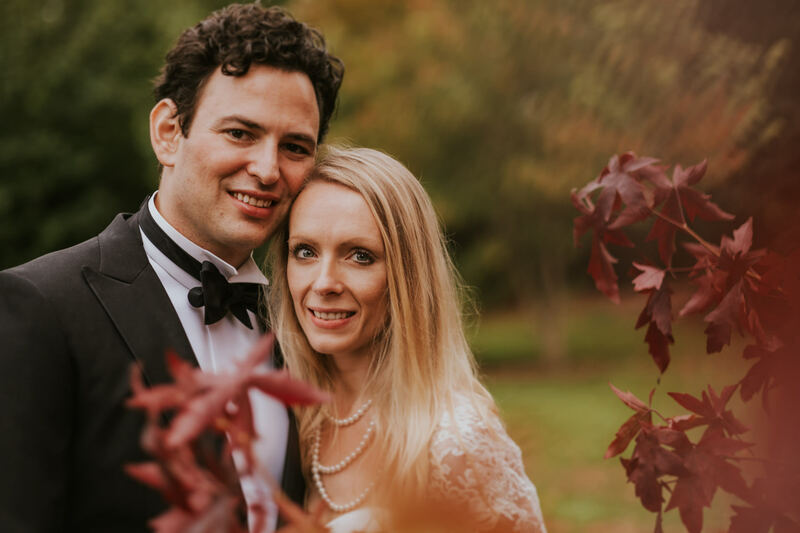 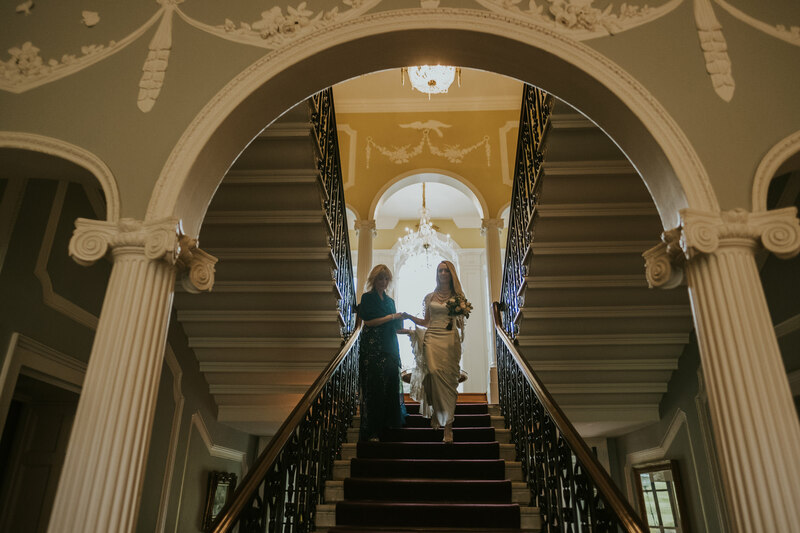 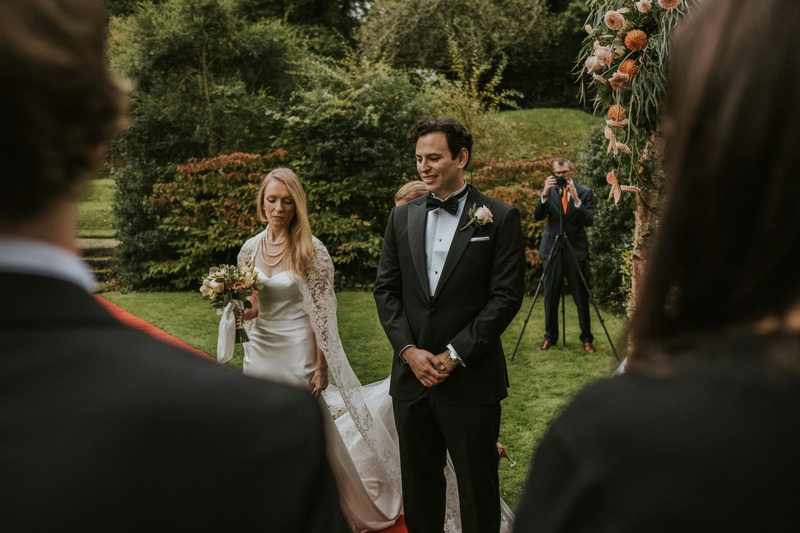 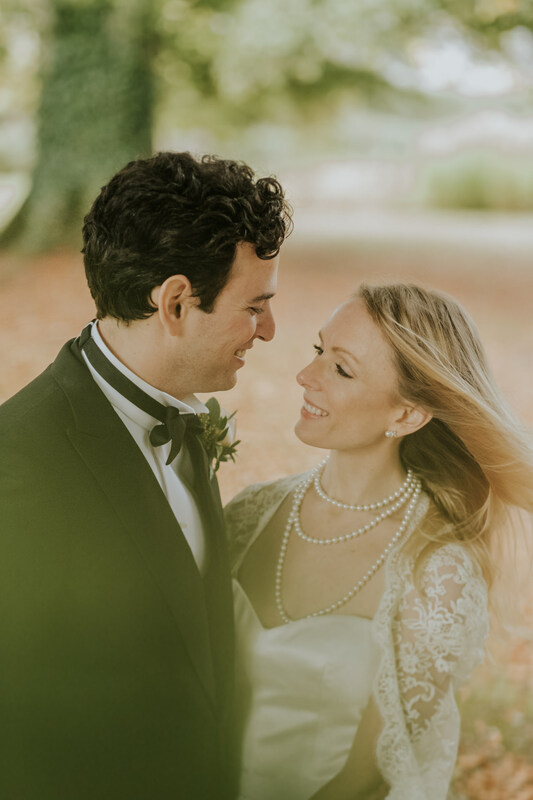 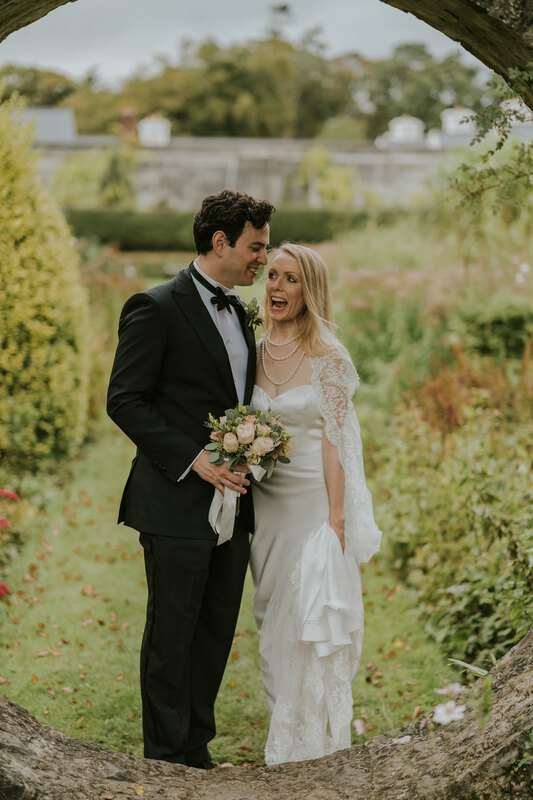 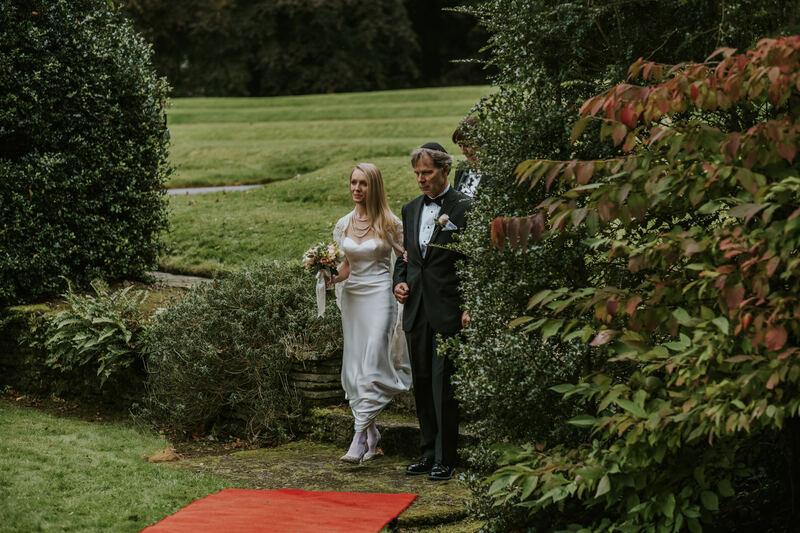 Even though they both hail from the US, Sarah and Michael chose Ireland, for their stunning Mount Juliette Estate wedding. 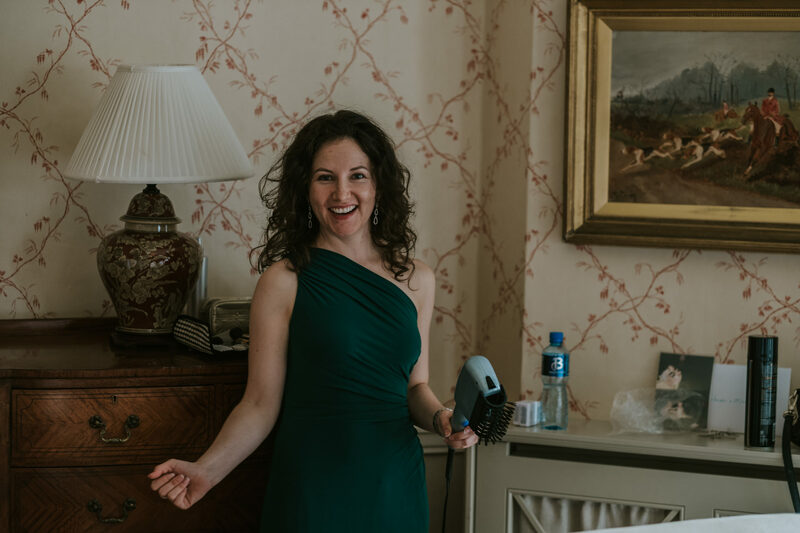 Sarah had spent time in Ireland studying in the Royal College of Surgeons and whilst here fell in love with Ireland and notably Kilkenny. 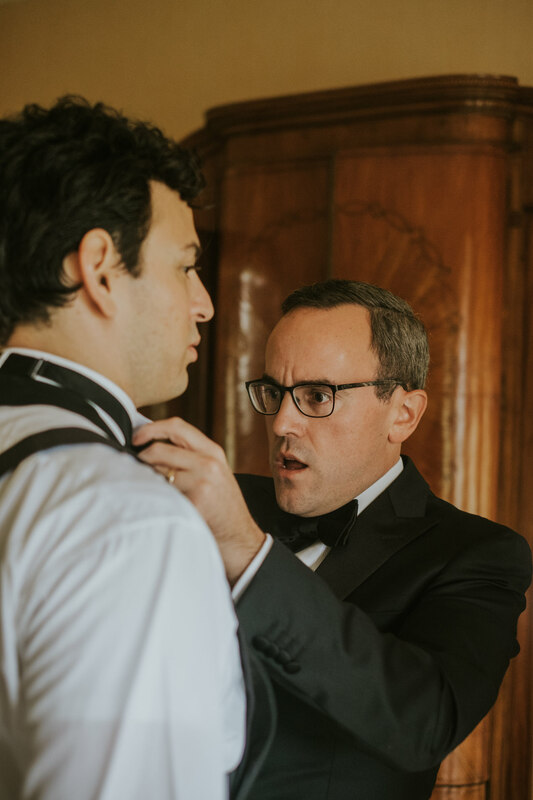 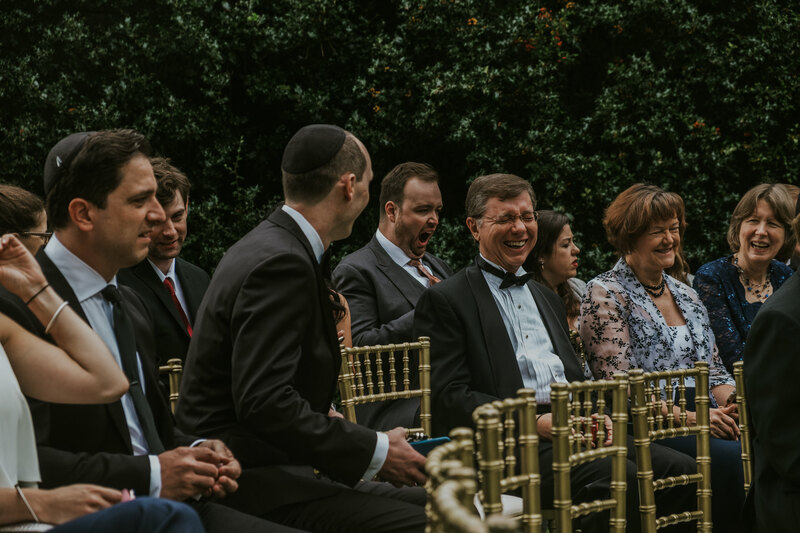 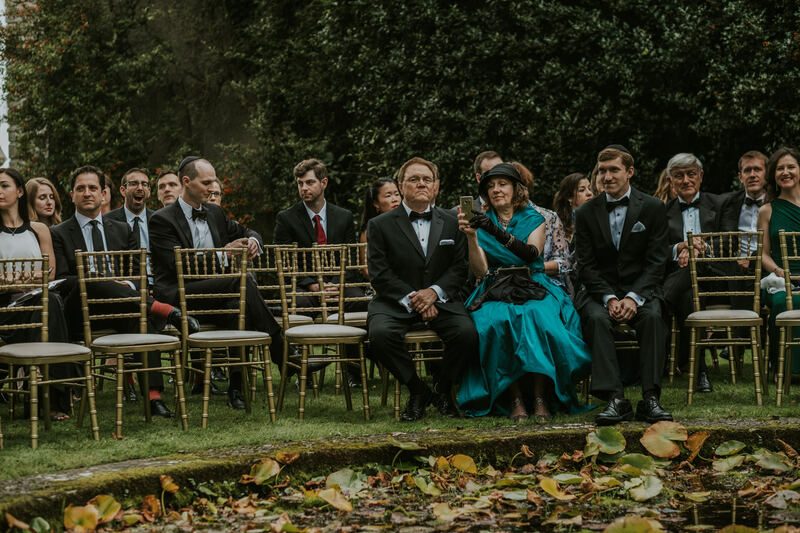 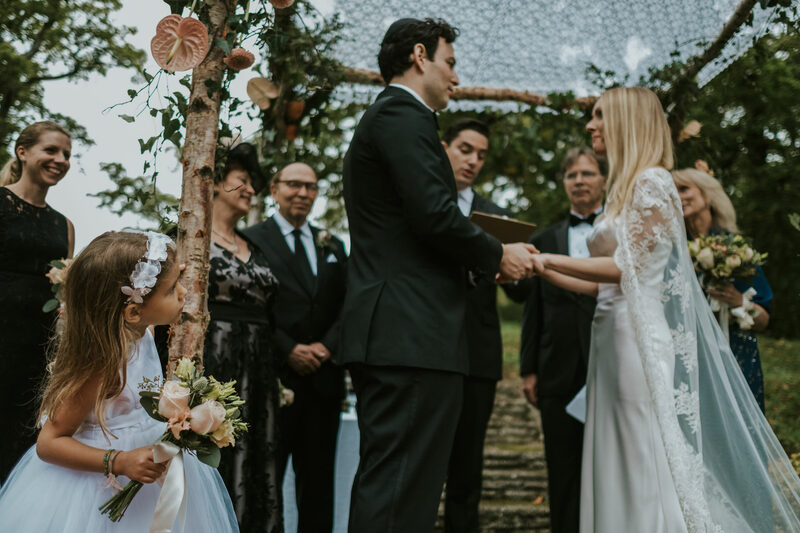 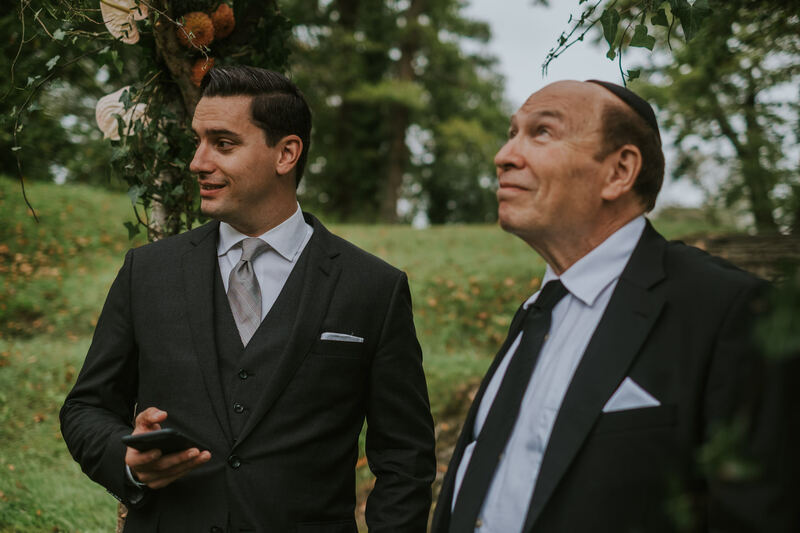 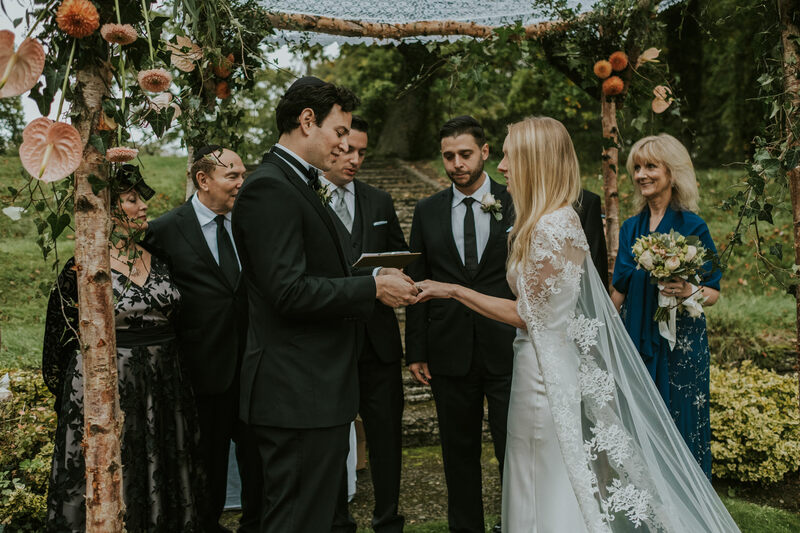 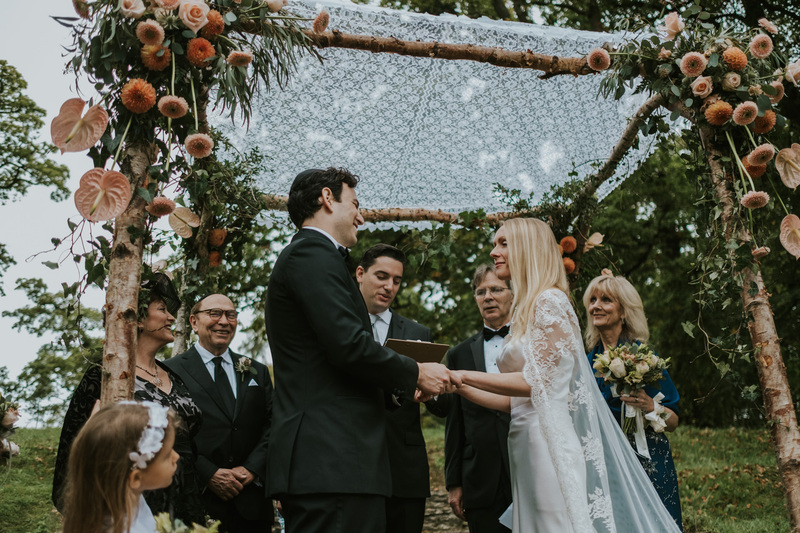 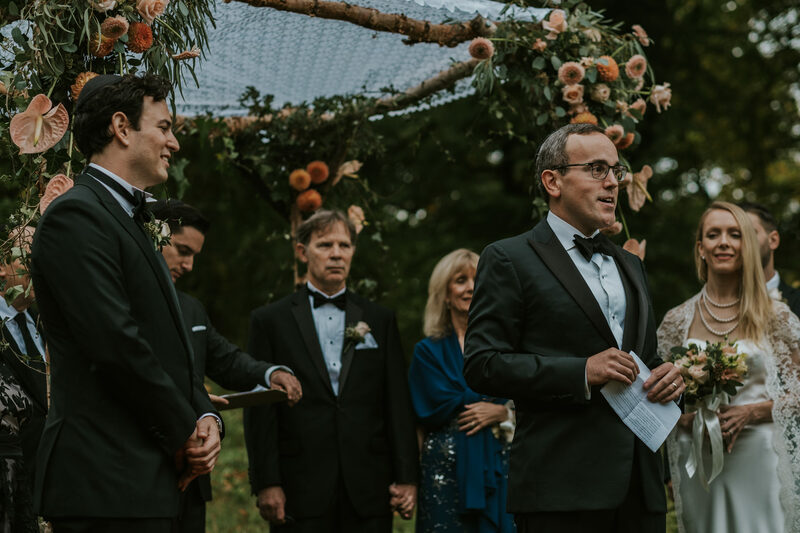 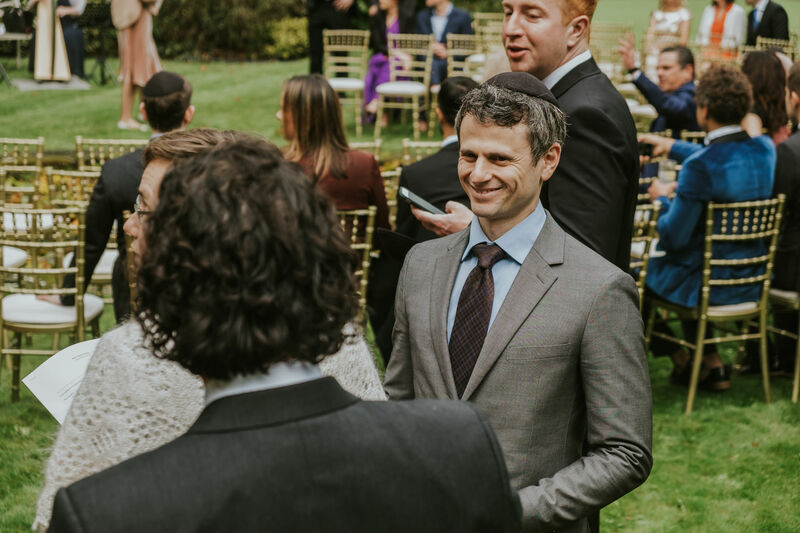 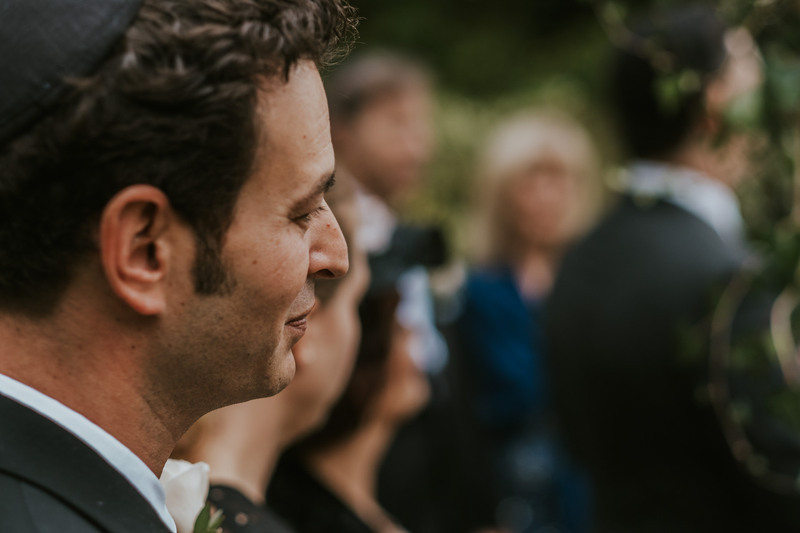 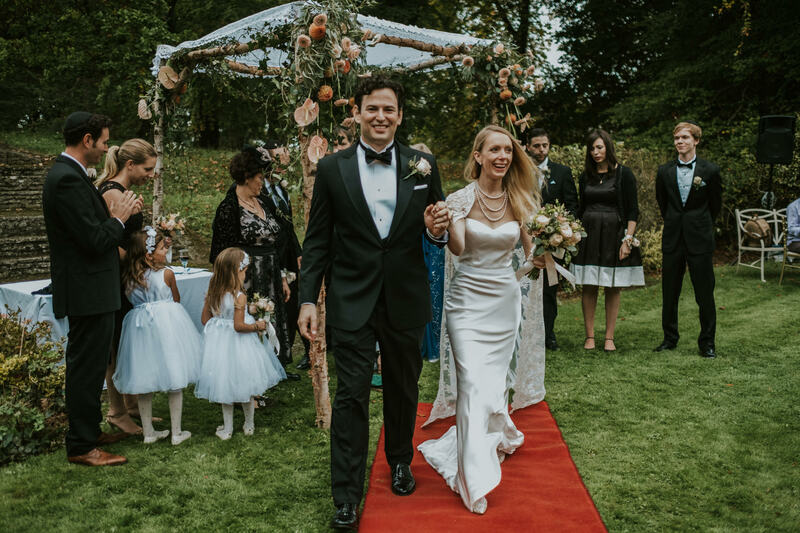 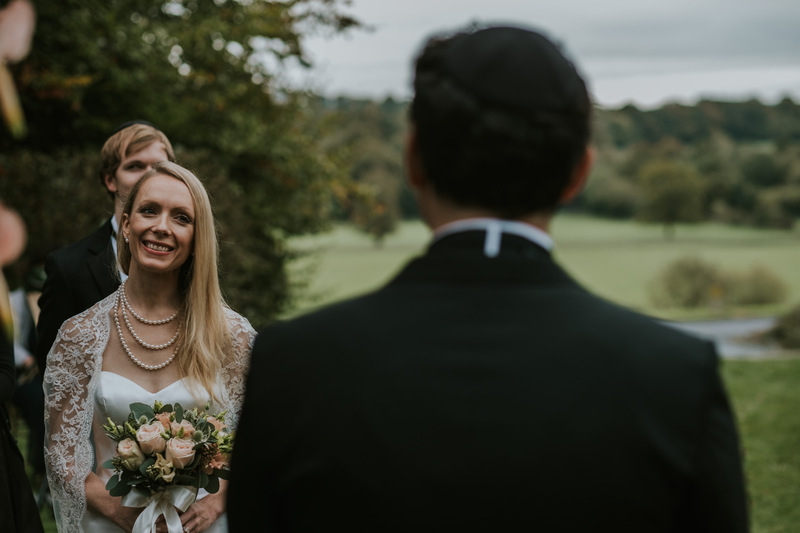 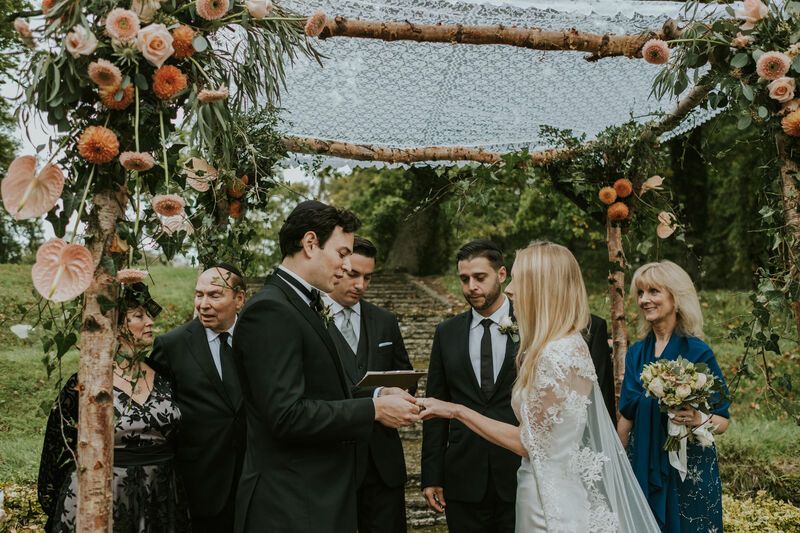 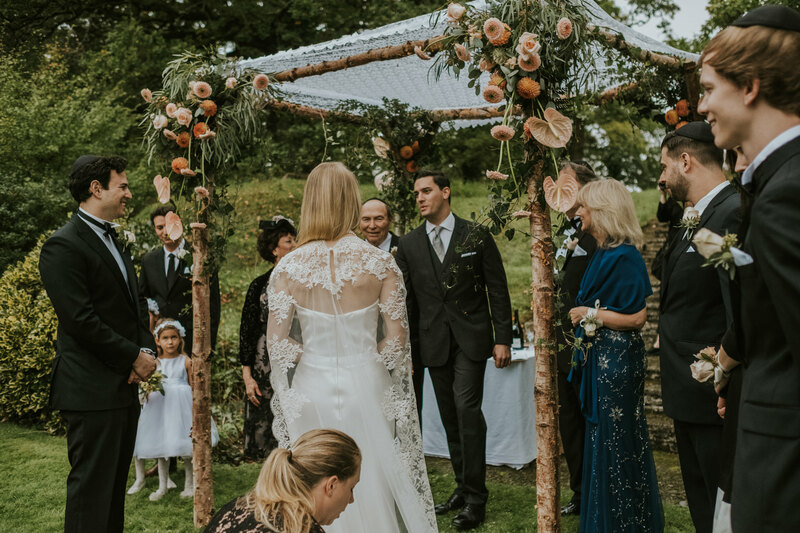 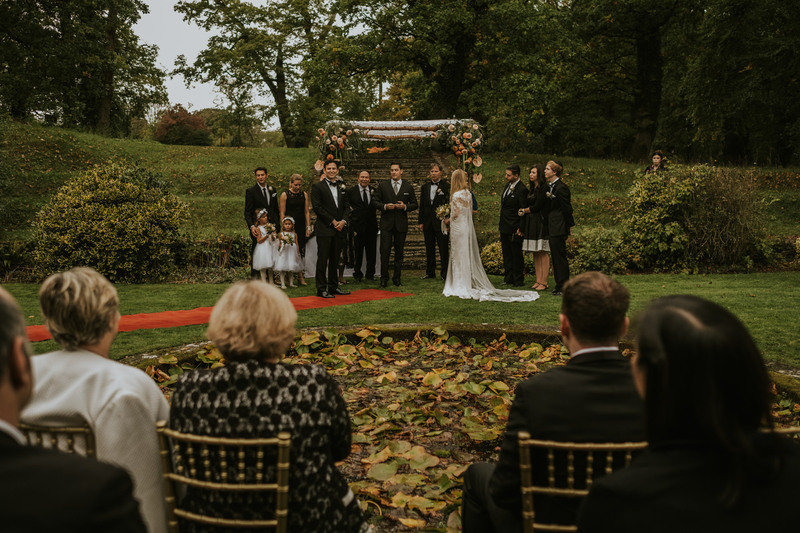 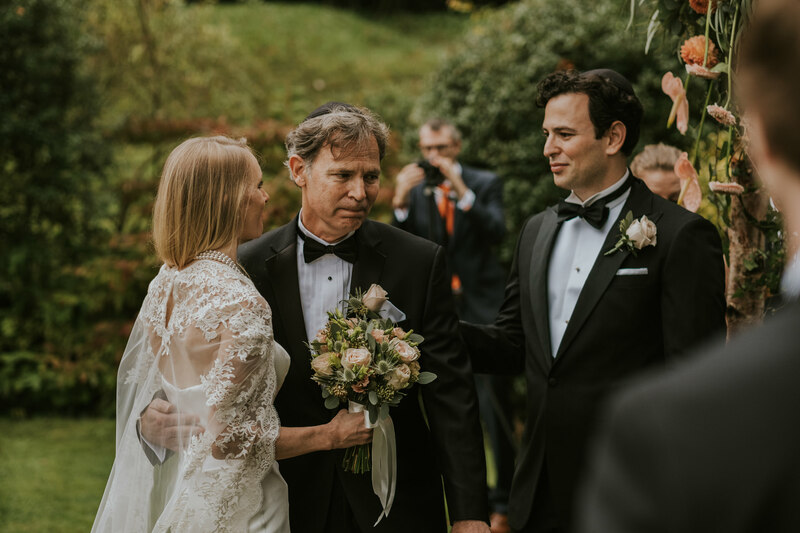 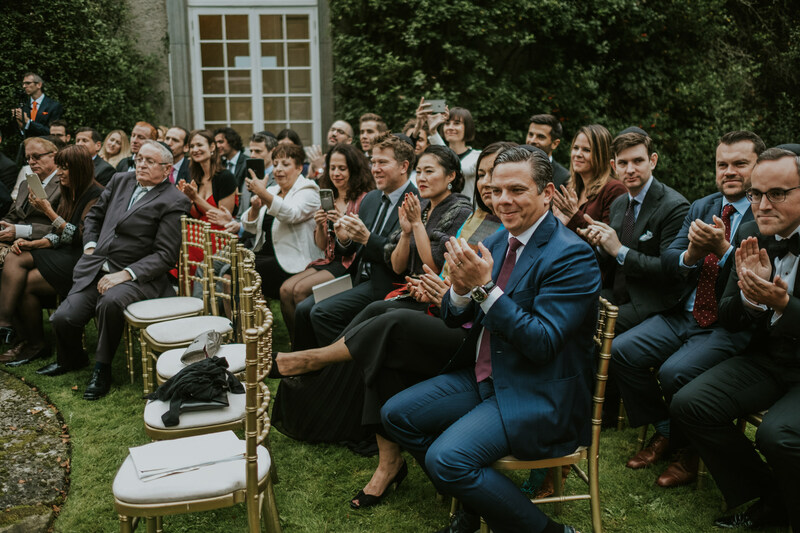 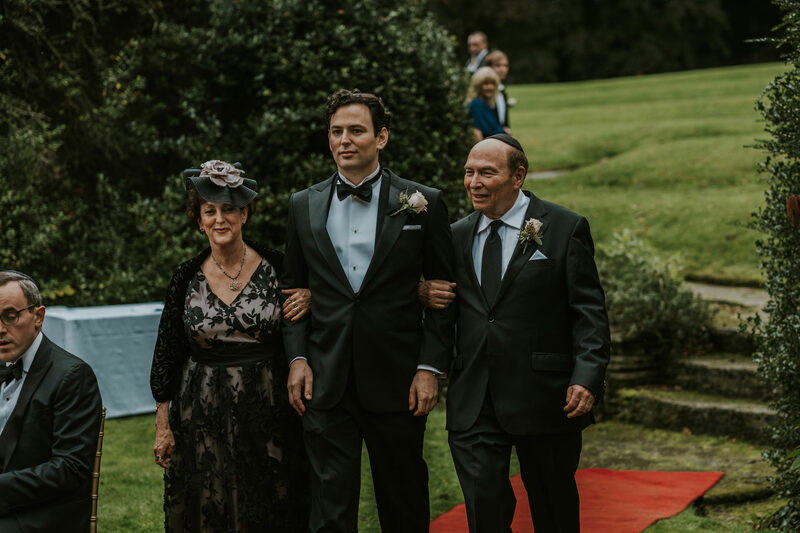 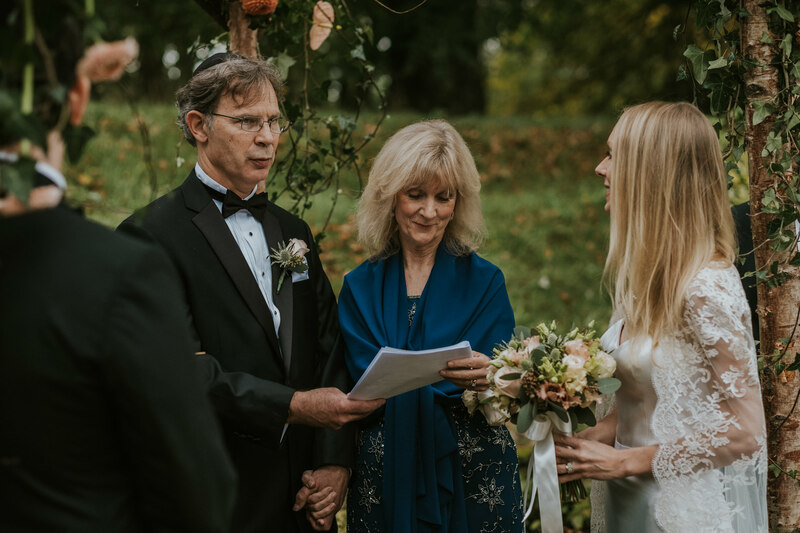 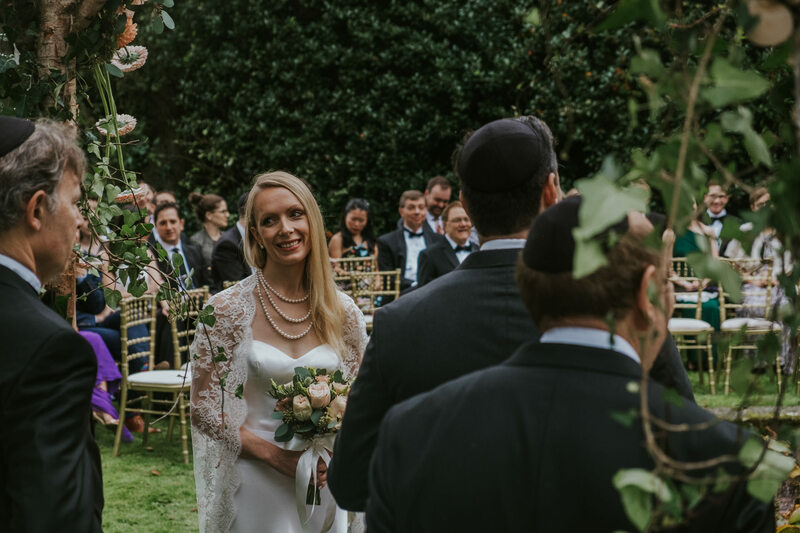 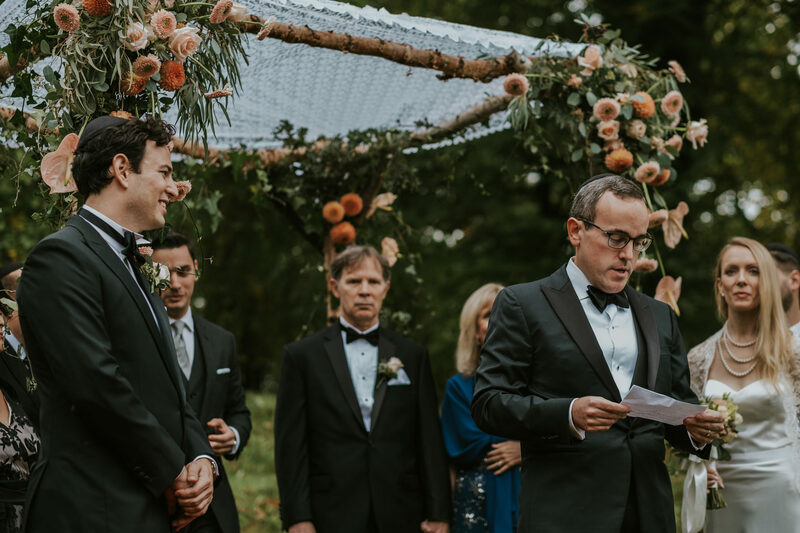 Sarah and Michael’s traditional Jewish ceremony took place amid one of Mount Juliette’s stunning gardens. 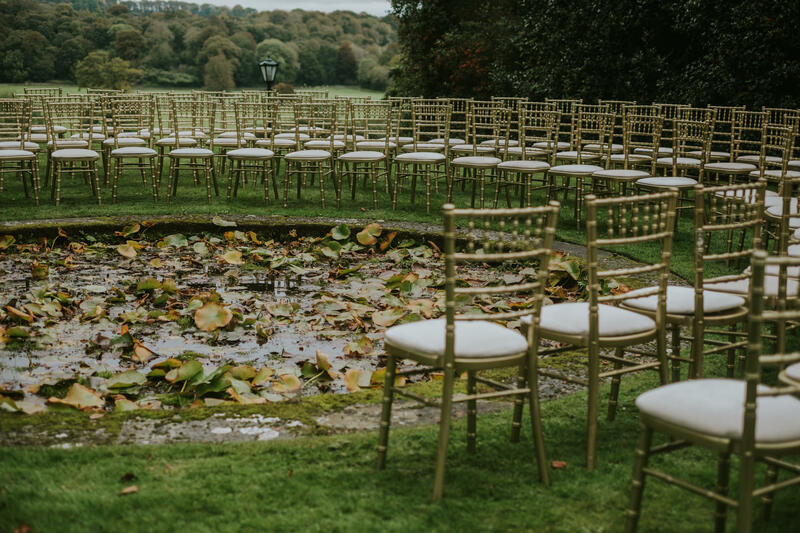 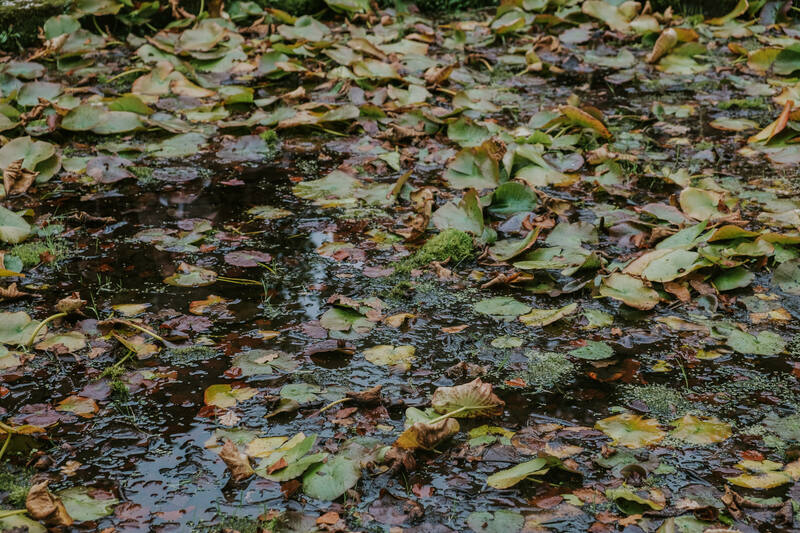 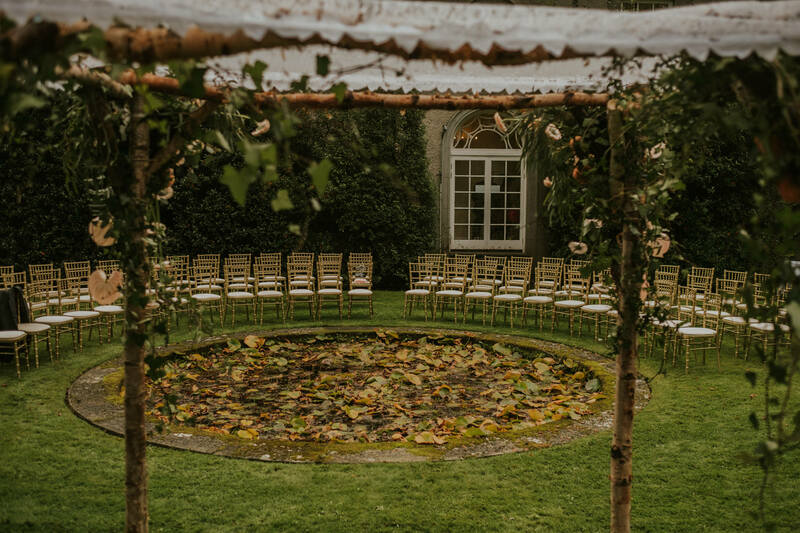 Guest’s encircled a naturally canopied pond while waiting for the couple. 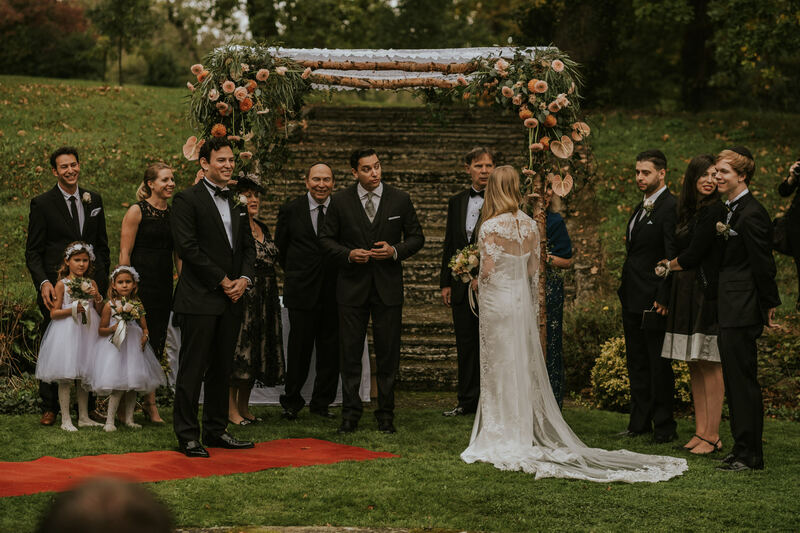 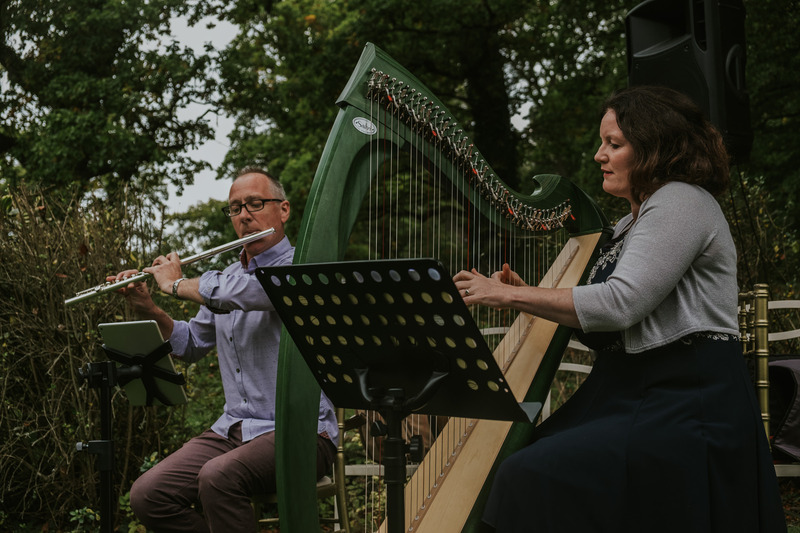 Harpists thrummed a beautiful melody as the bride was guided to her future husband. 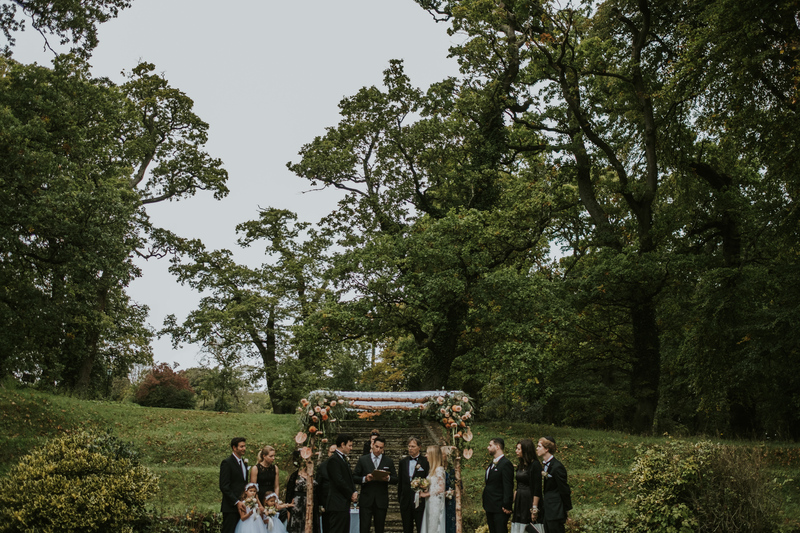 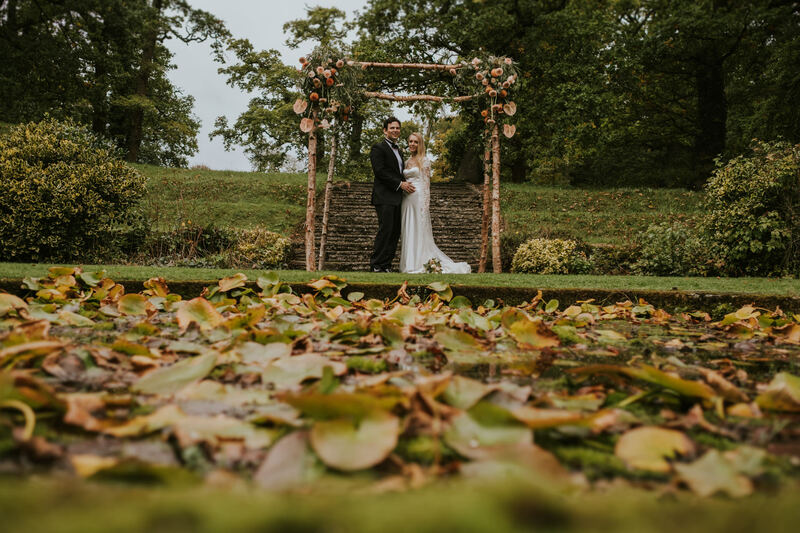 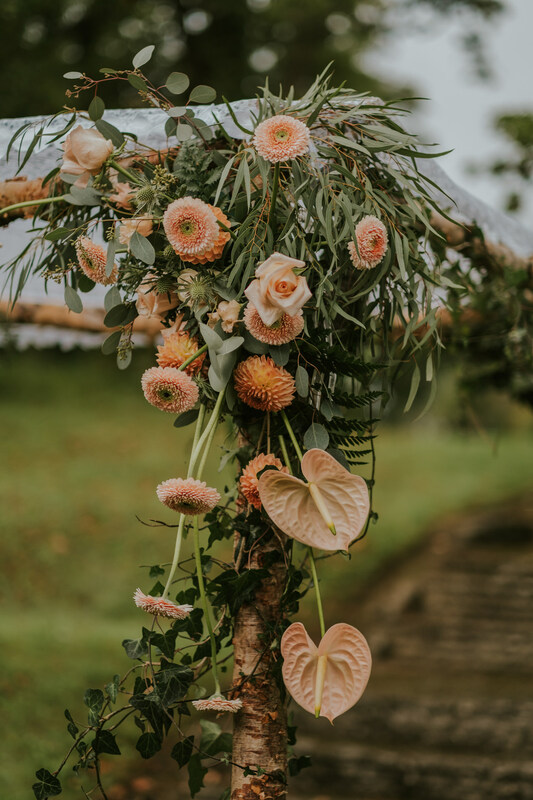 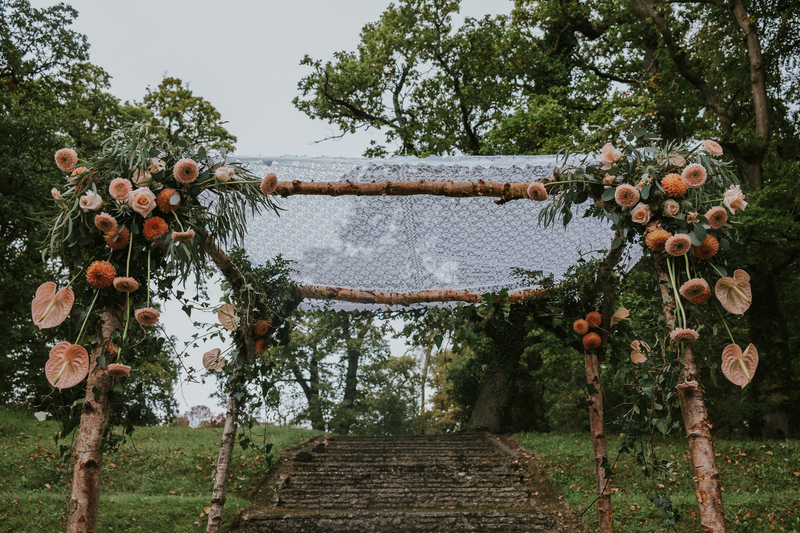 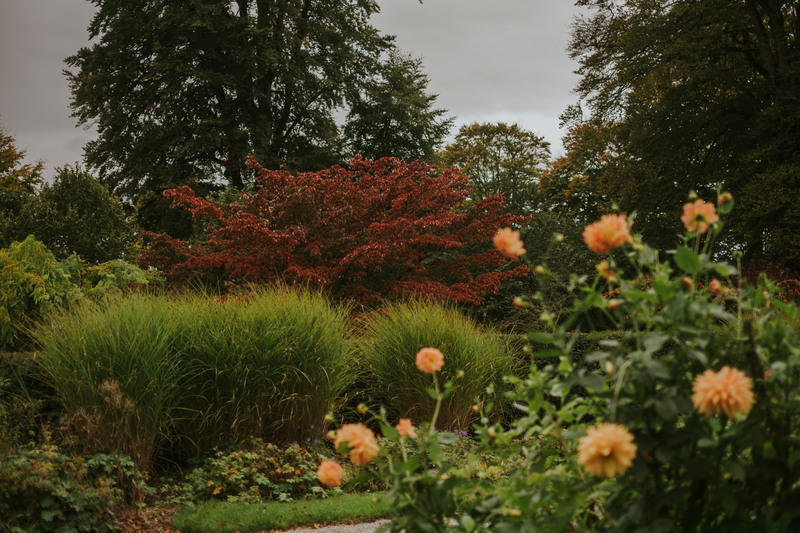 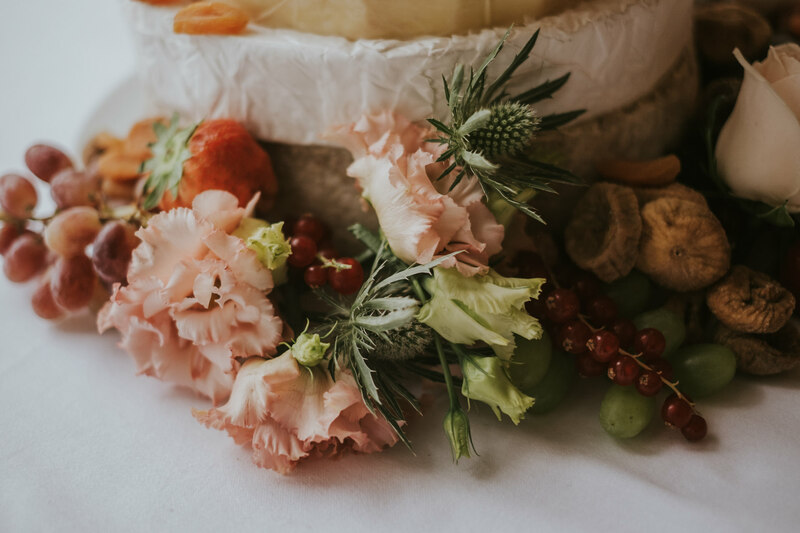 The couple exchanged their vows beneath a canopy of lace decorated with trailing bouquets of autumnal flowers. 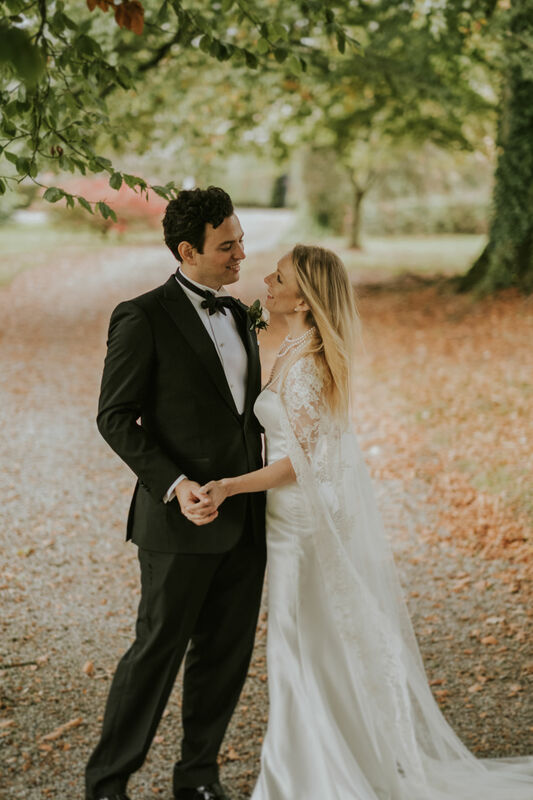 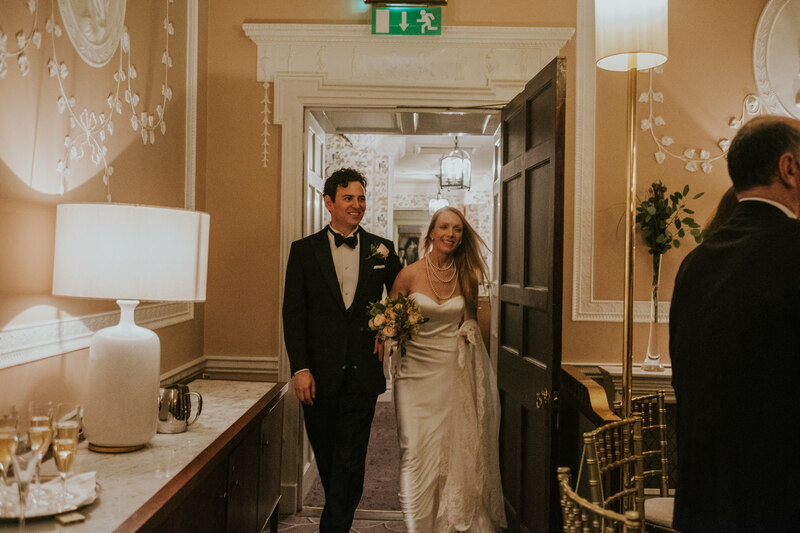 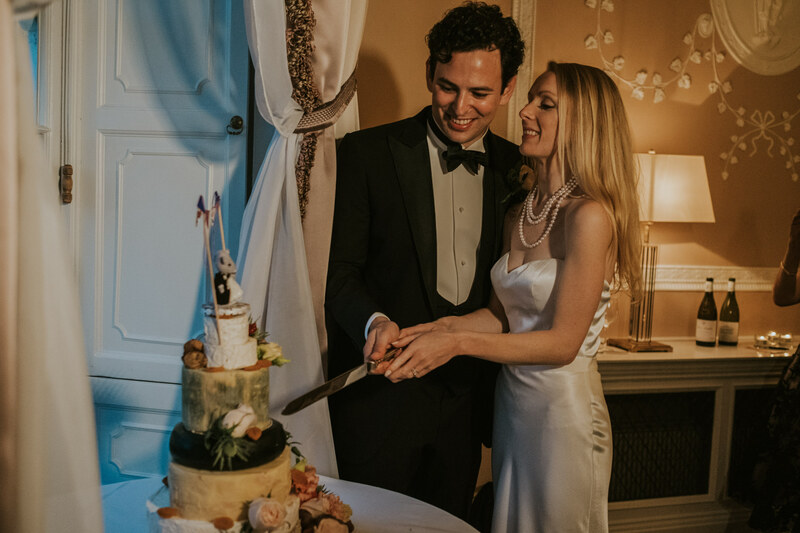 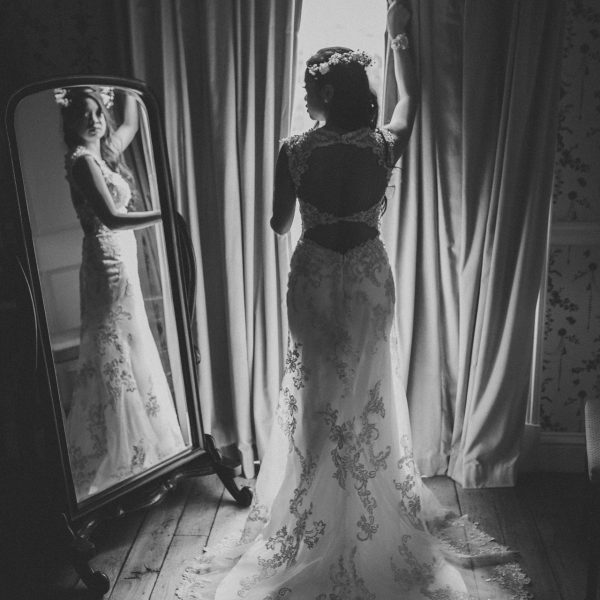 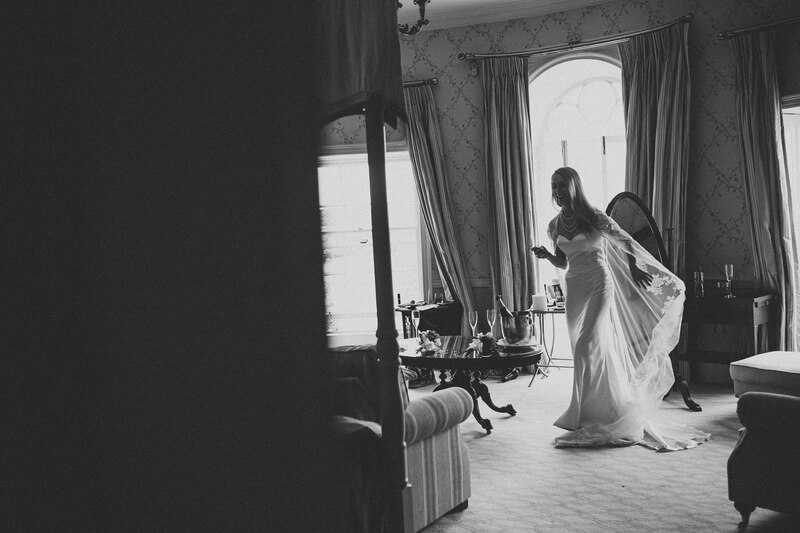 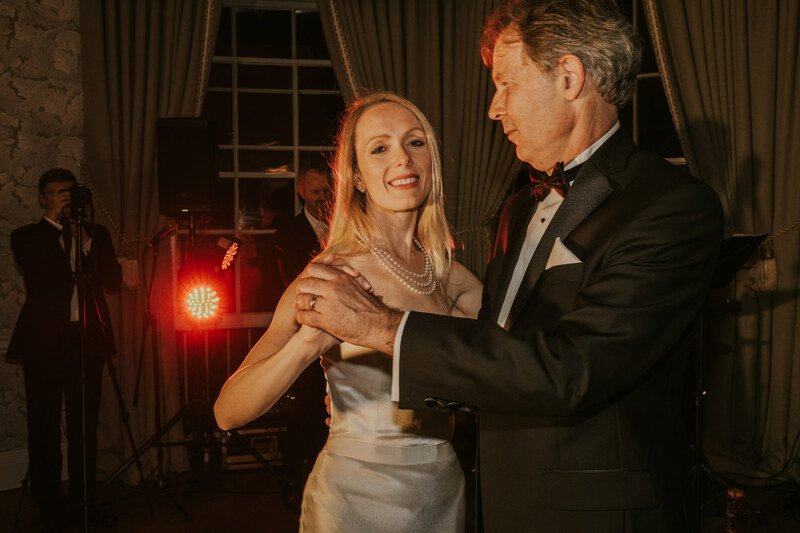 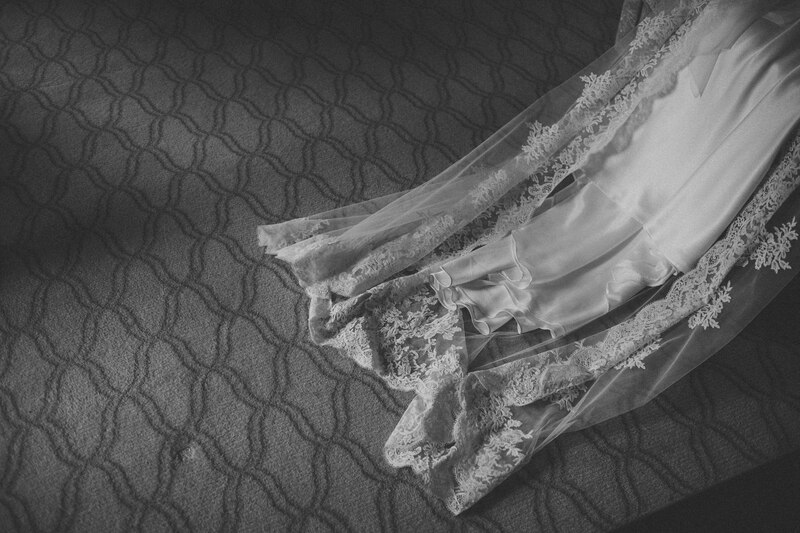 Sarah looked radiant in her stunning Gemmy Maalouf Gown. 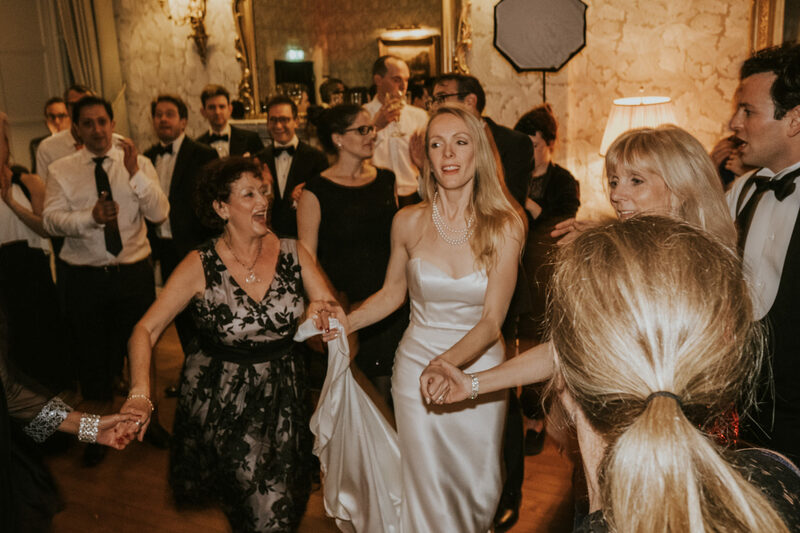 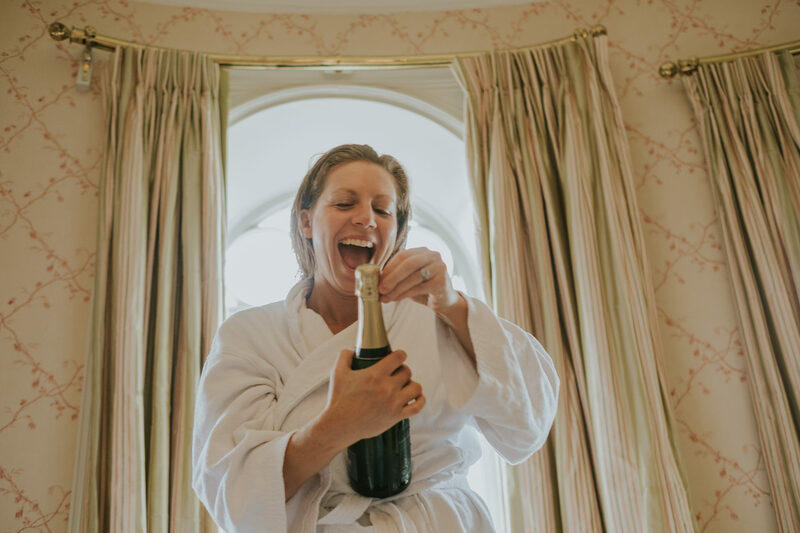 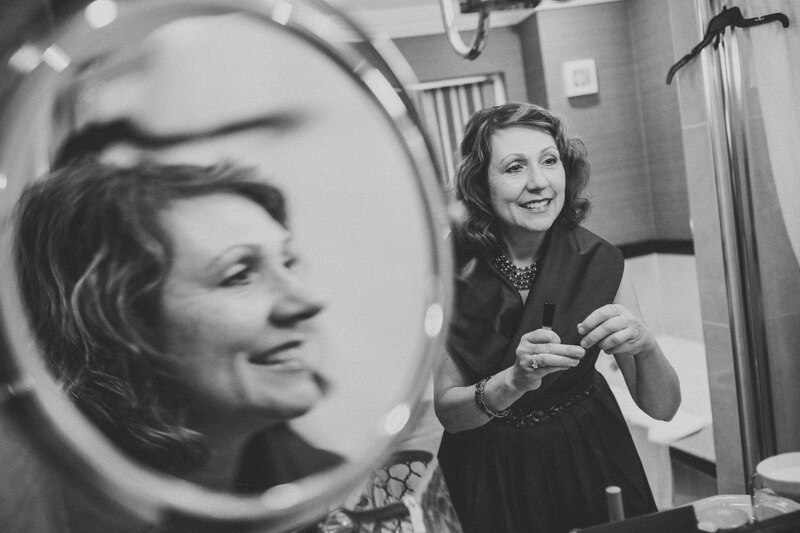 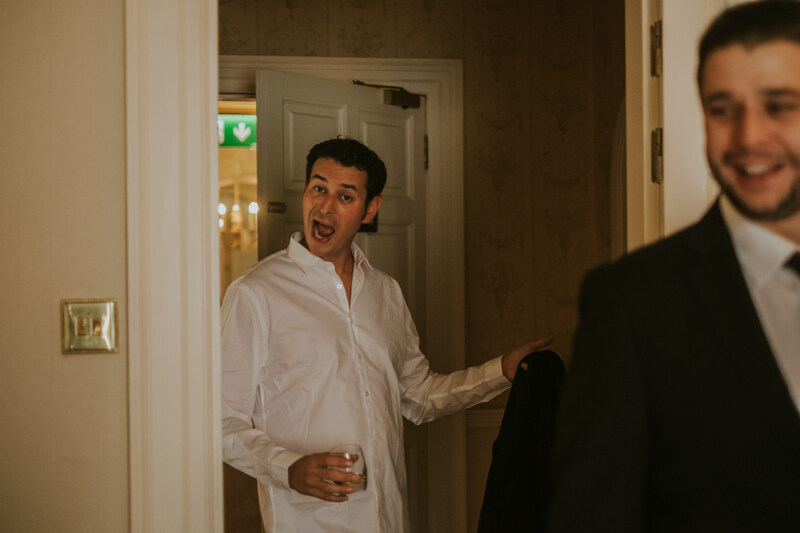 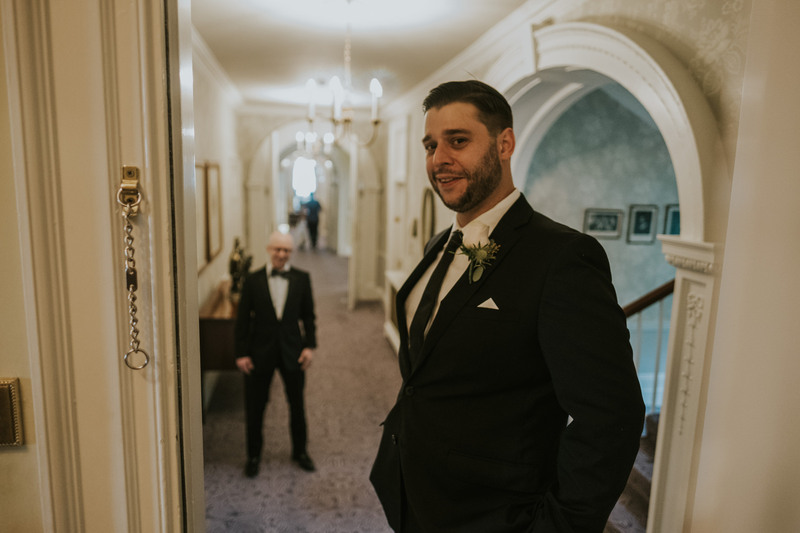 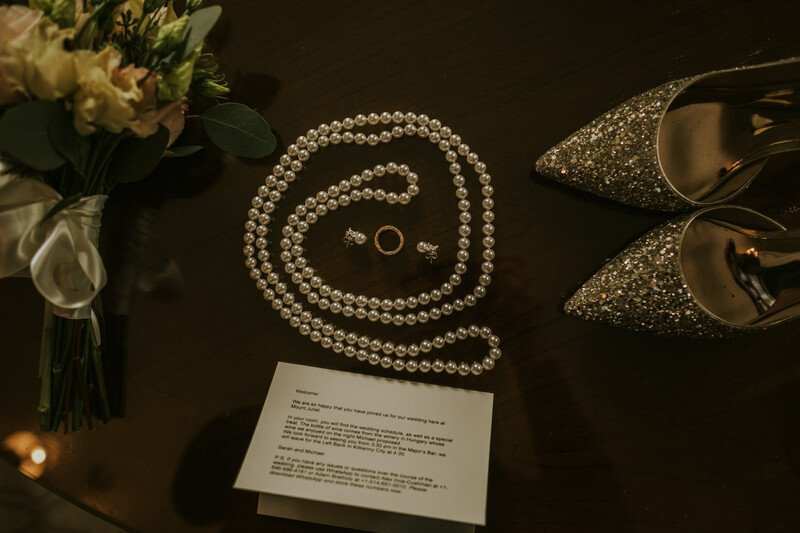 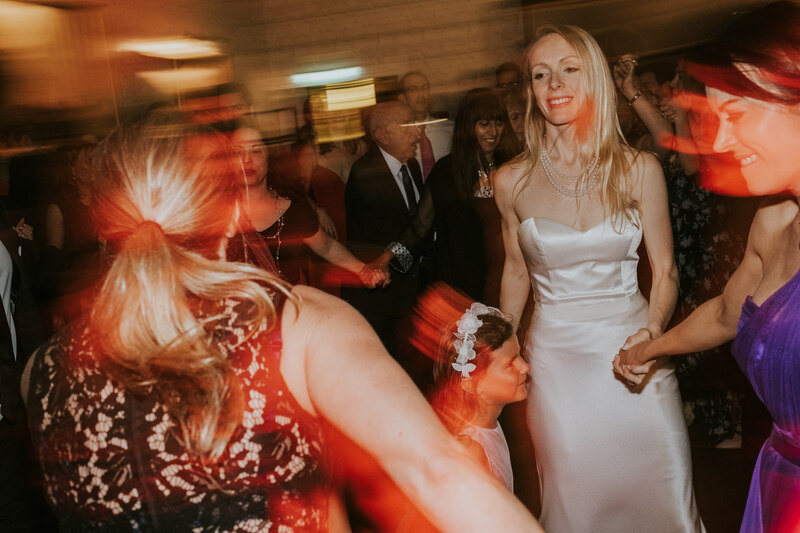 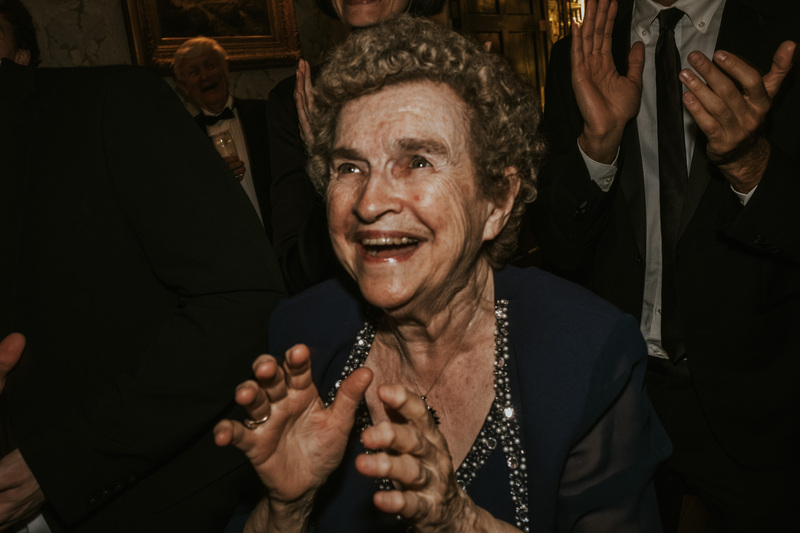 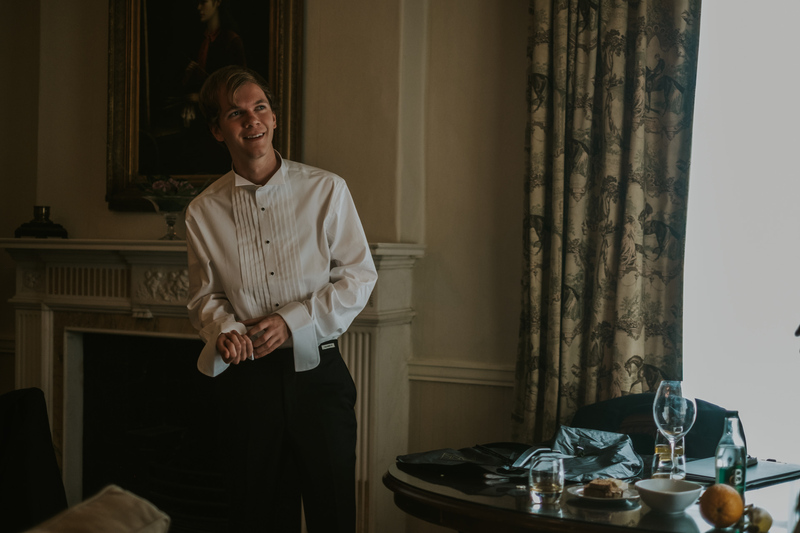 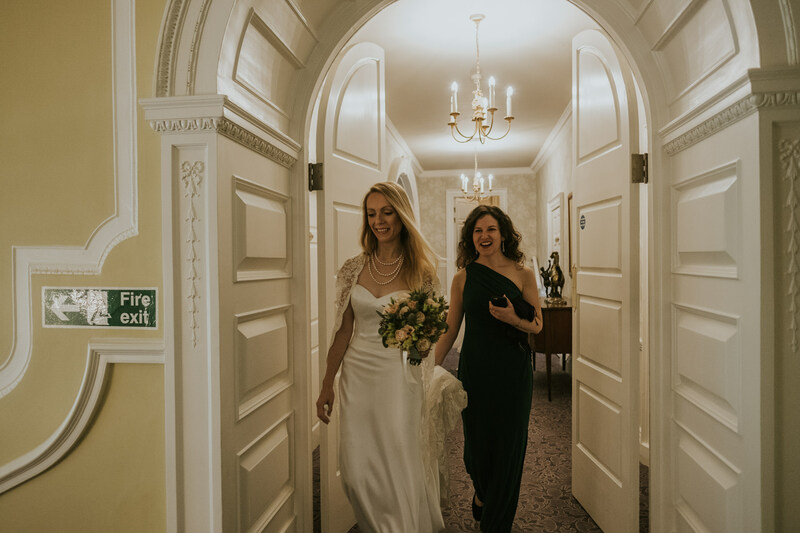 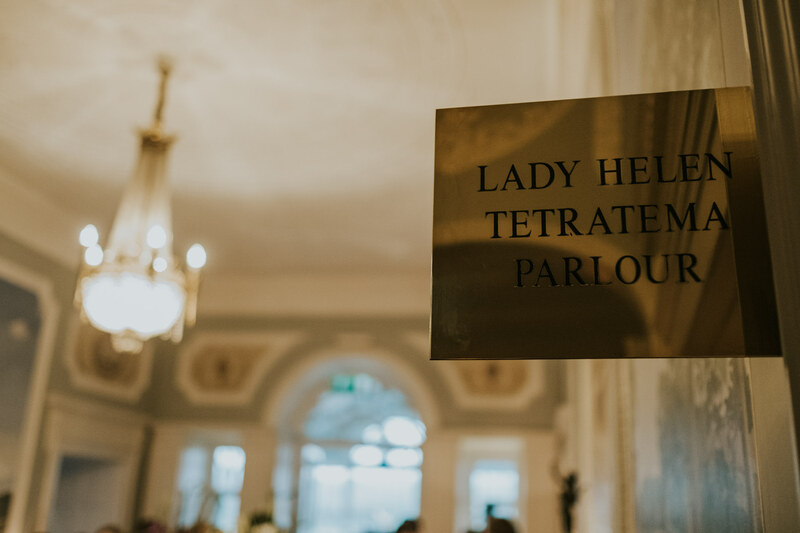 After the ceremony, the guests retreated back into the hotel and the celebrations began. 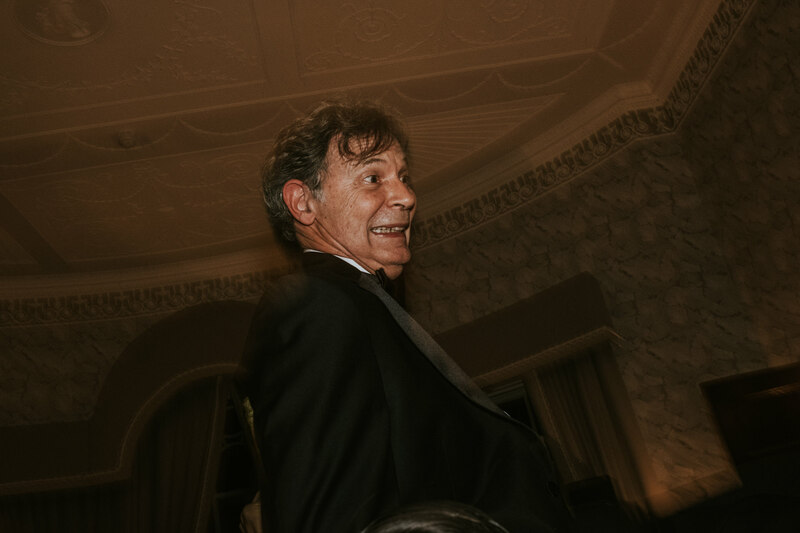 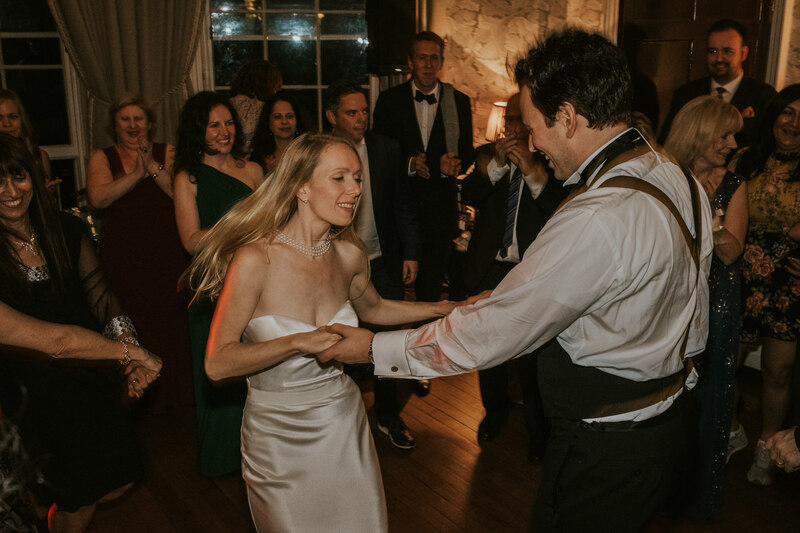 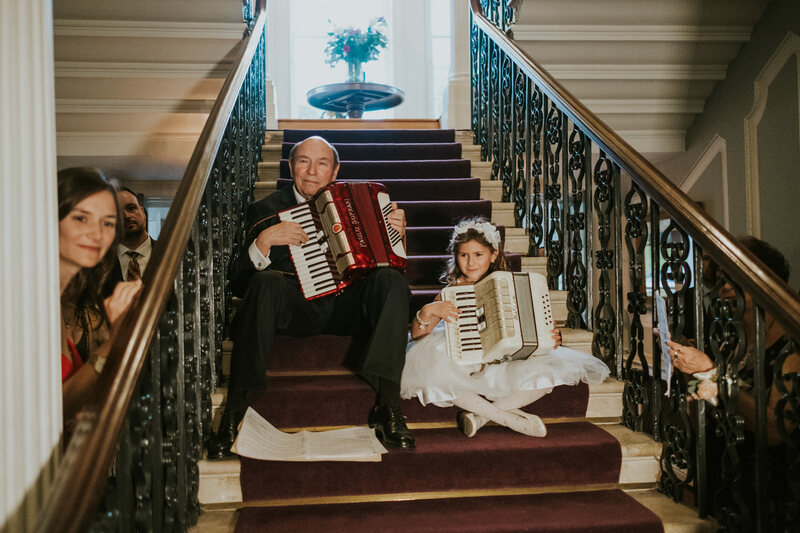 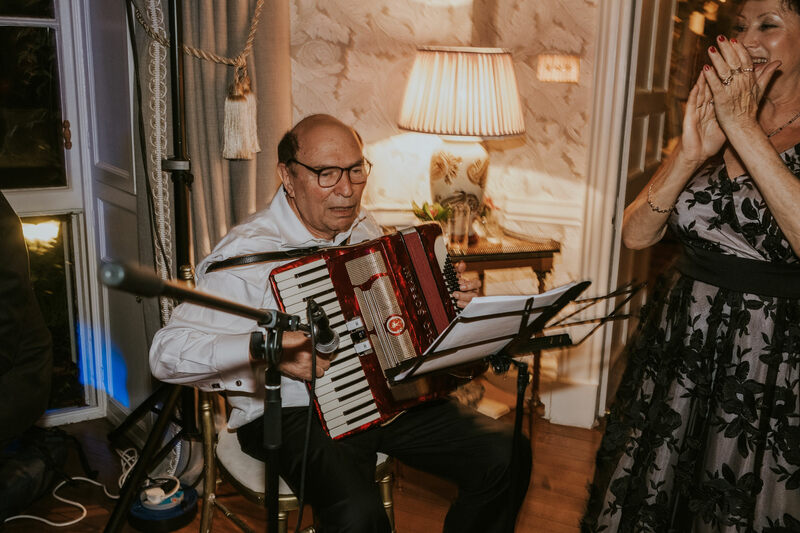 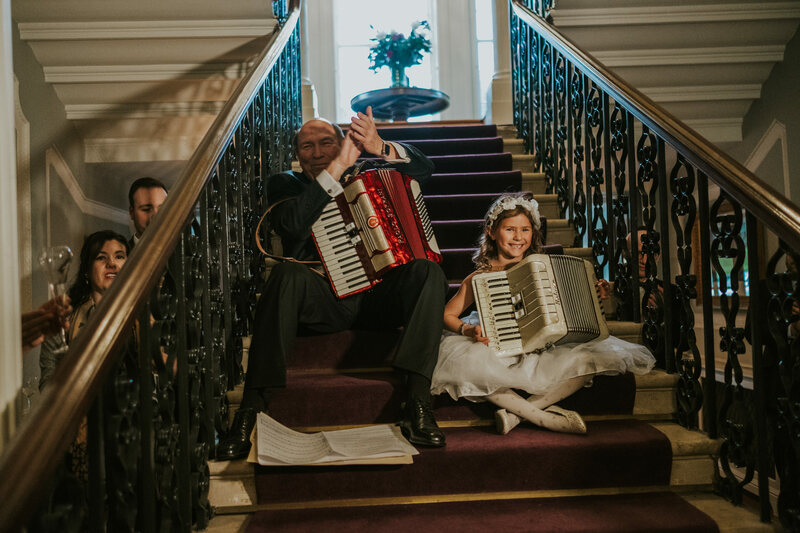 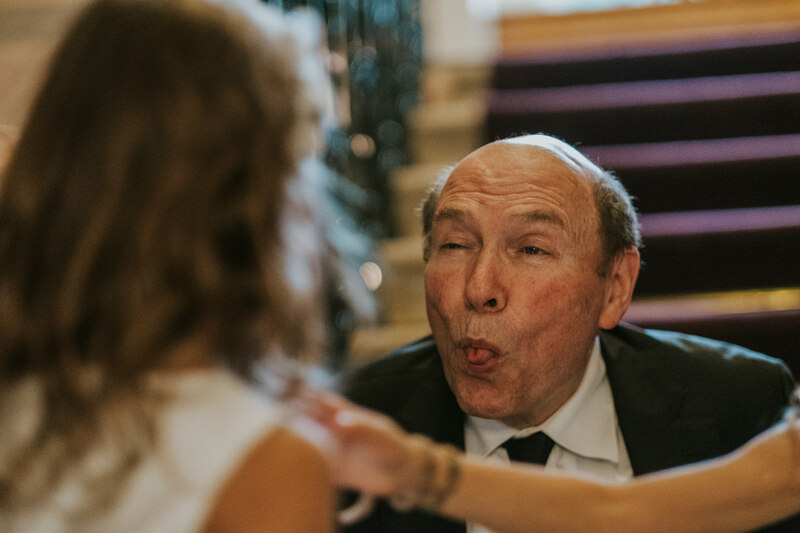 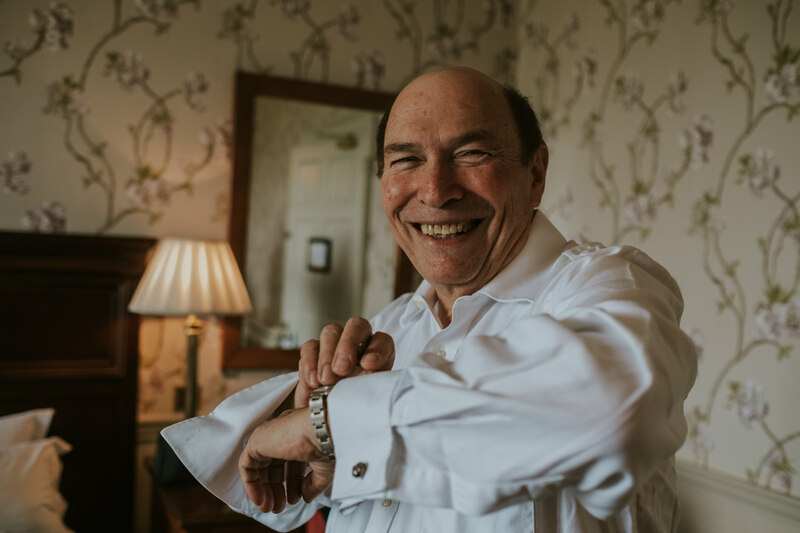 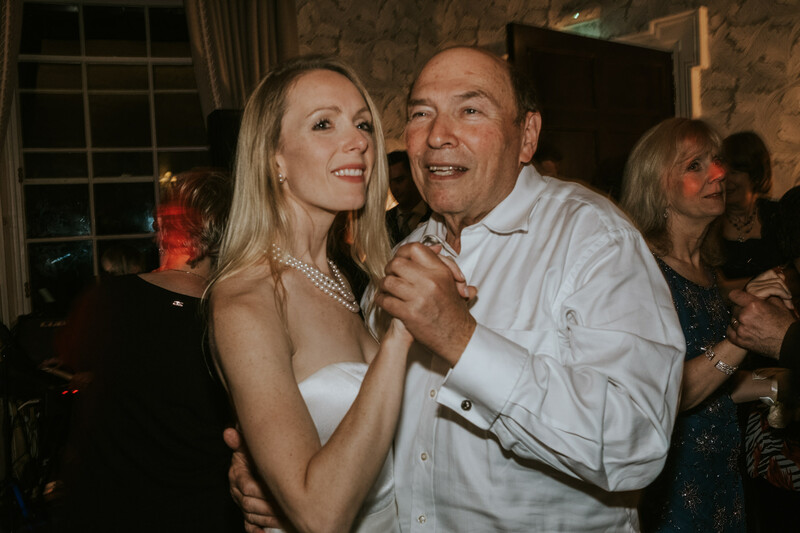 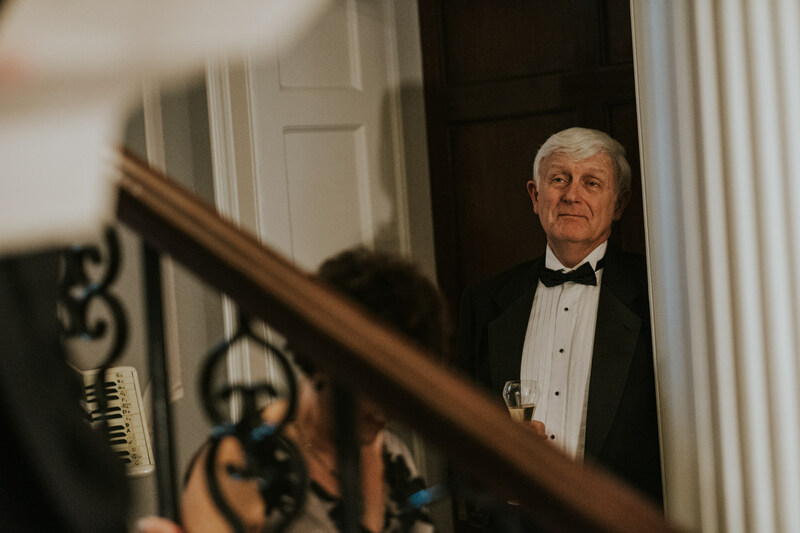 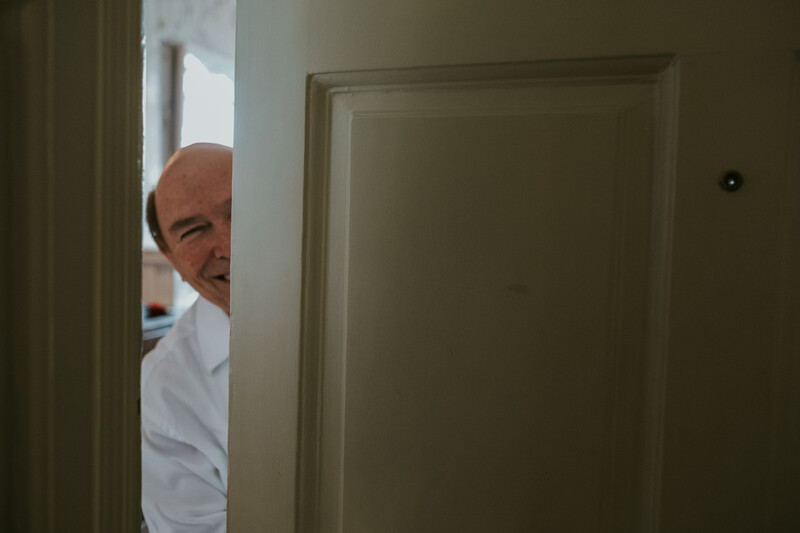 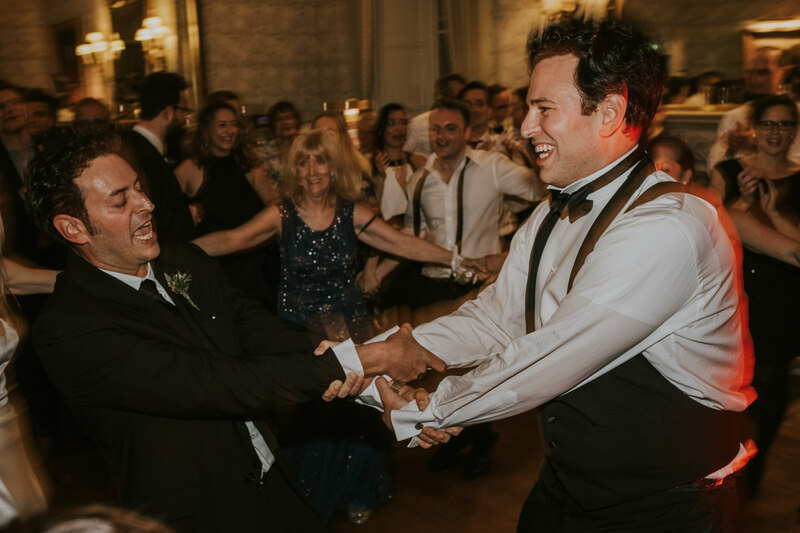 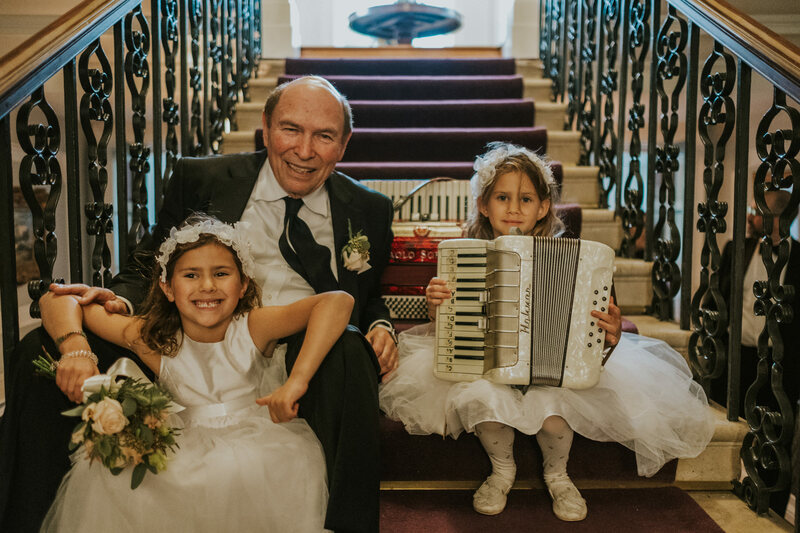 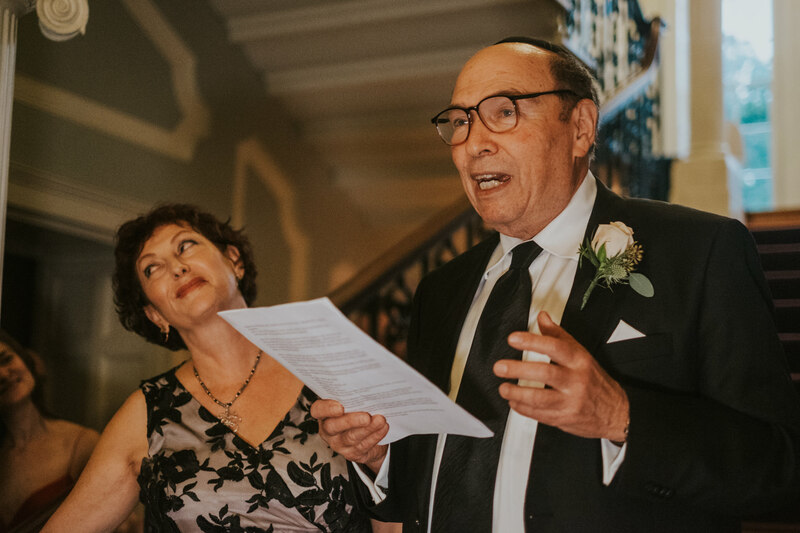 Following many teary speeches, the Father of the groom and his young granddaughter took out their accordions and played a fantastic musical duet to much applause from the guests. 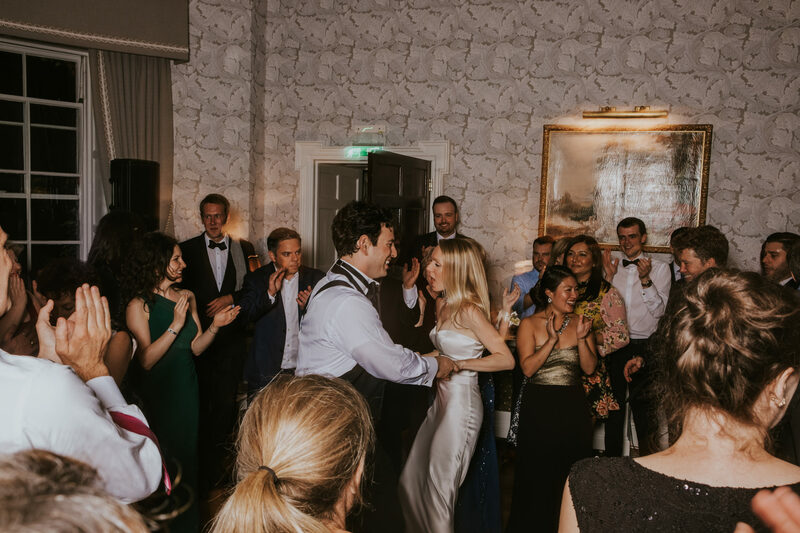 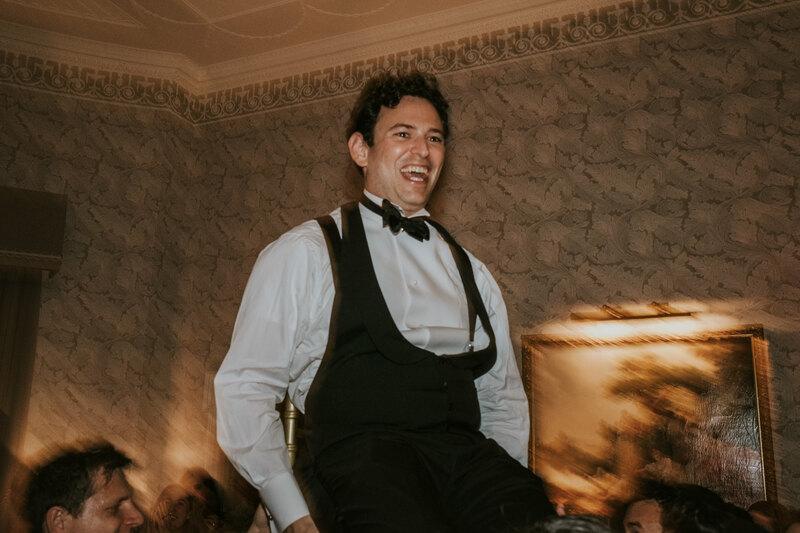 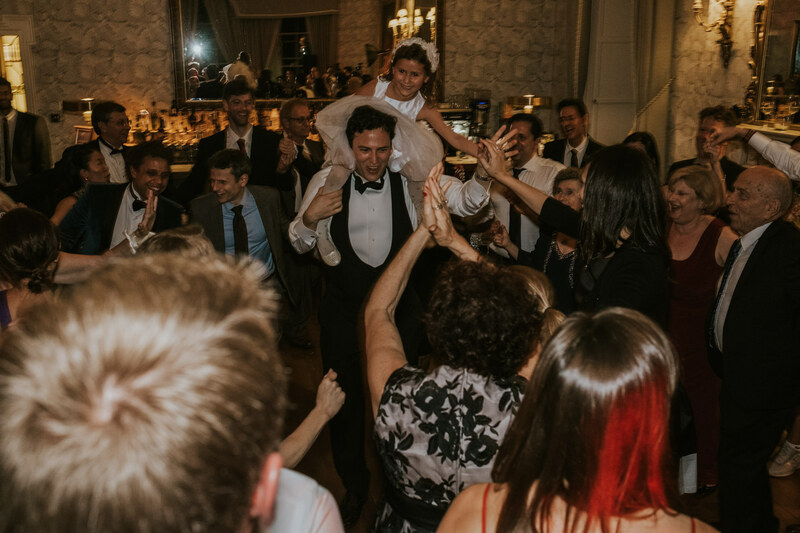 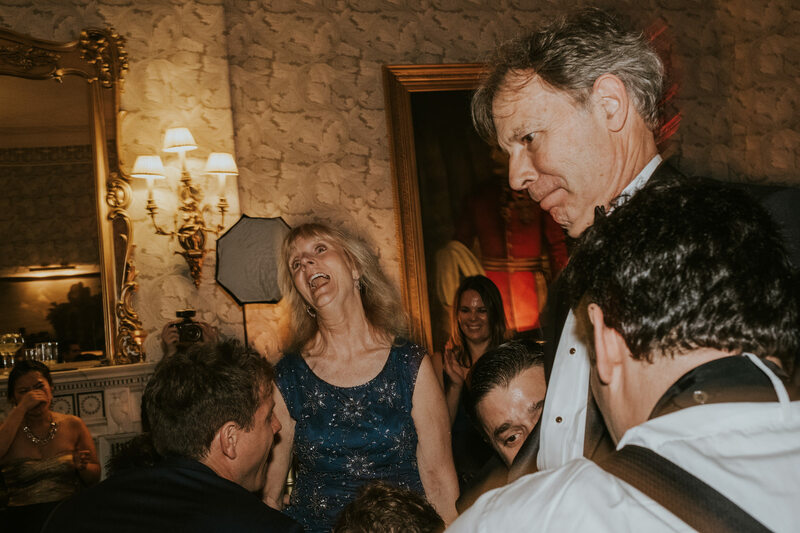 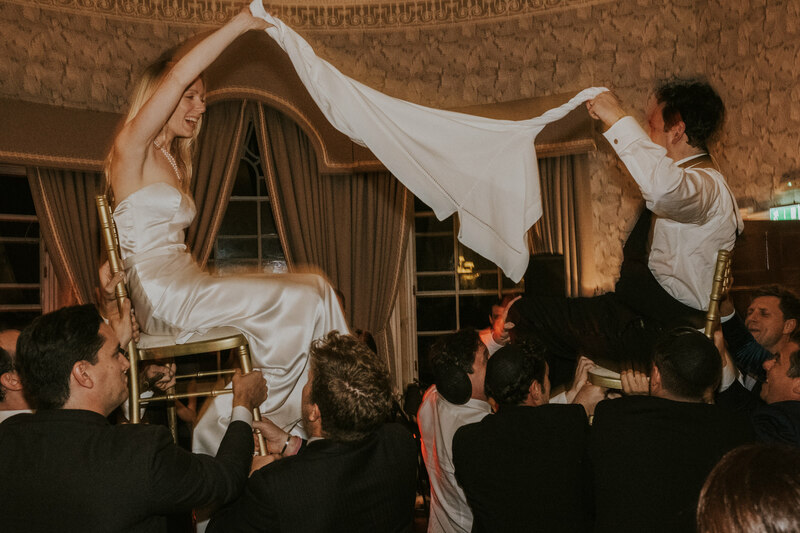 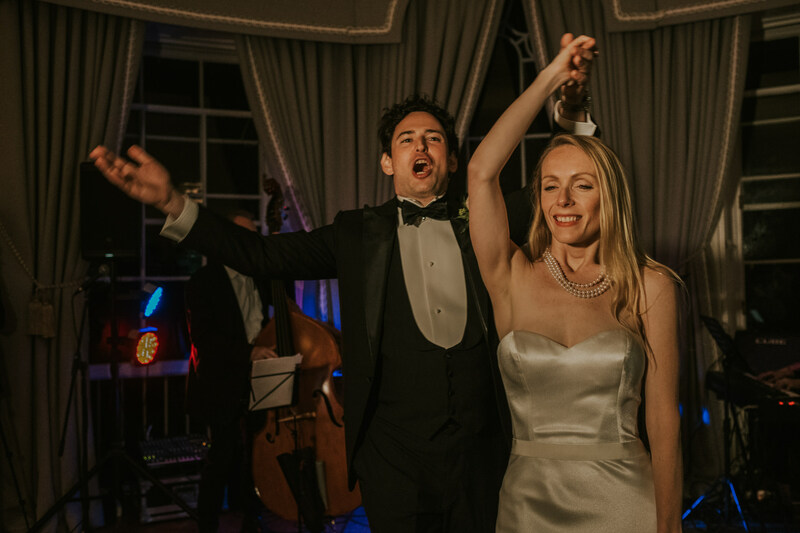 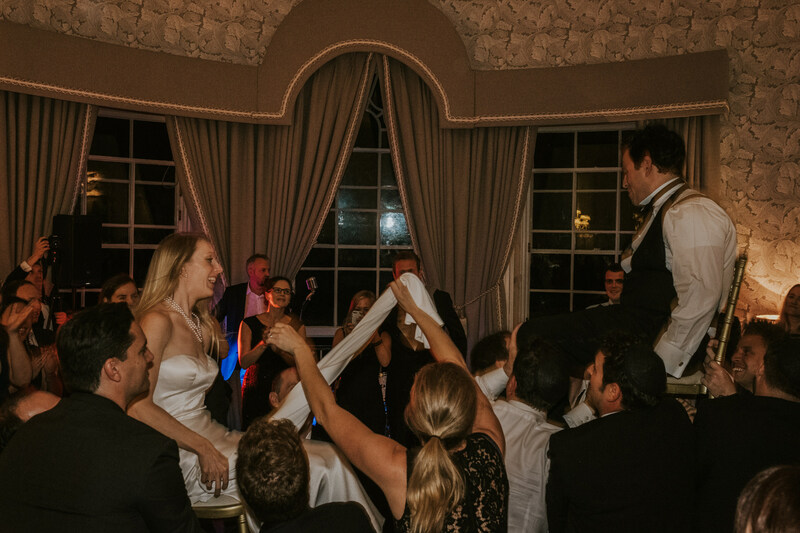 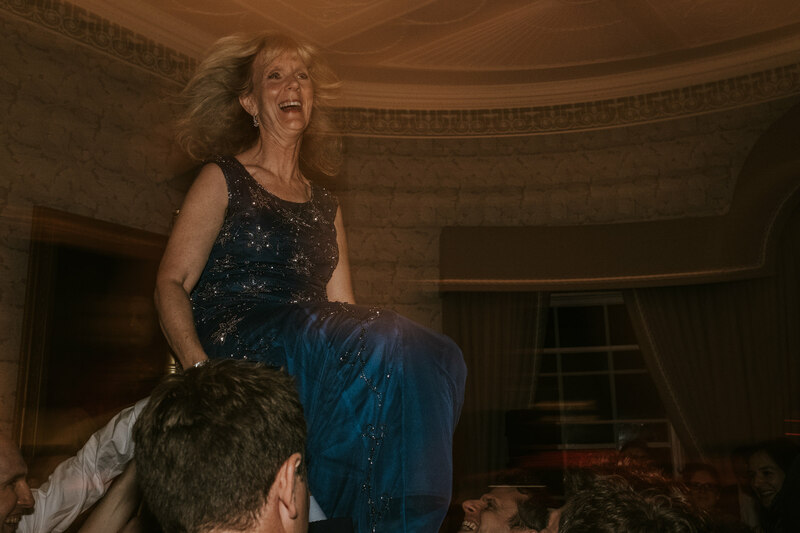 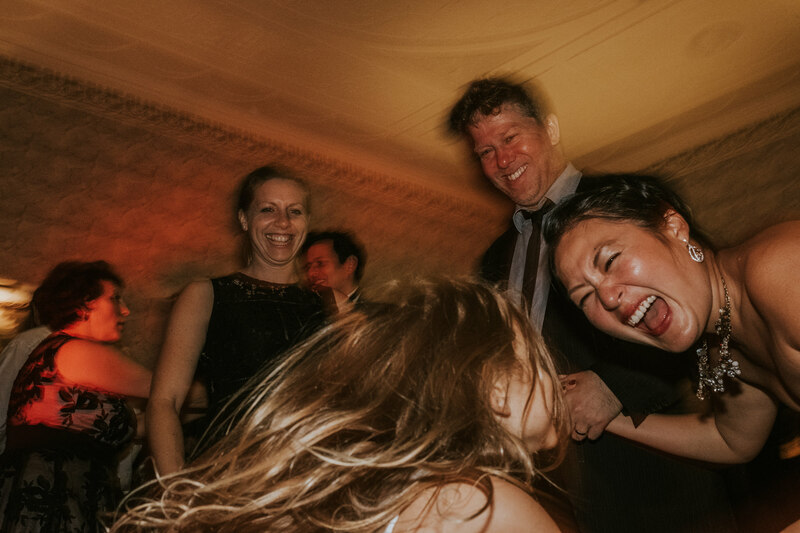 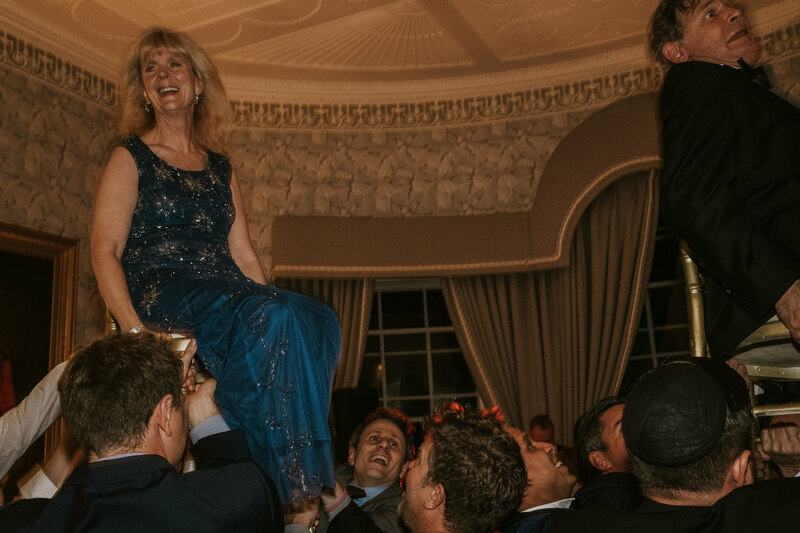 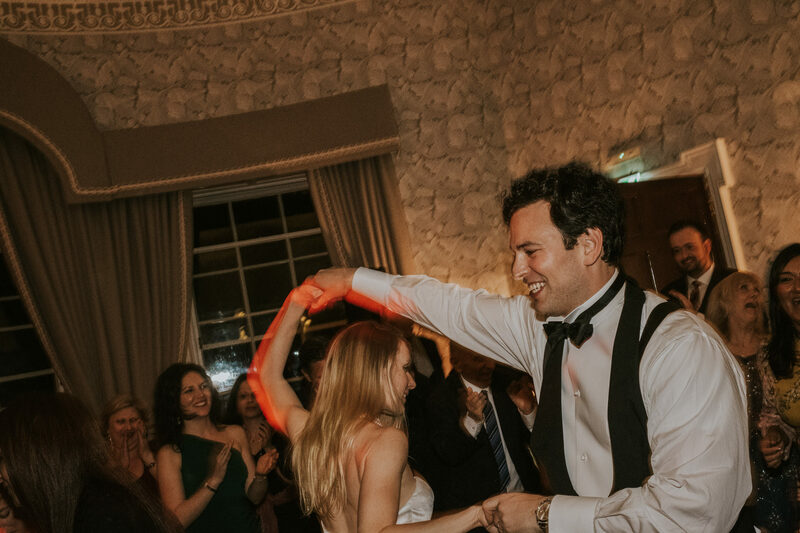 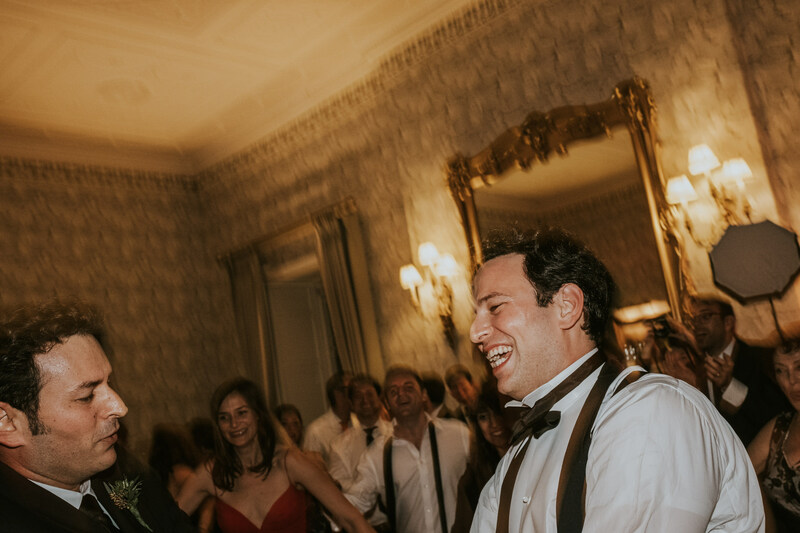 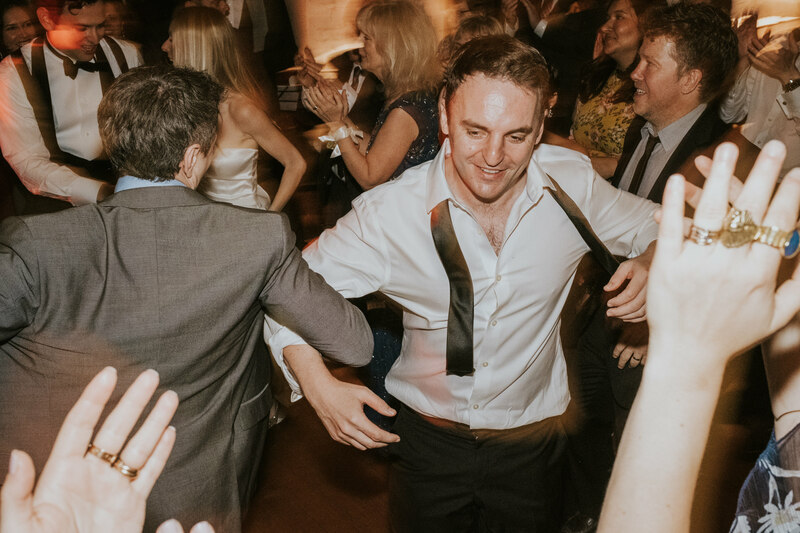 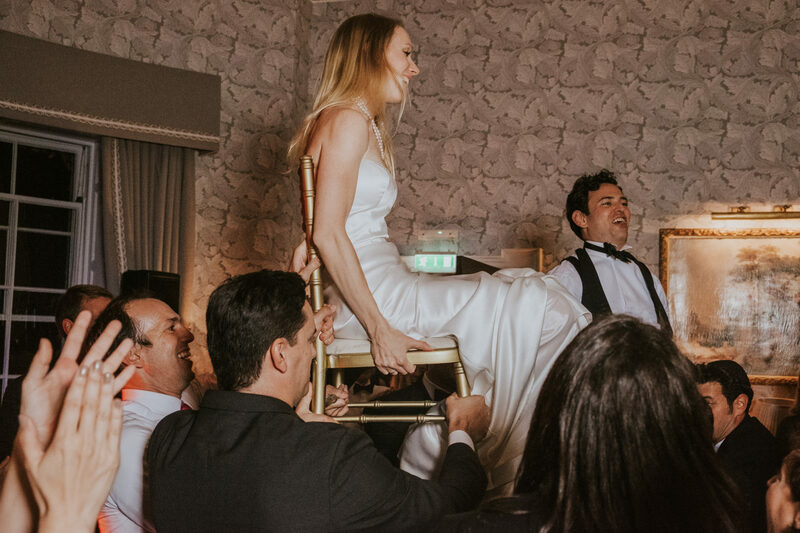 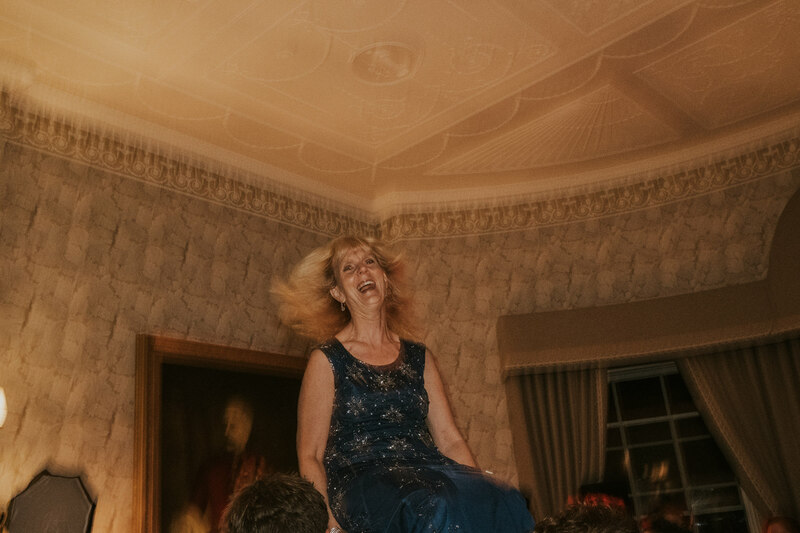 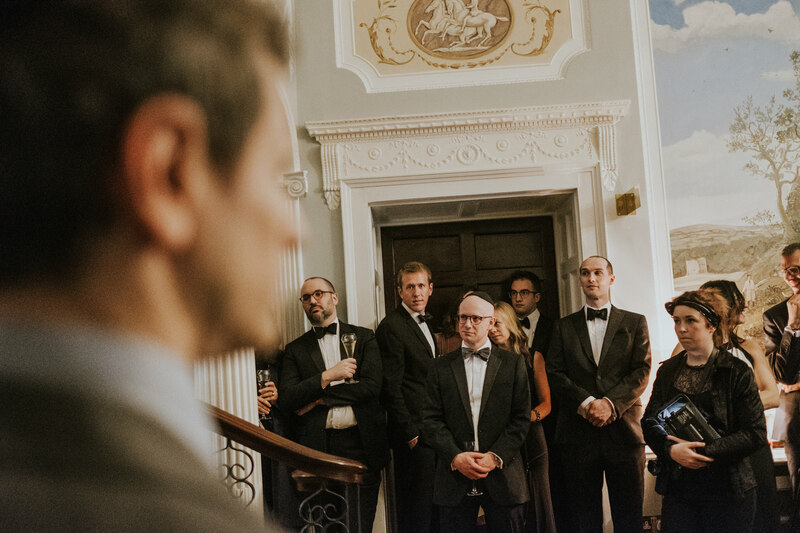 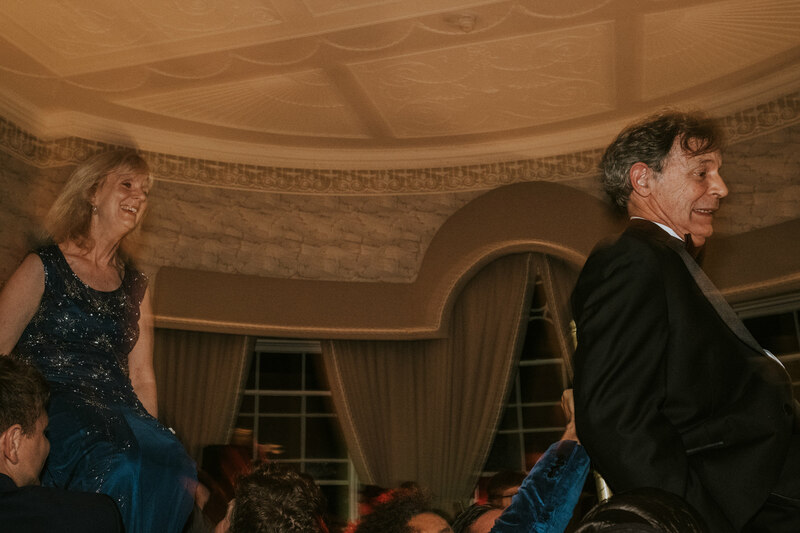 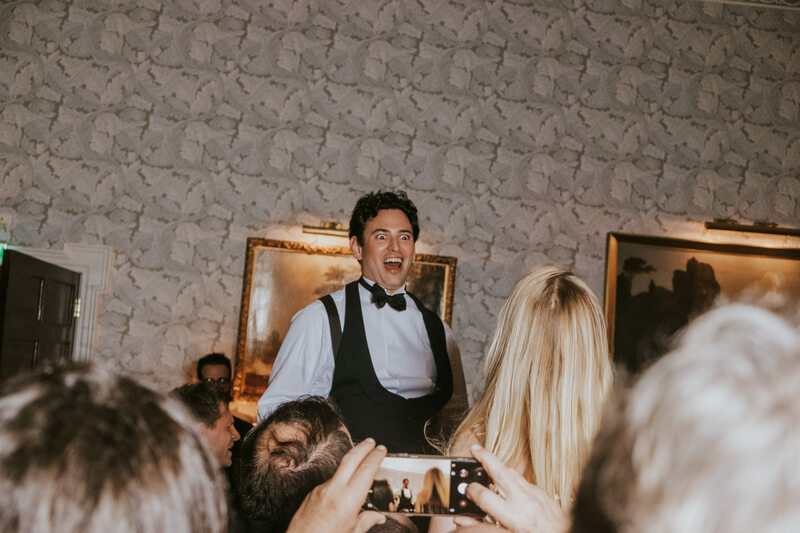 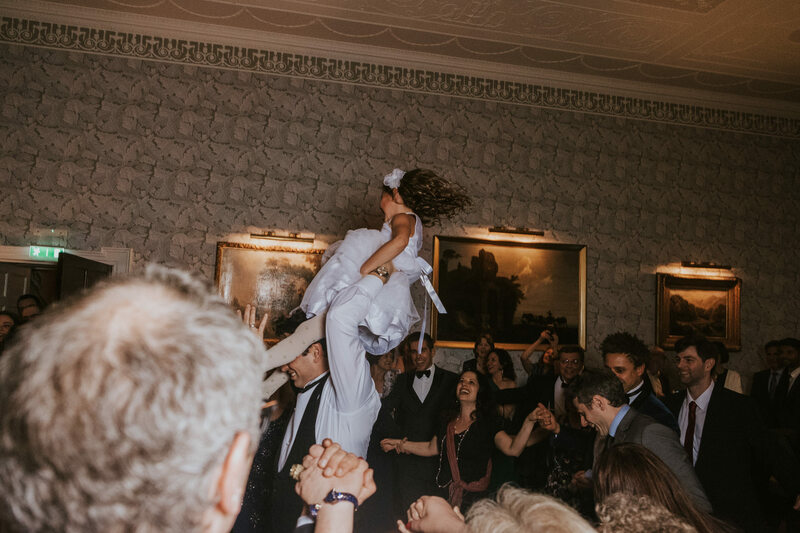 Part of the traditional Jewish wedding is to dance the horah in a circle around the Bride and Groom, who are hoisted in the air on a pair of chairs. 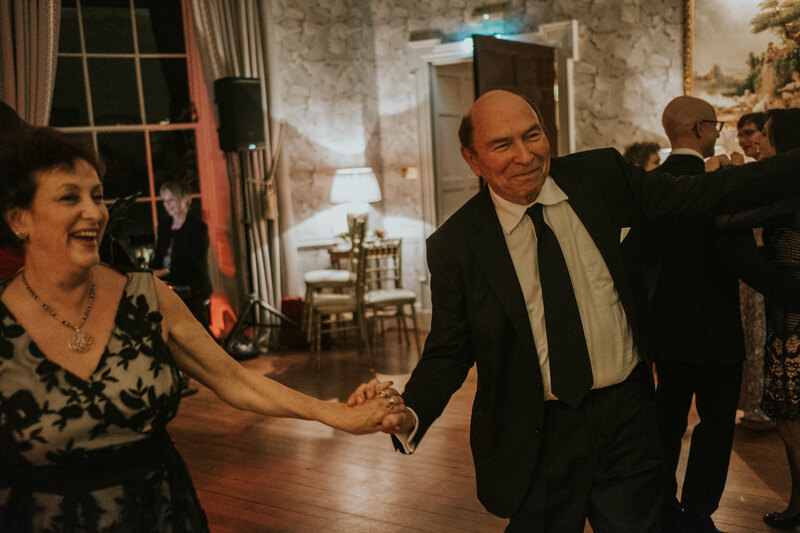 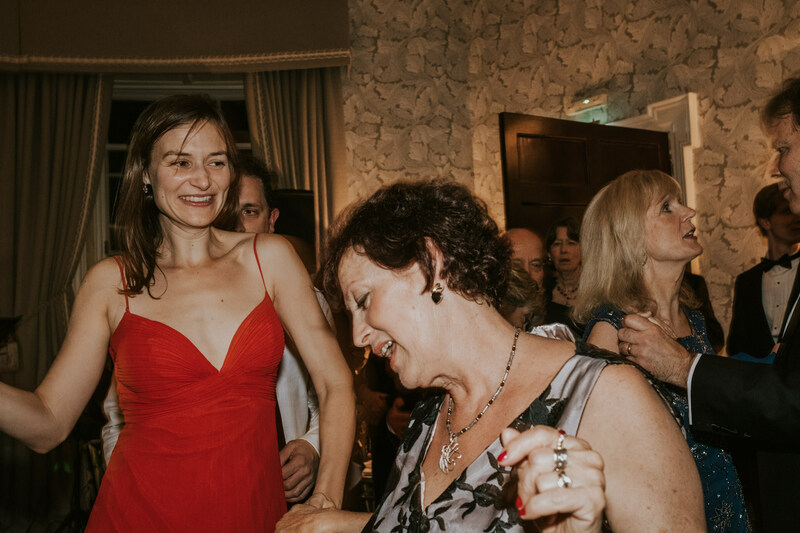 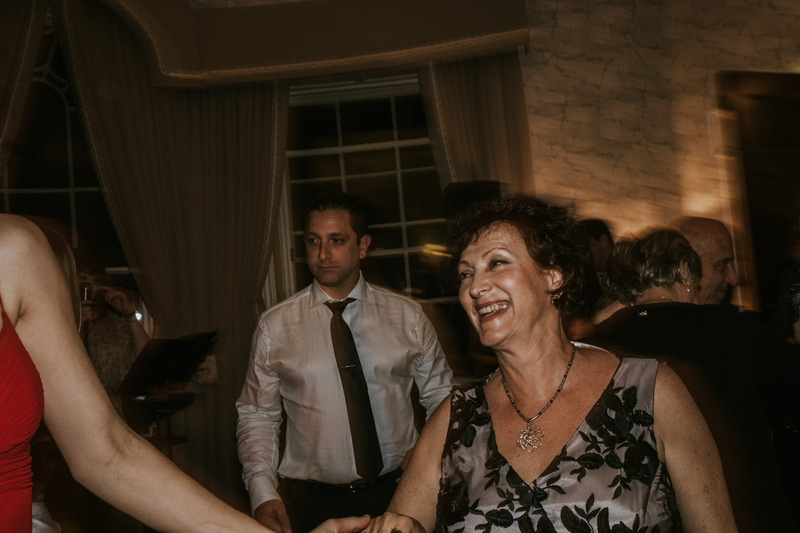 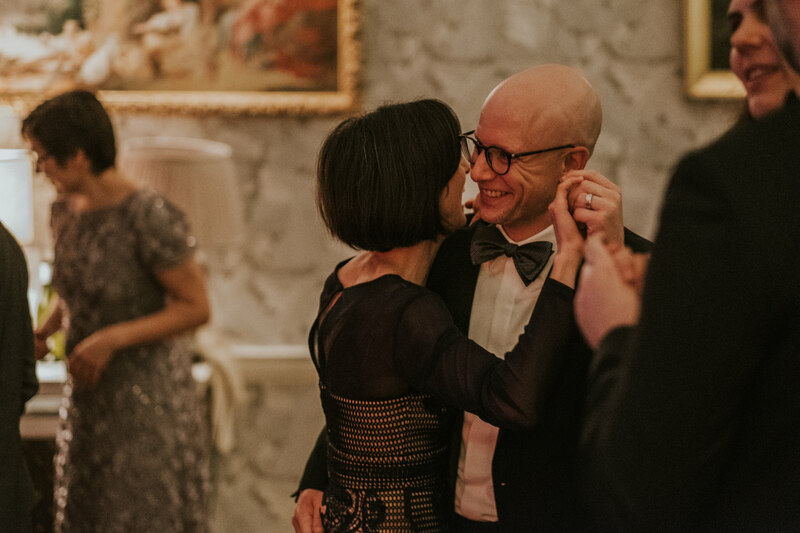 The guests then included both sets of parents in this dance and, though the bride’s parents aren’t Jewish, they both, after a teetering start, fell in with the flow of this celebratory dance. 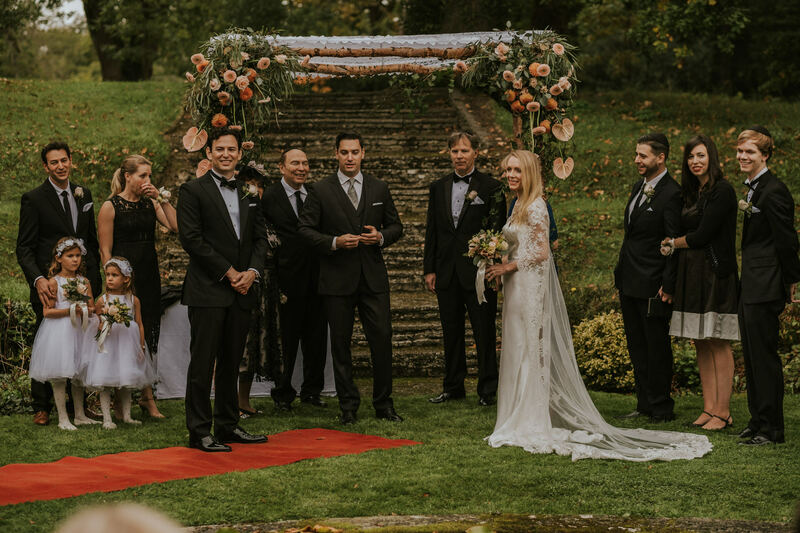 This was a day filled with so much love, laughter and joy. 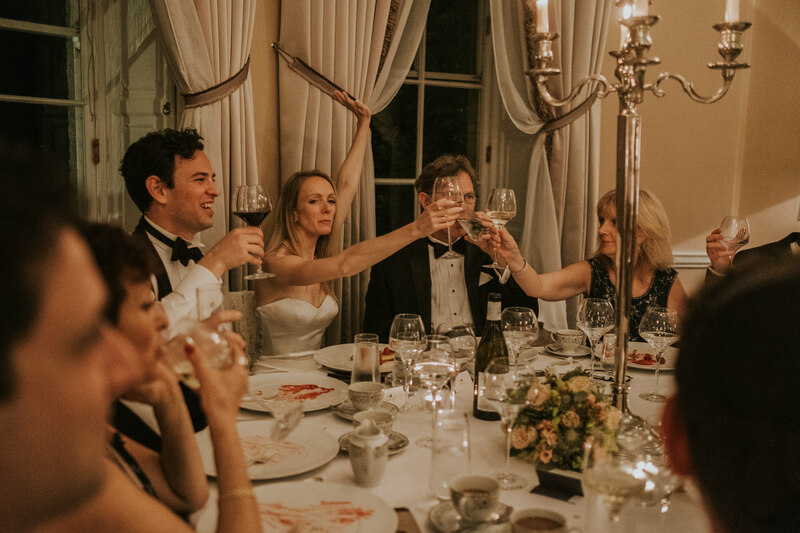 One part of the ceremony which I enjoyed the most, was the breaking of the glass. 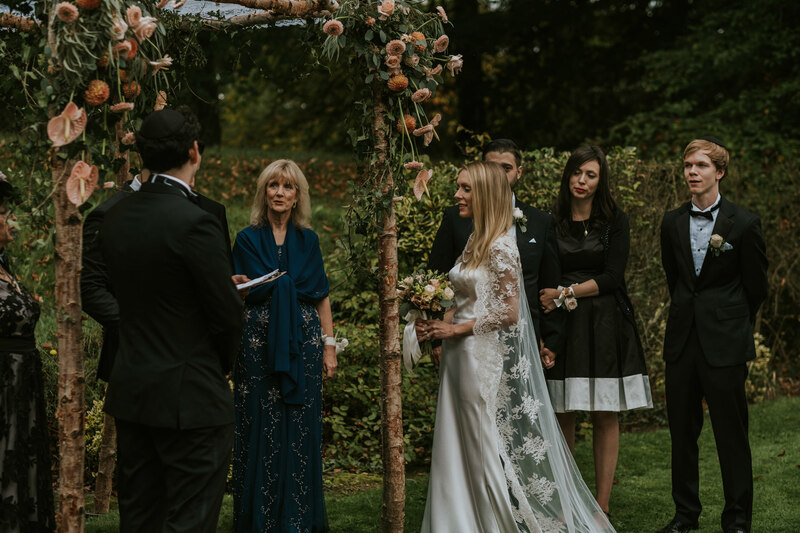 There are many stories told around this particular tradition, but one, in particular, stood out in my mind. 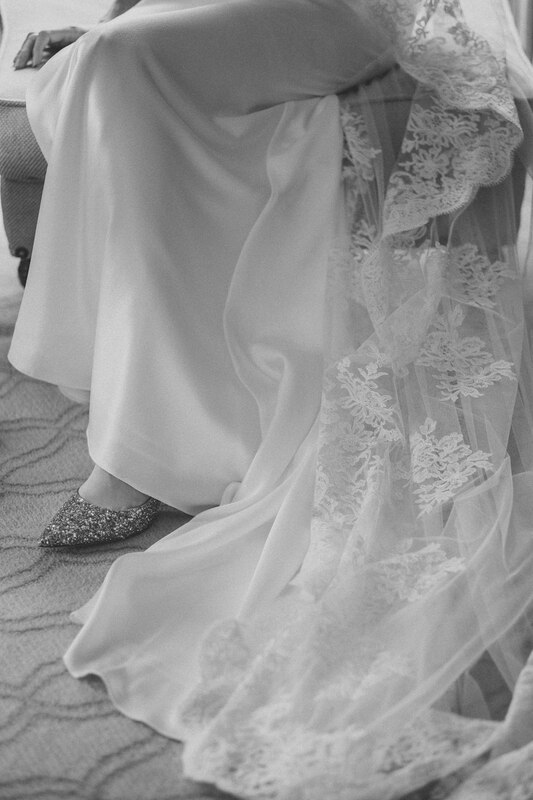 Before you are born, you and your soulmate were a single soul living with God. 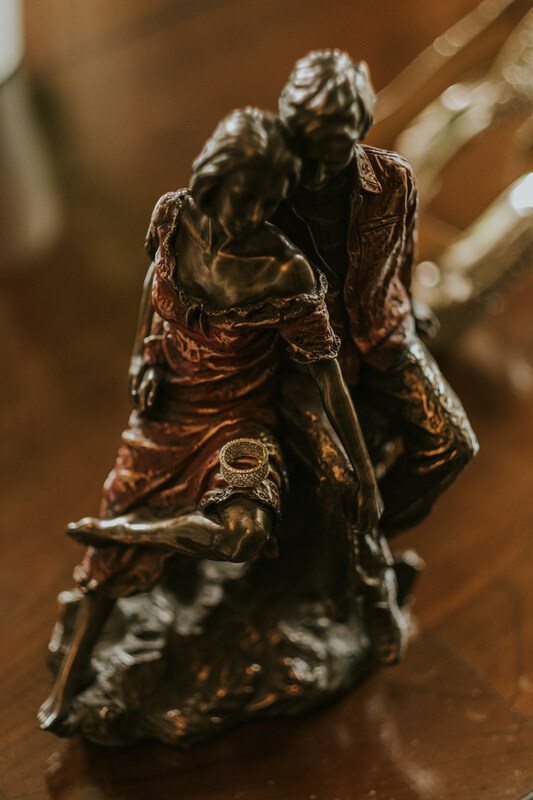 As the time came to enter earth, God shattered the soul dividing it into two and so the split souls where born into completely different lives. 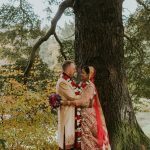 Whilst living their lives and gaining earthly experience, it is always the mission of these divided souls to find each other again. 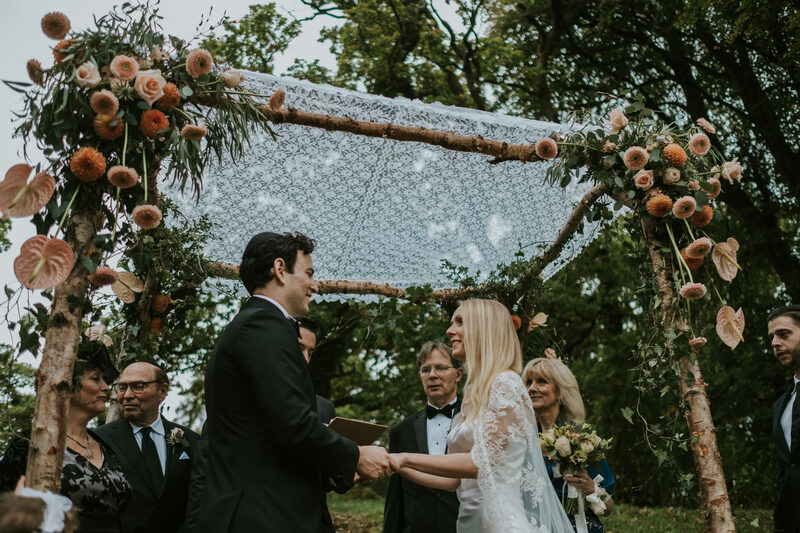 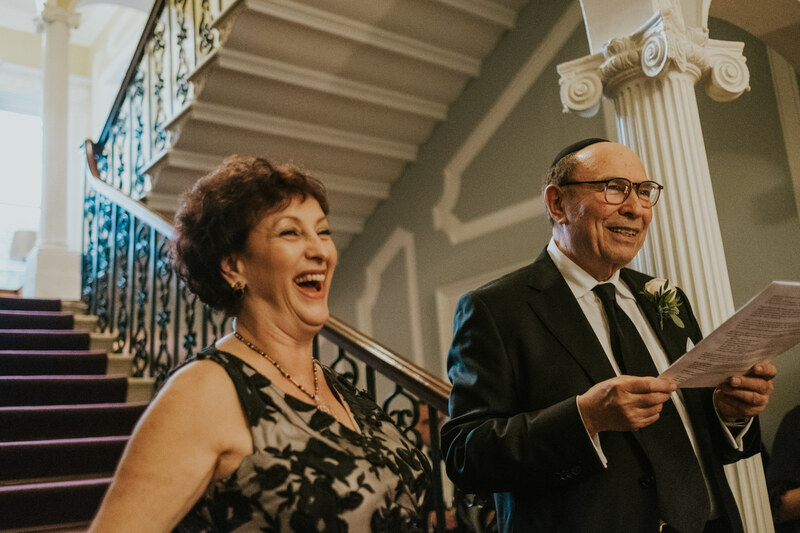 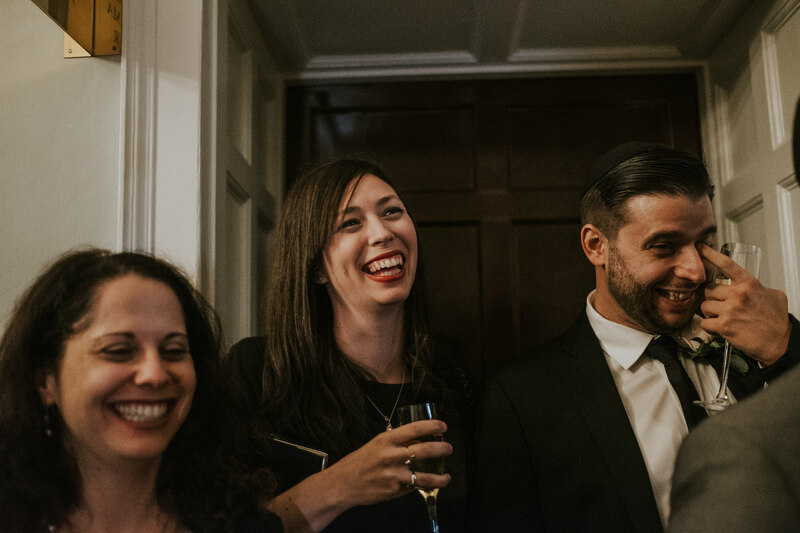 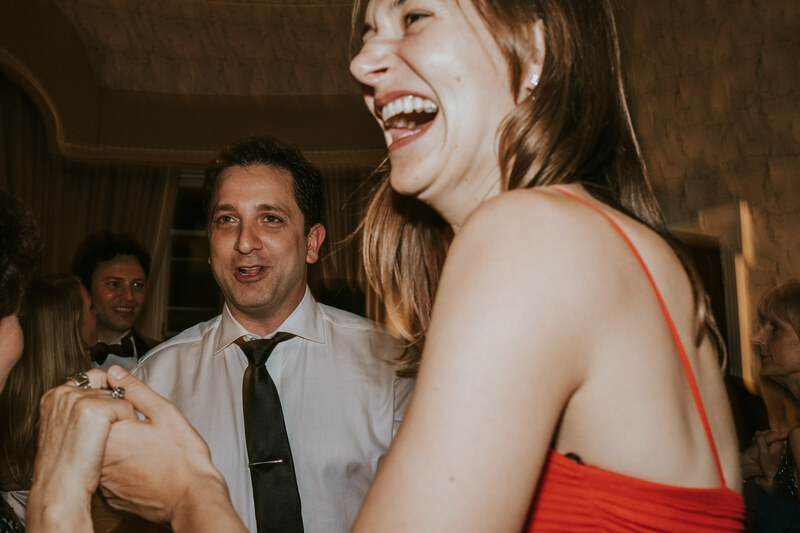 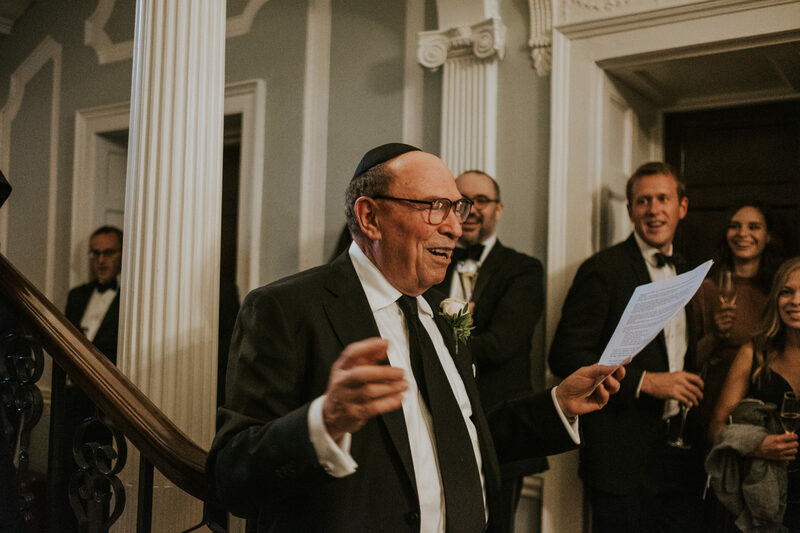 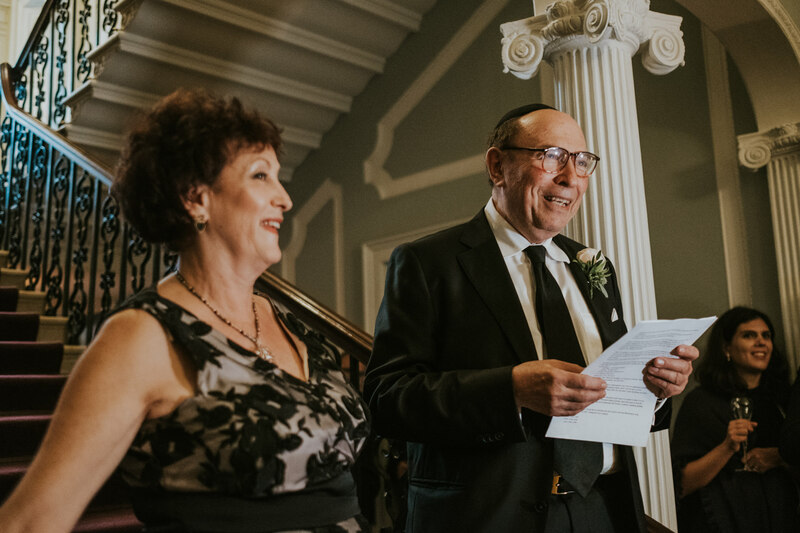 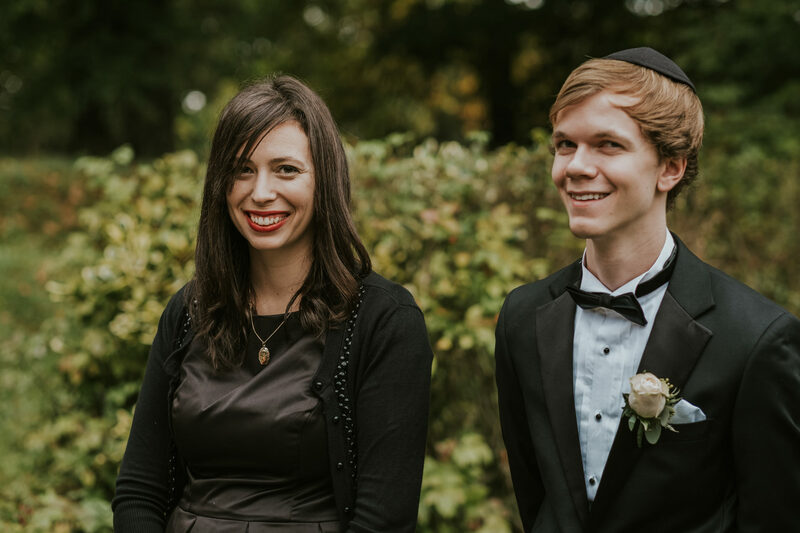 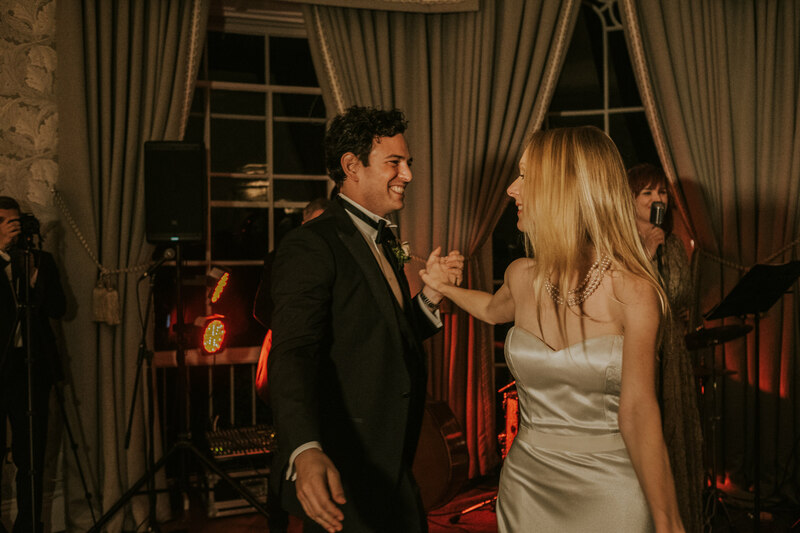 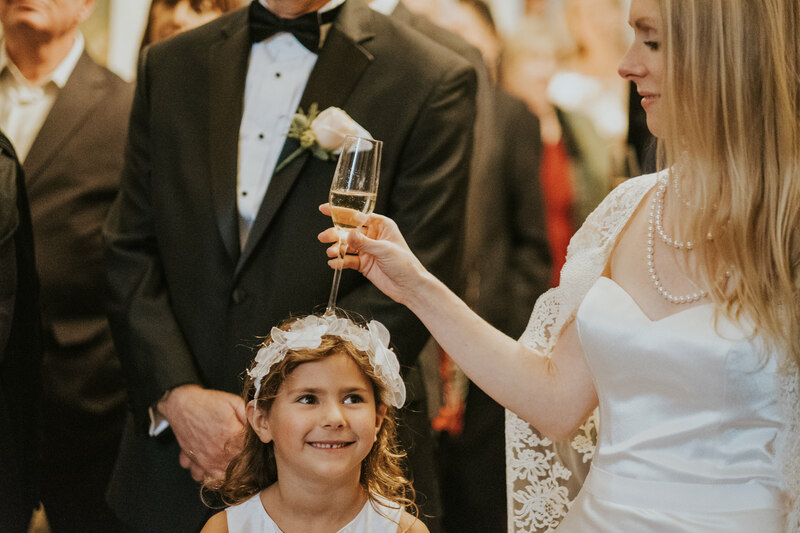 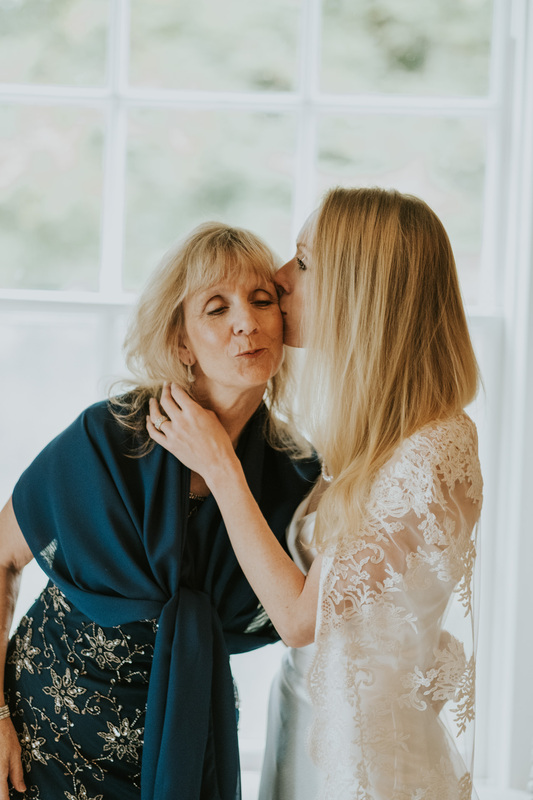 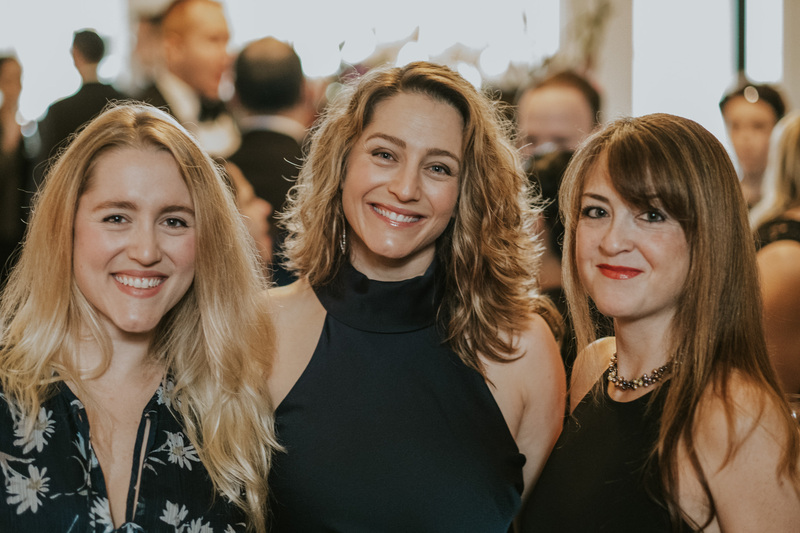 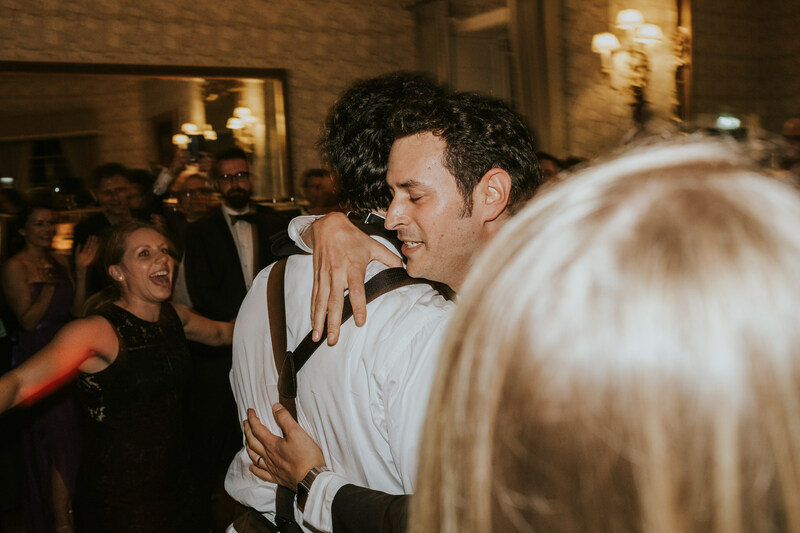 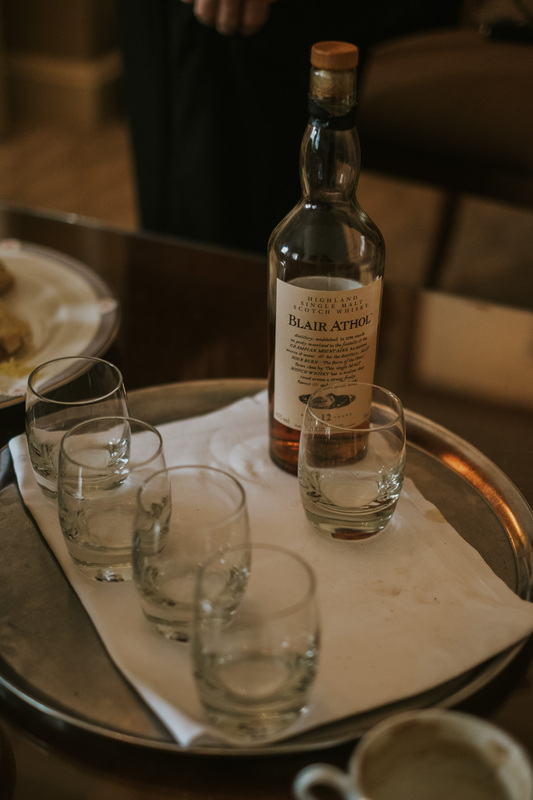 When finally, the soulmates rediscover each other, they celebrate this reunion through marriage and this is when under the Chuppah, God’s plan becomes clear. 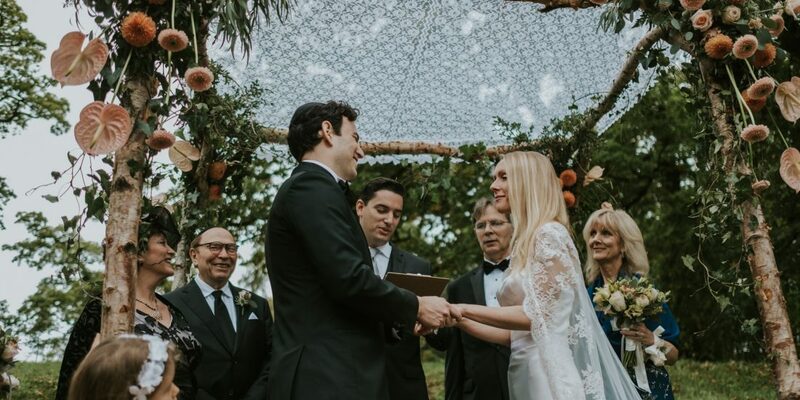 Now you understand how splitting your souls is the reason to celebrate, as it gave your connection and reunion a possibility for a much higher and deeper love. 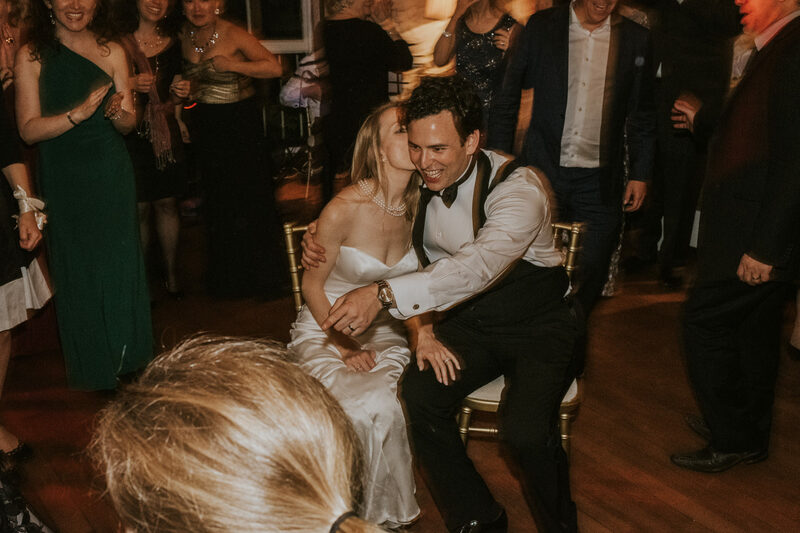 And so, Sarah and Michael are truly a match made in heaven. 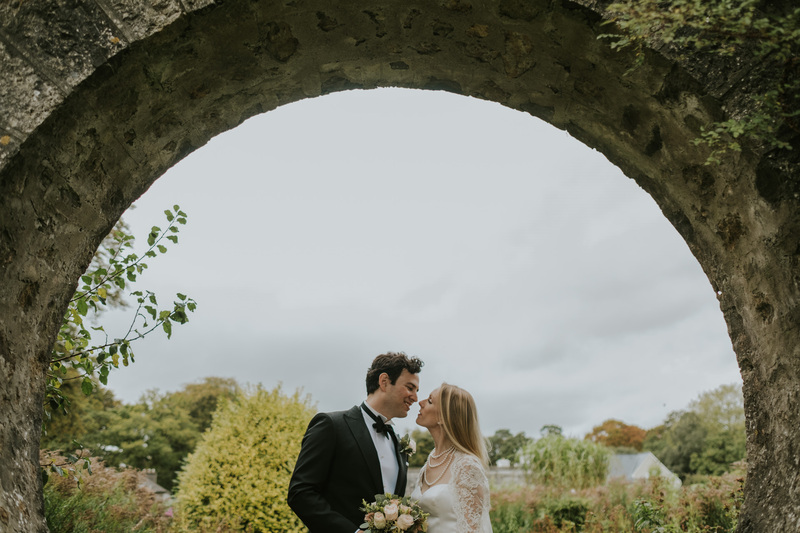 Congratulations again Sarah & Michael, it was such a pleasure being involved in your wedding.